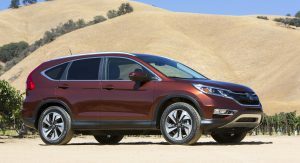 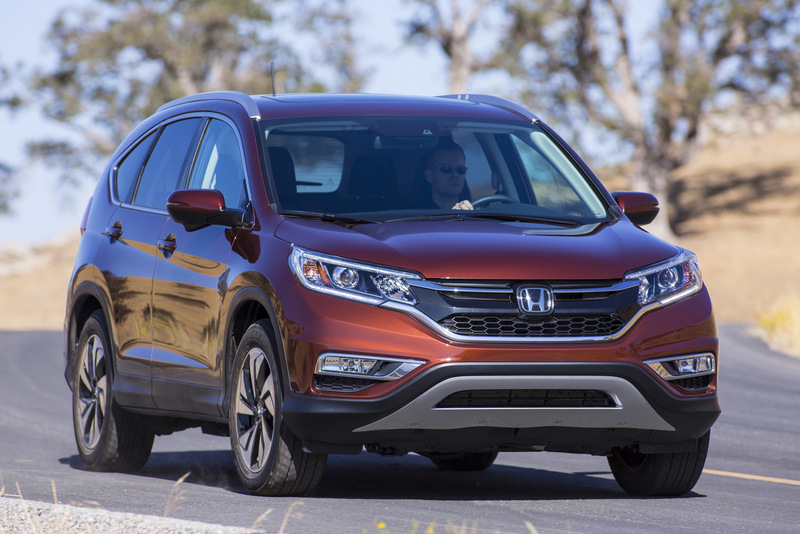 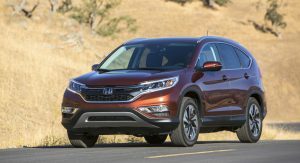 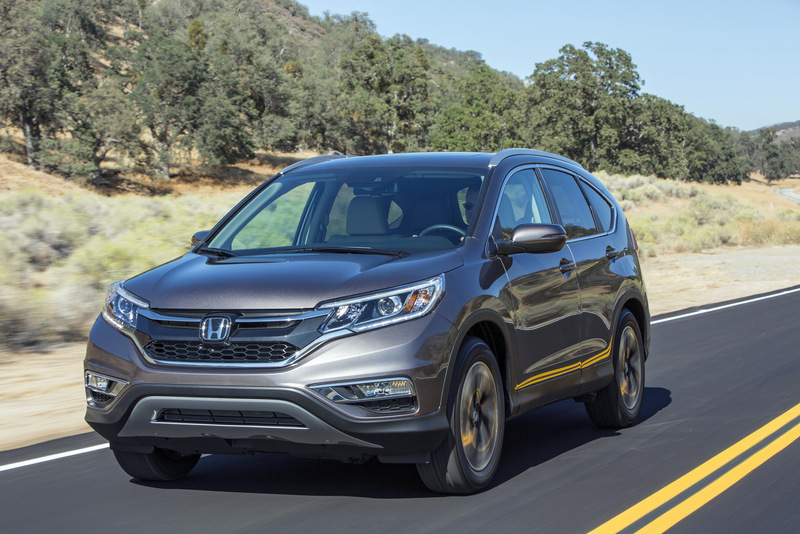 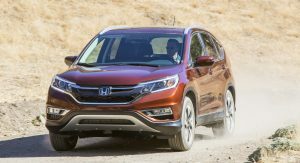 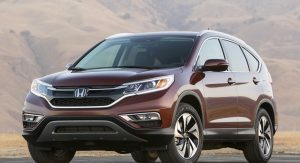 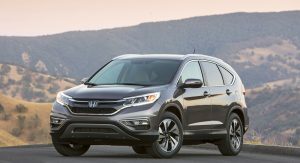 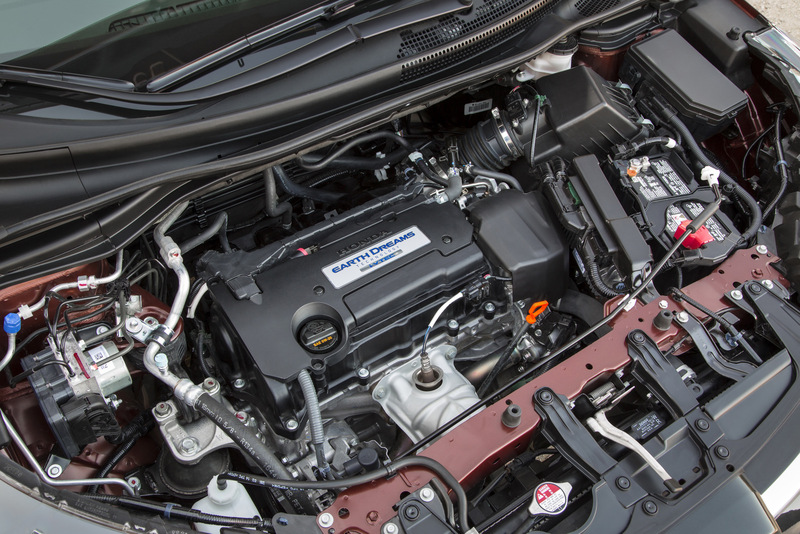 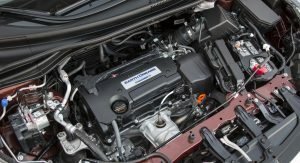 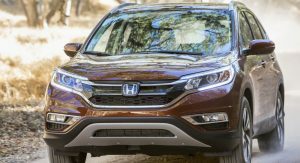 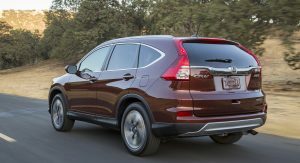 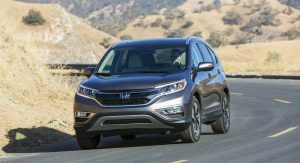 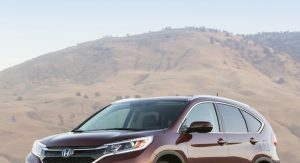 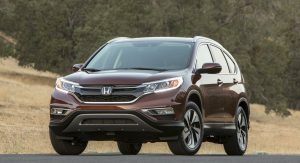 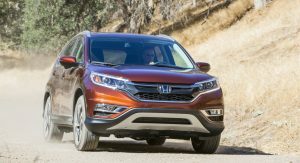 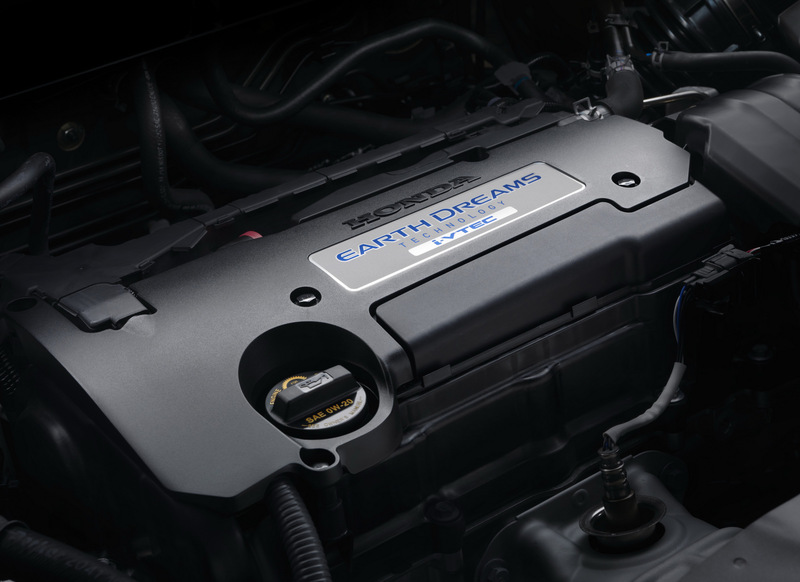 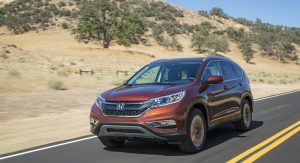 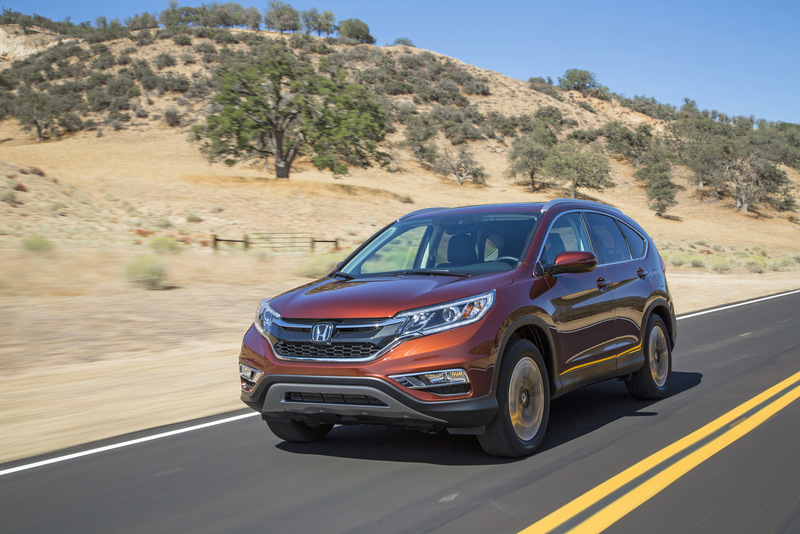 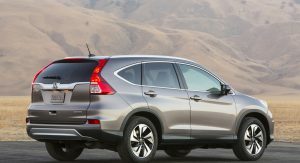 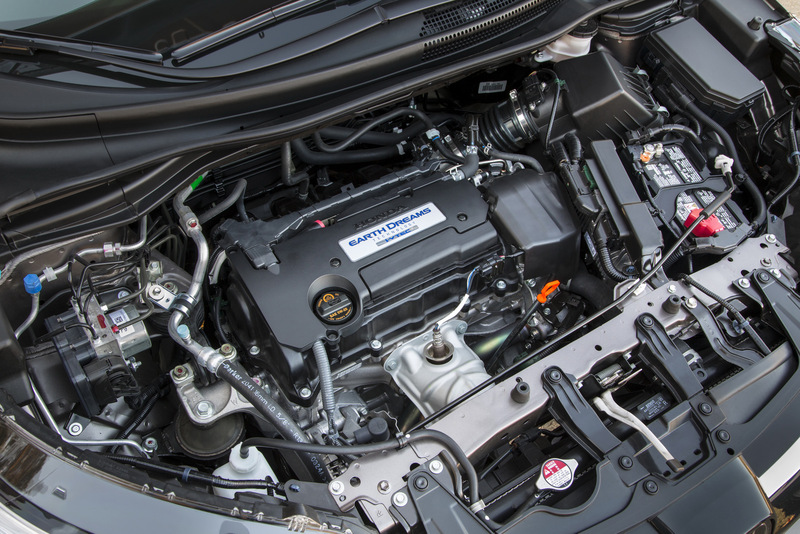 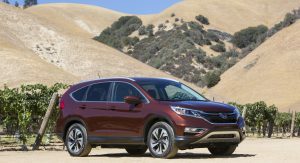 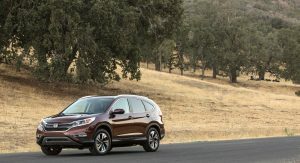 Honda has released full details on its updated 2015 CR-V for the US market, with the big news being the heavily revised 2.4-liter i-VTEC engine that produces 11 percent more torque. 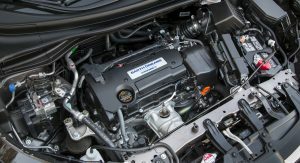 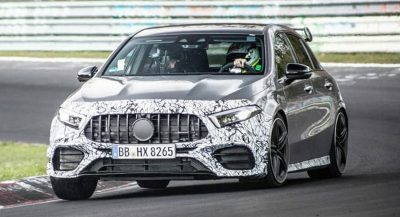 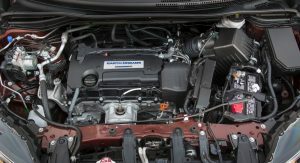 The four-cylinder gasoline unit continues to produce 185 hp, but peak torque is up from 163 lb-ft (220 Nm) to 181 lb-ft (245 Nm). 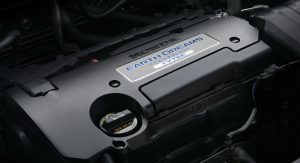 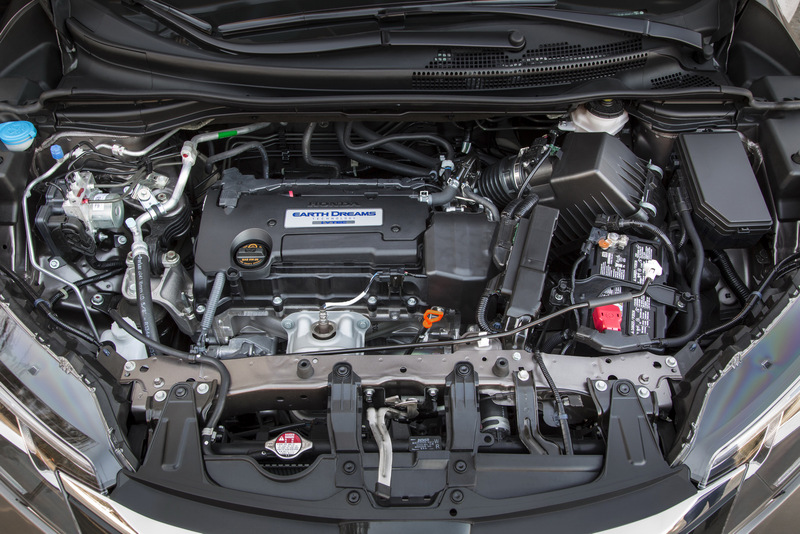 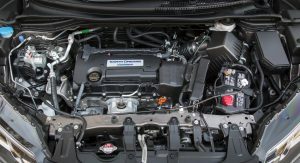 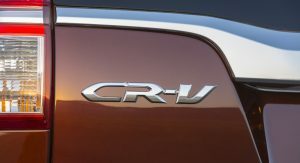 Thanks to a new continuously variable transmission (CVT) with G-design Shift, the engine returns increased EPA fuel economy ratings of 27/34/29 mpg (city/highway/combined) for front-wheel-drive models and 26/33/28 mpg for the Real Time AWD models. 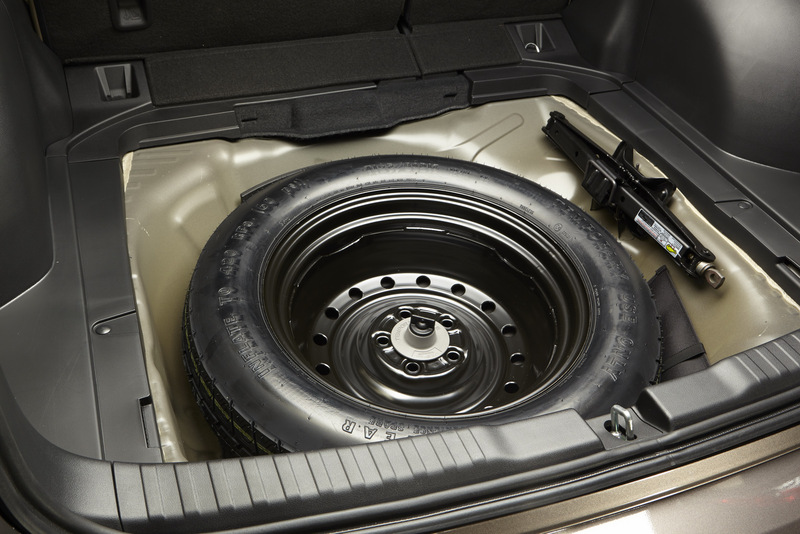 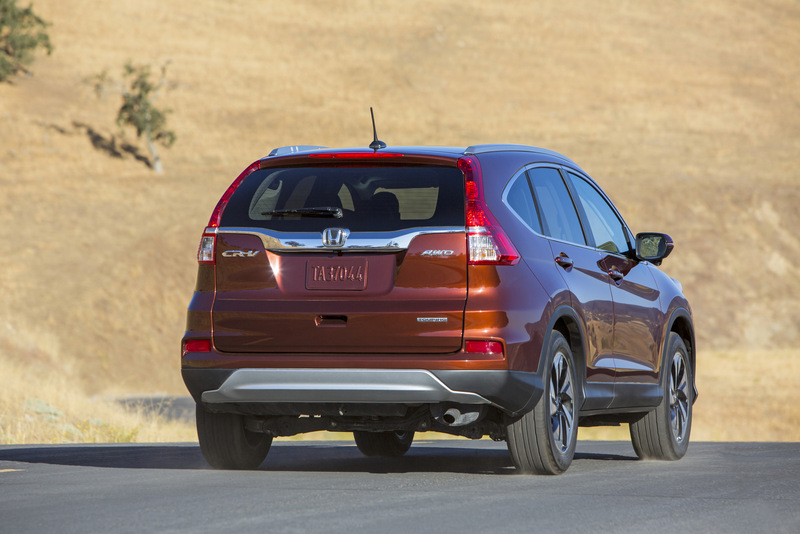 Both ratings are improved by 4/3/3 mpg over 2014 models. 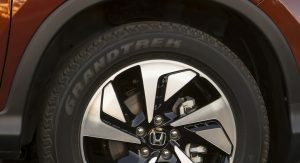 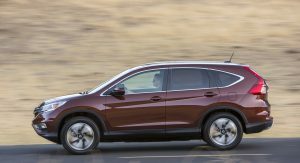 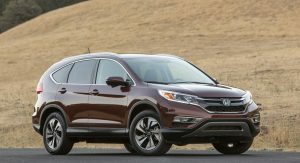 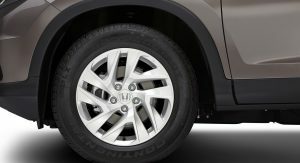 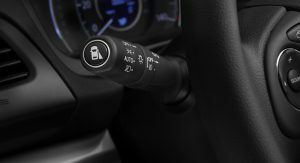 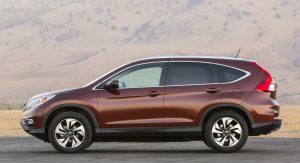 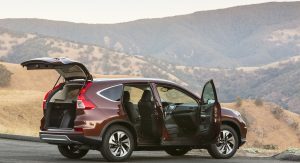 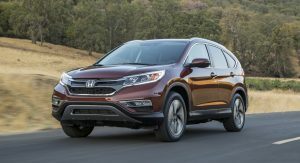 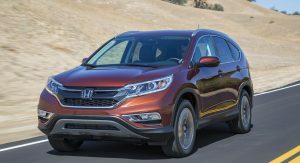 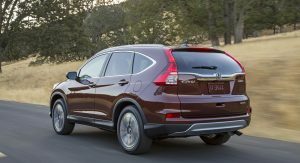 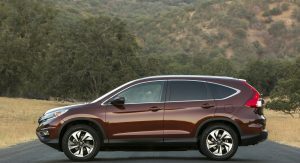 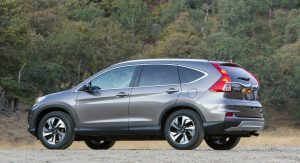 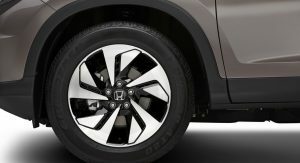 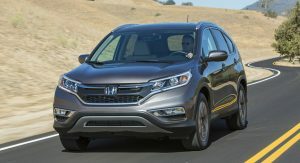 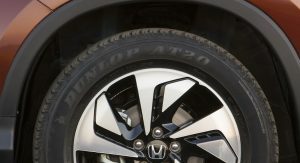 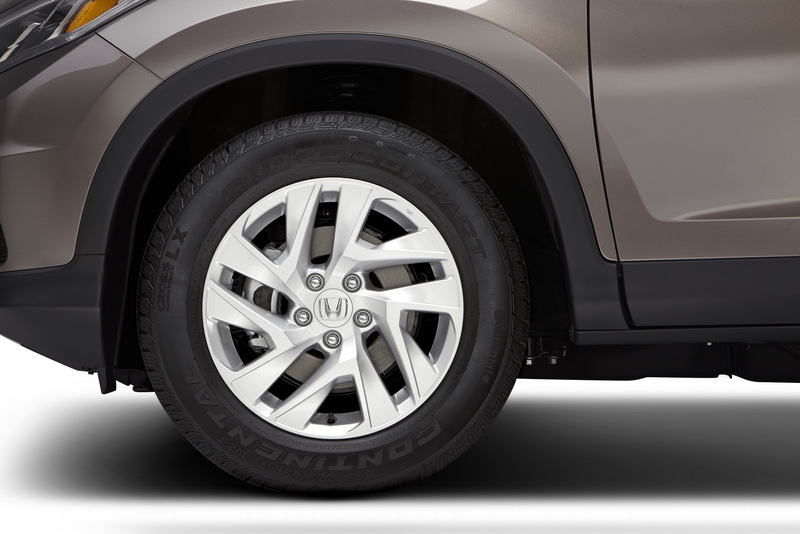 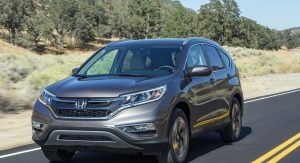 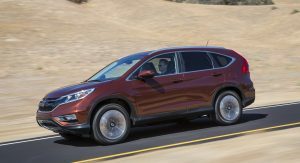 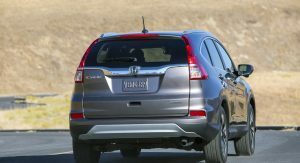 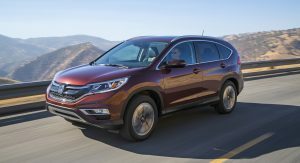 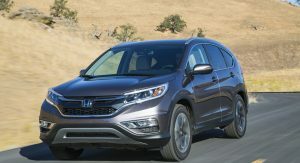 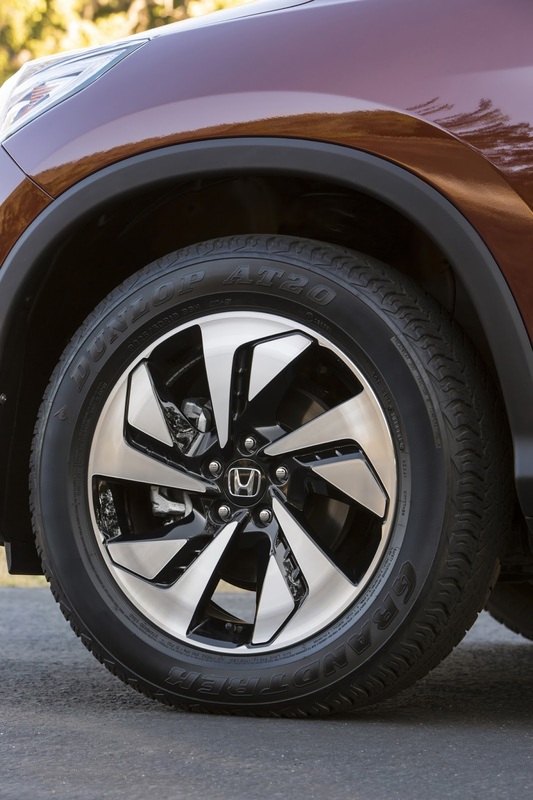 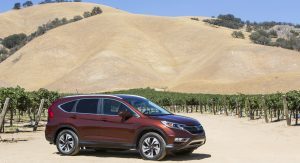 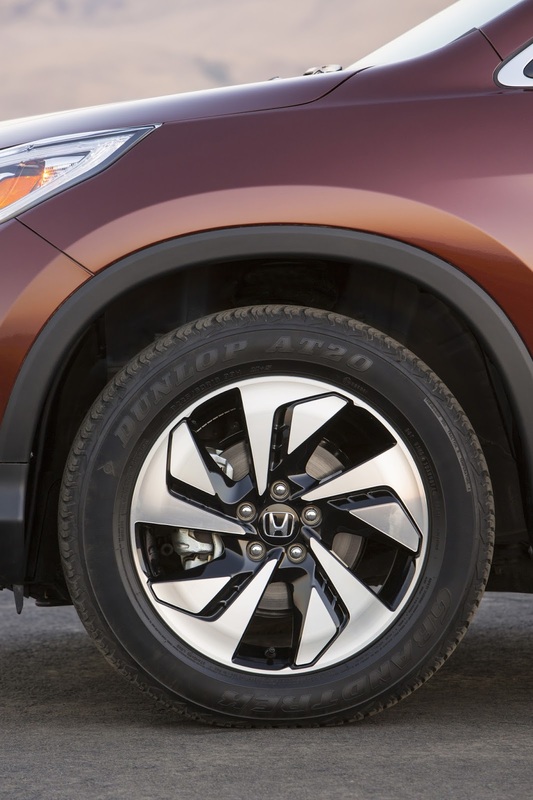 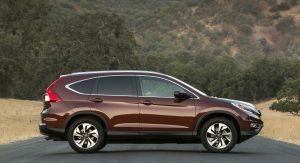 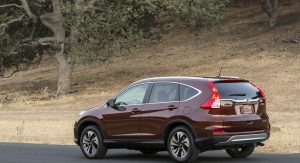 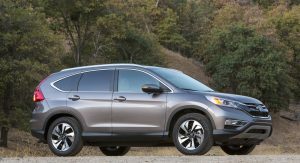 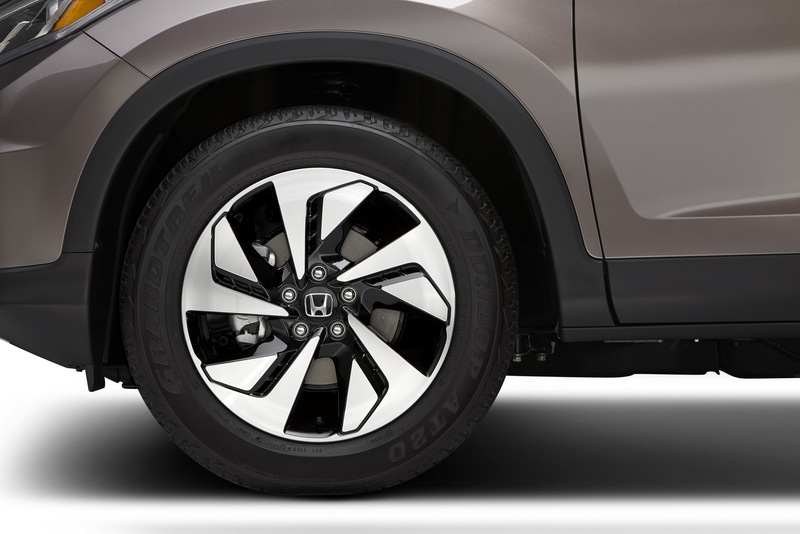 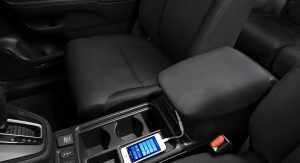 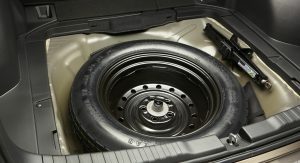 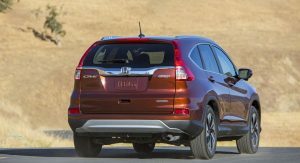 Honda says it has also updated the CR-V’s suspension design, with features such as Vehicle Stability Assist (VSA) and Motion-Adaptive Electric Power Steering (EPS) contributing to the 2015 CR-V’s quality driving experience, especially on EX and above trims which feature wider front and rear track dimensions due to wider wheels (+0.5 inches). 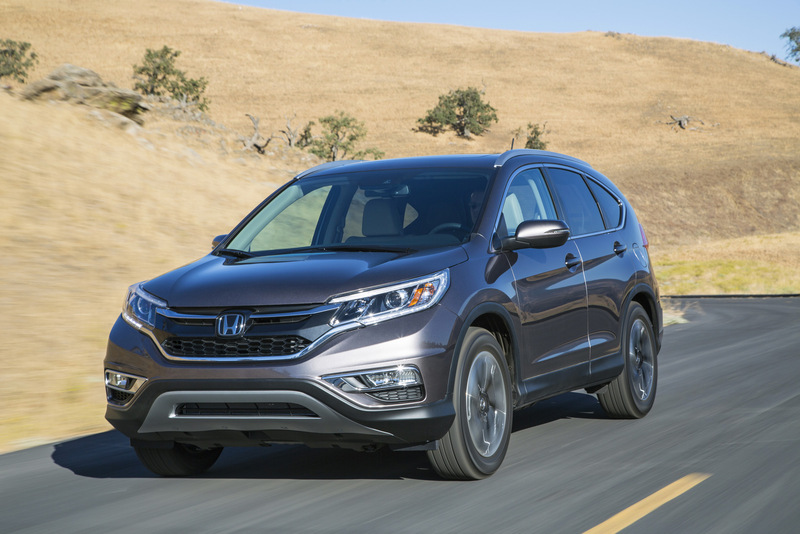 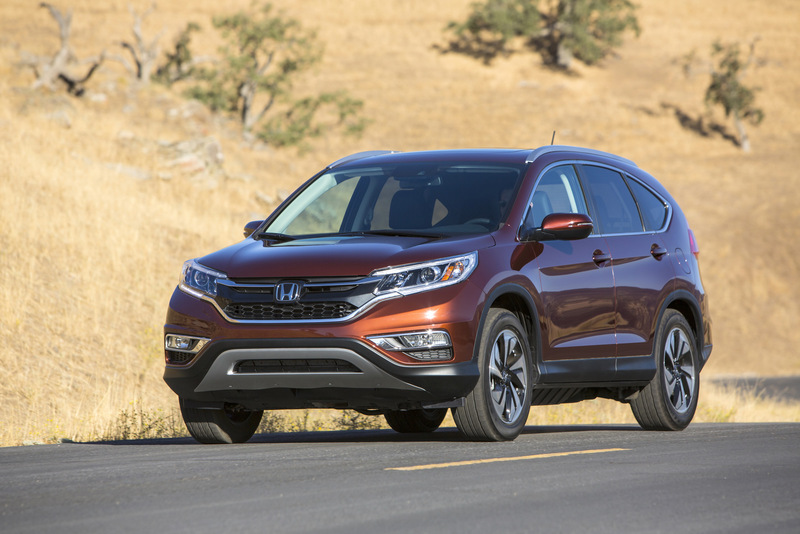 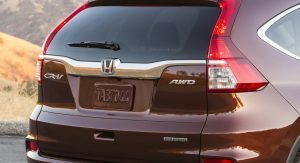 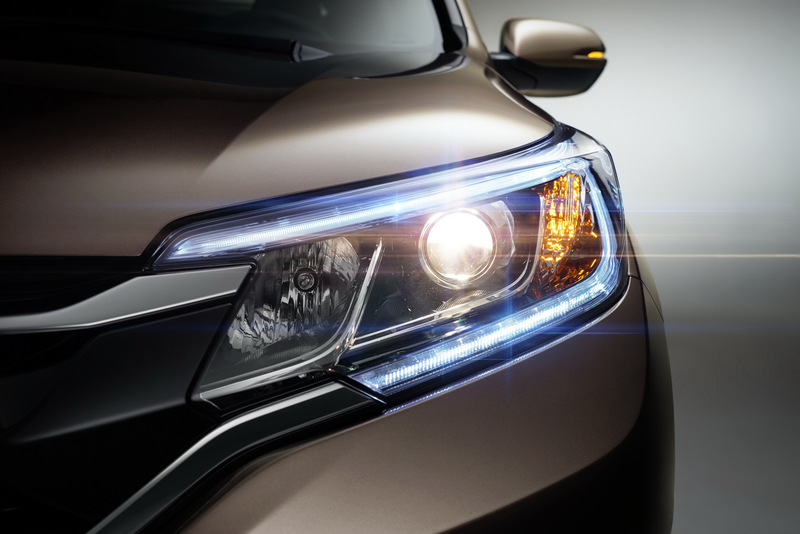 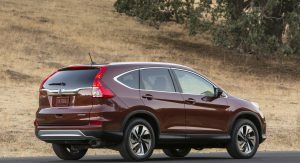 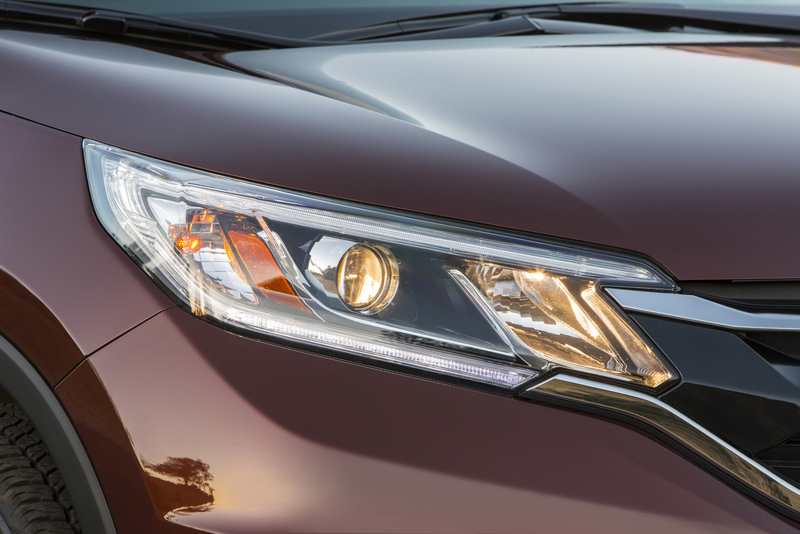 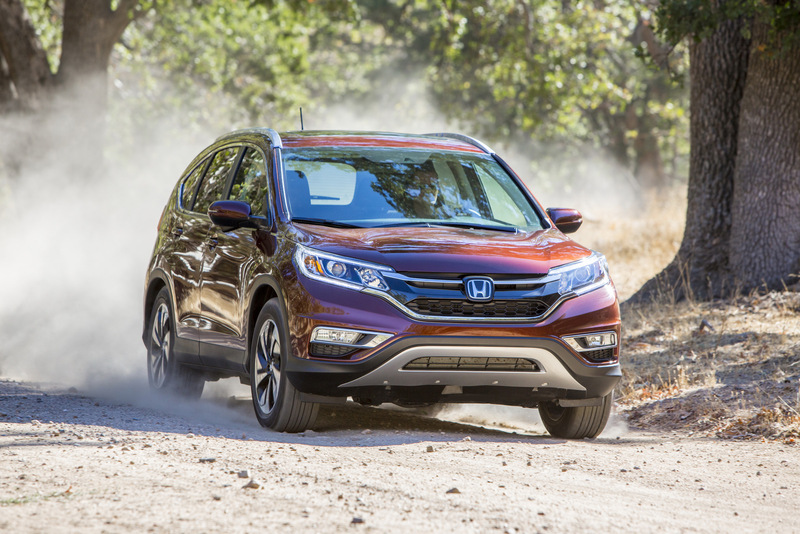 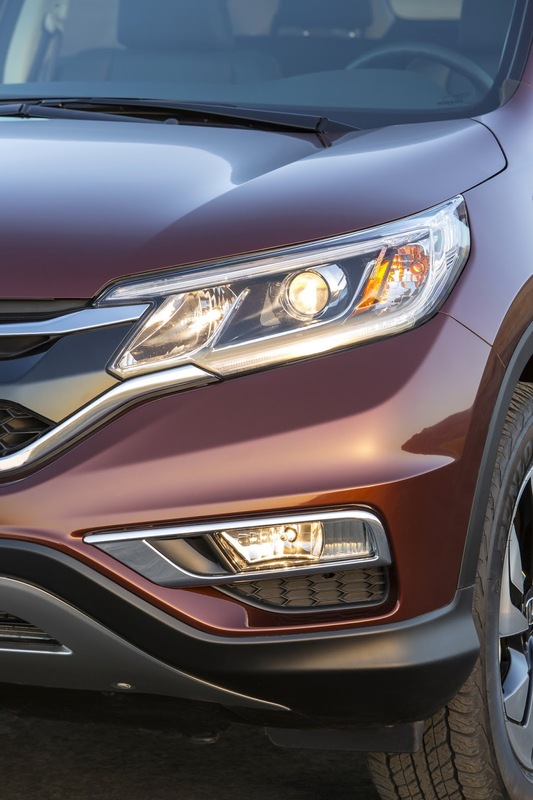 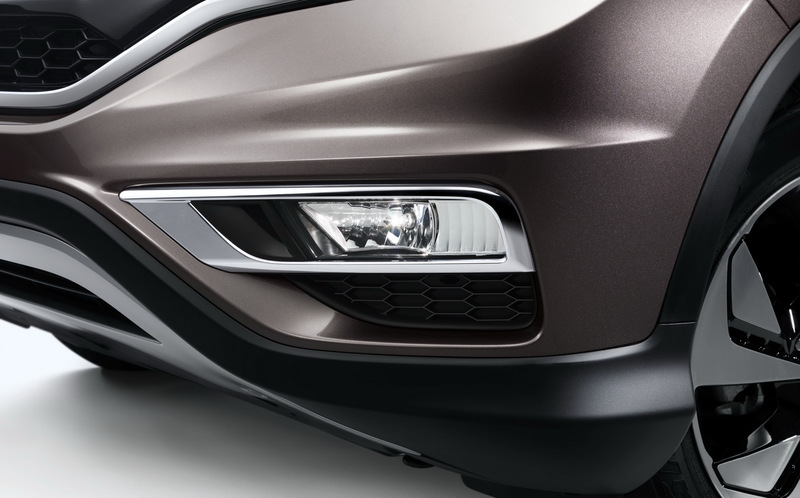 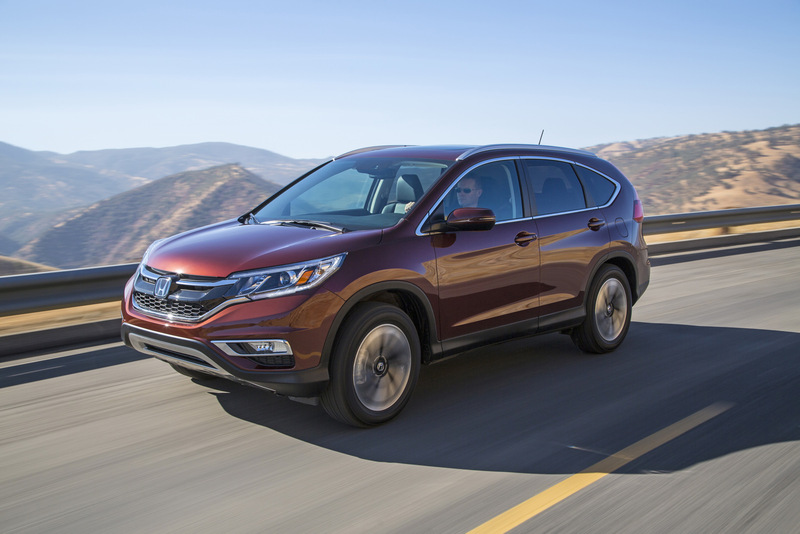 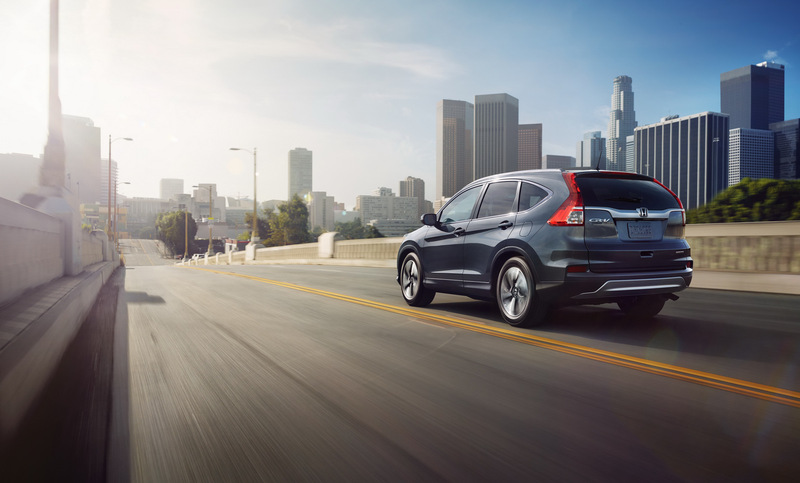 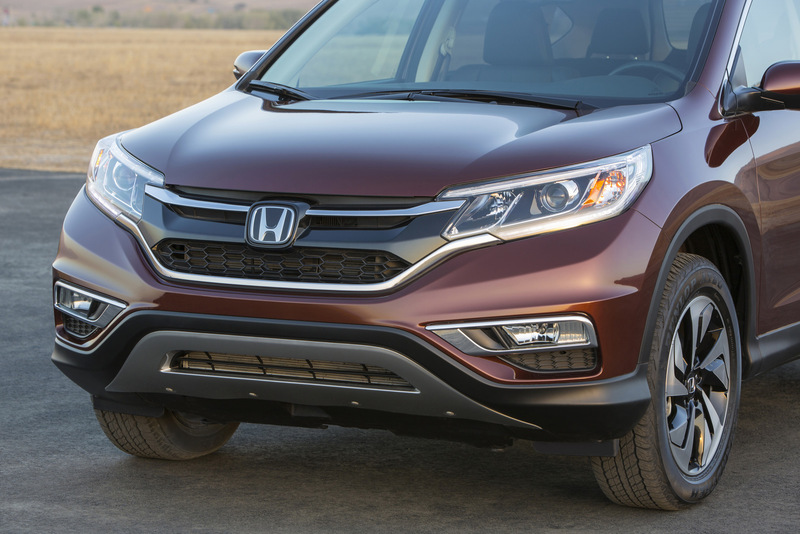 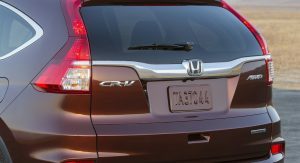 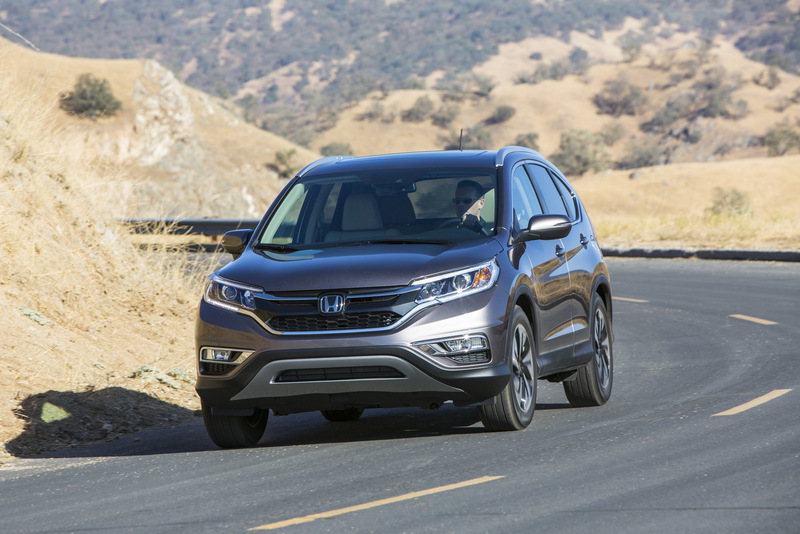 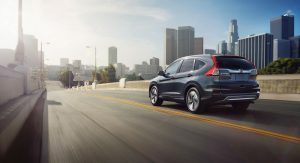 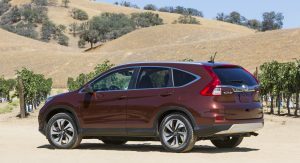 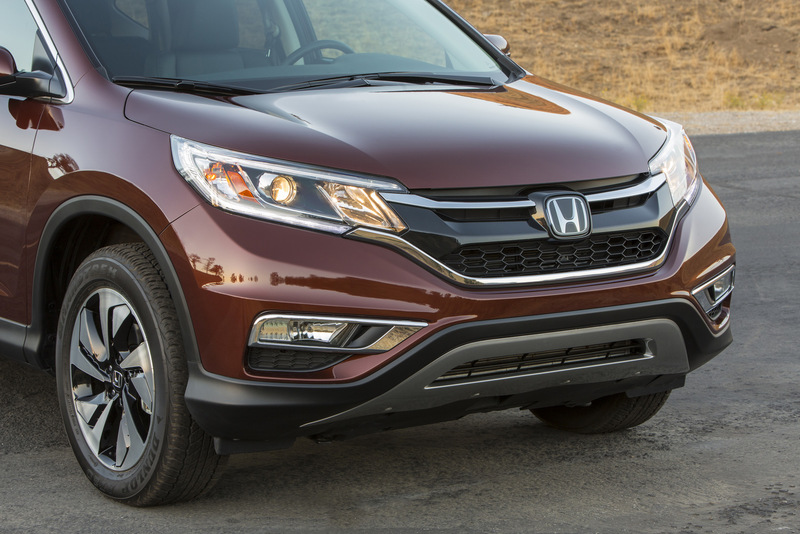 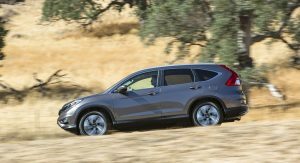 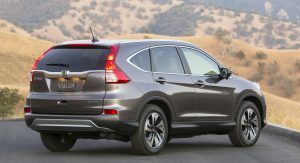 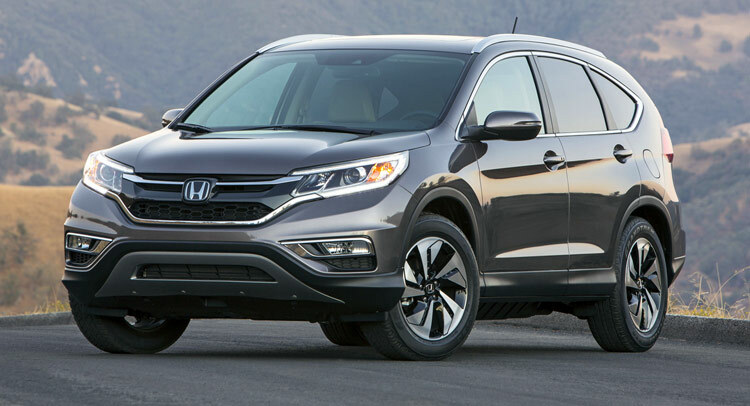 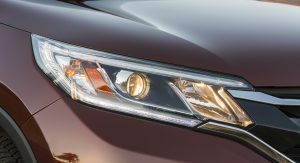 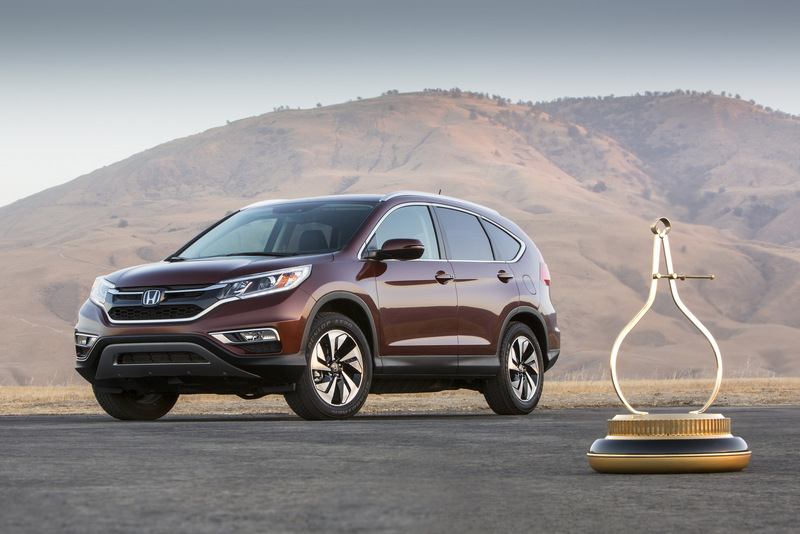 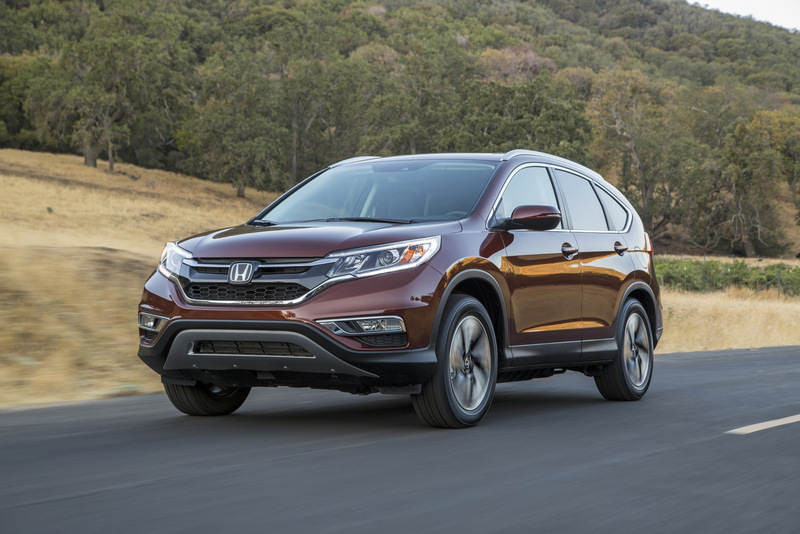 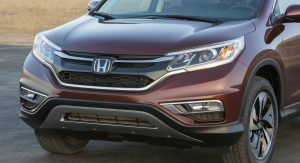 Styling-wise, the 2015 Honda CR-V gets a refreshed exterior appearance, with most changes operated at the front, where the redesigned bumper features new fog lamps and a different grille, while the headlights gain LEDs. 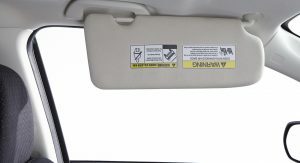 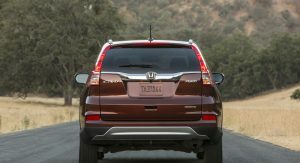 Changes at the rear end are limited to a redesigned bumper and chrome trim below the tailgate window. 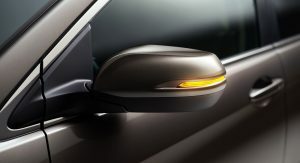 Other styling tweaks are the redesigned lateral mirrors and new alloy wheels. 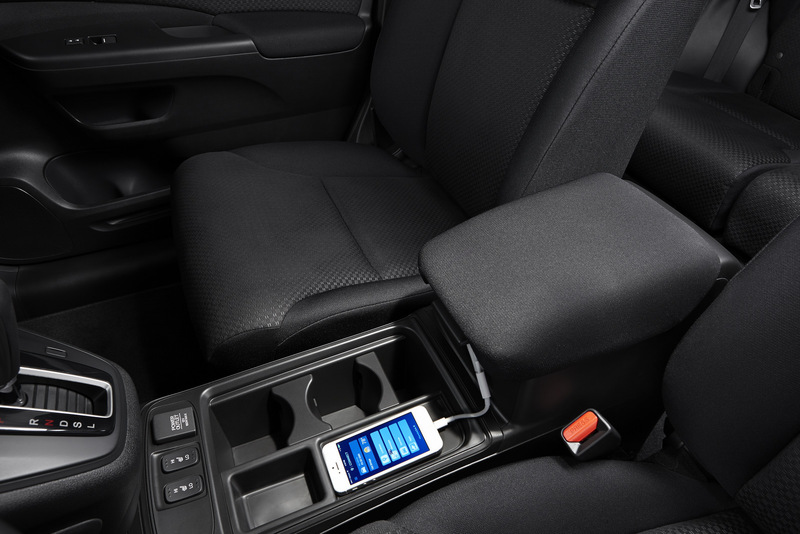 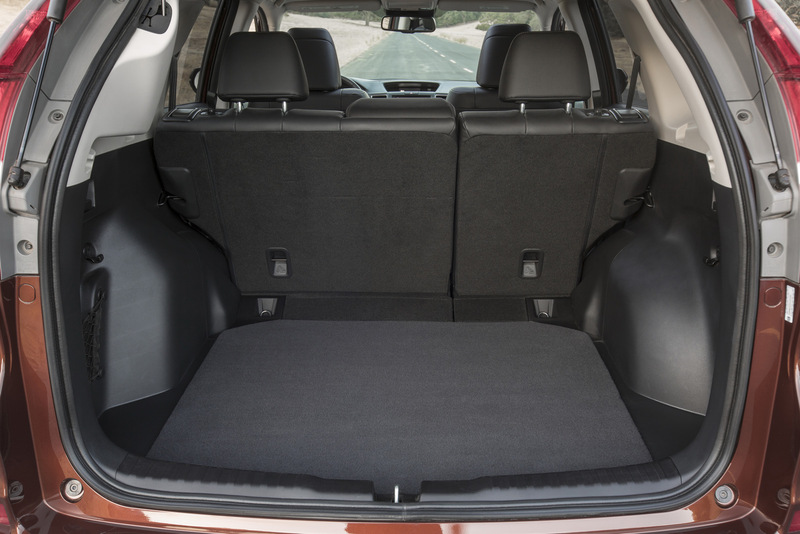 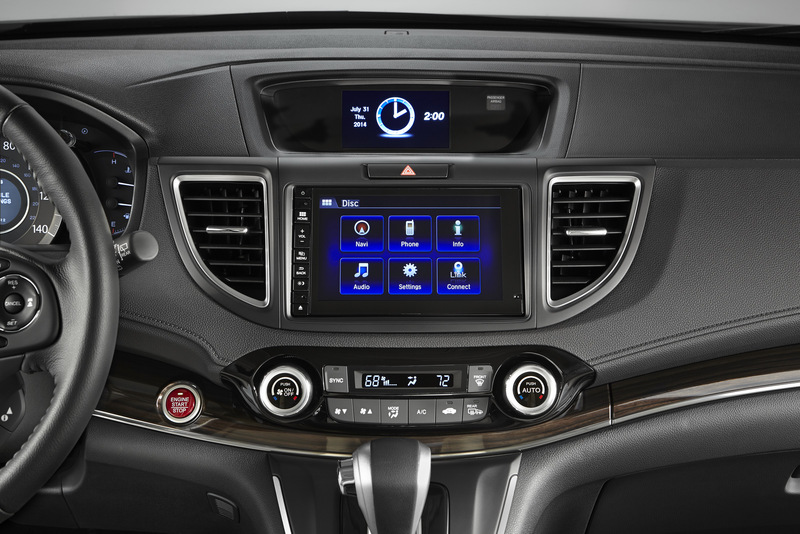 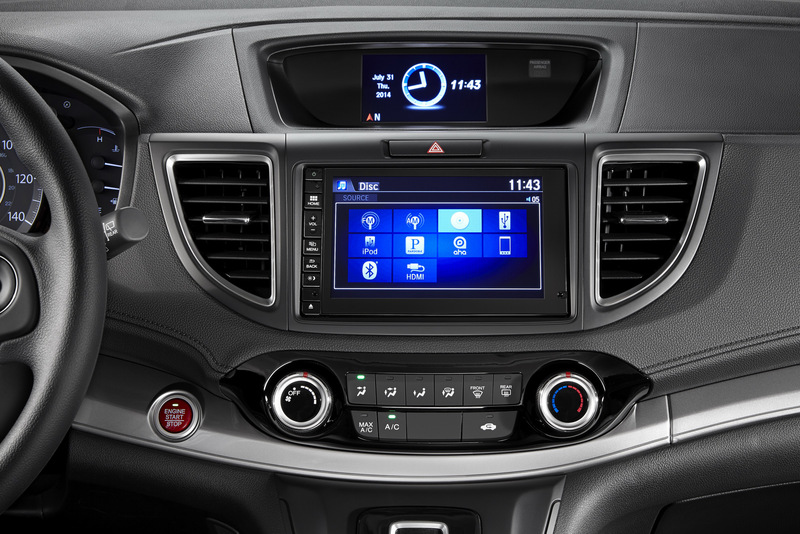 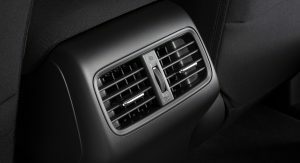 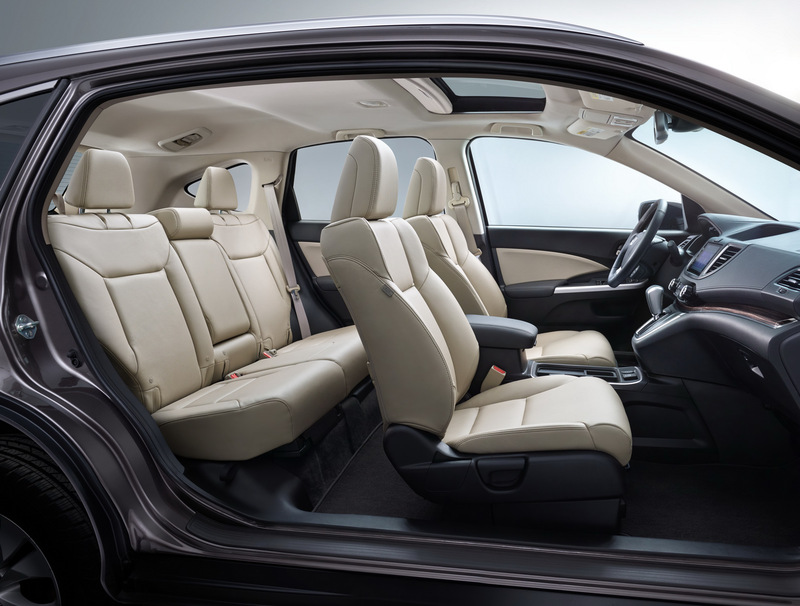 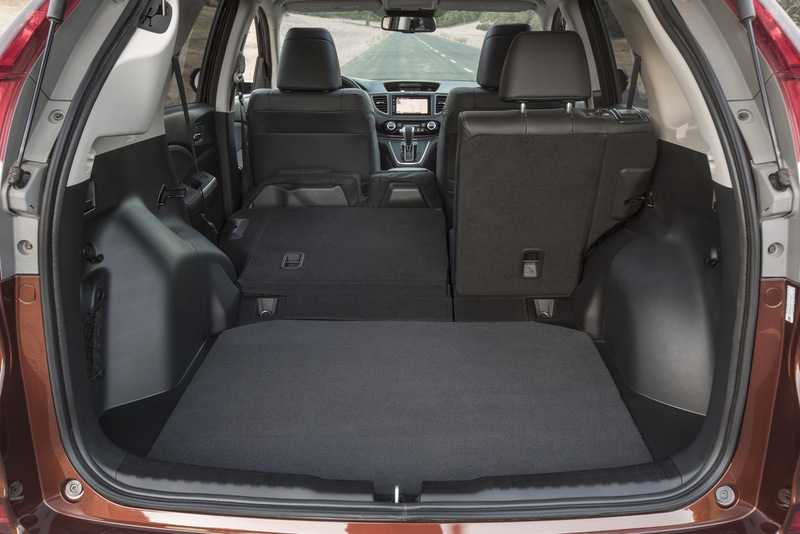 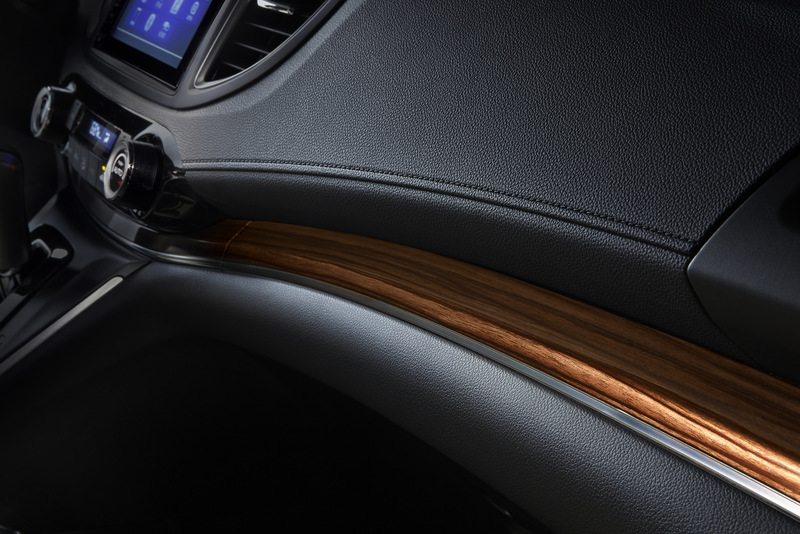 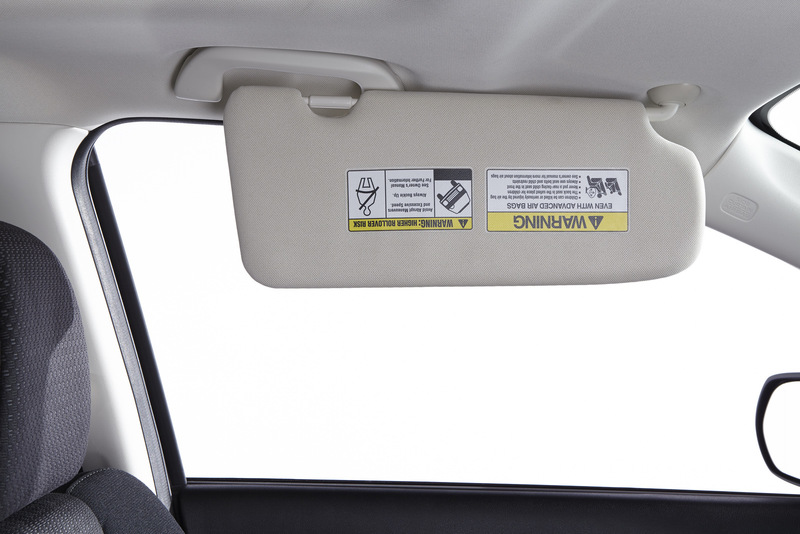 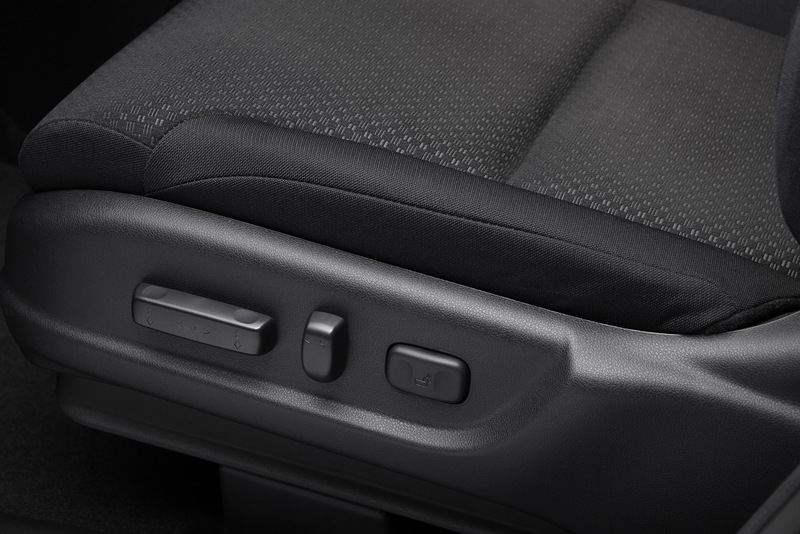 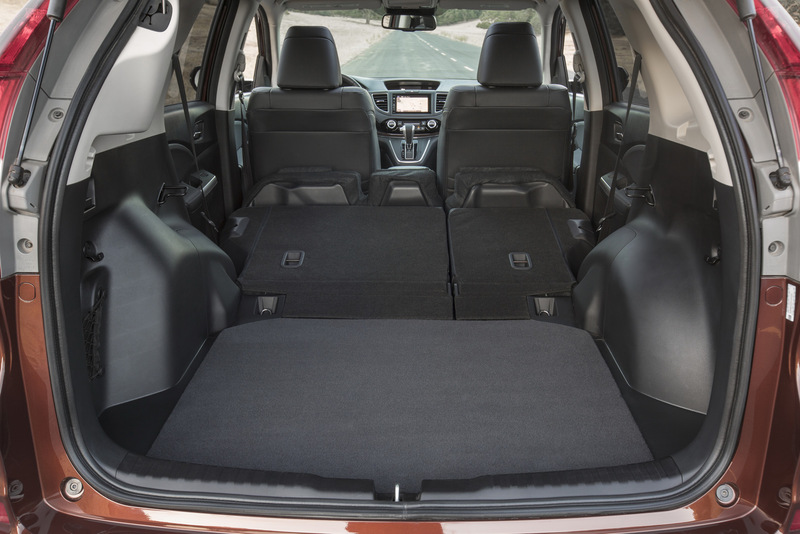 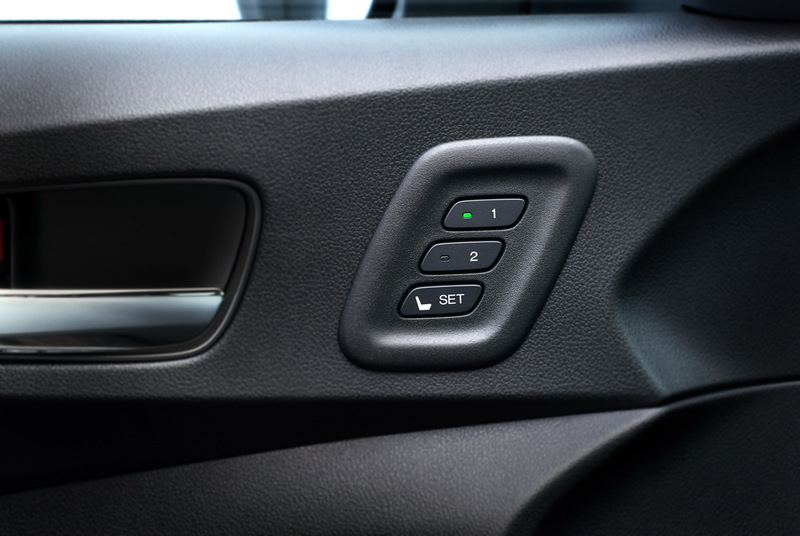 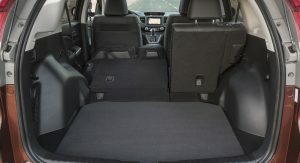 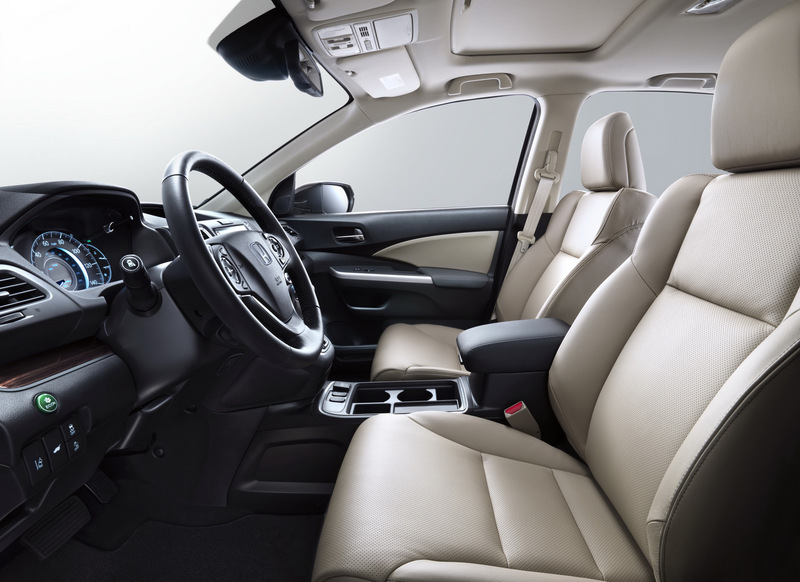 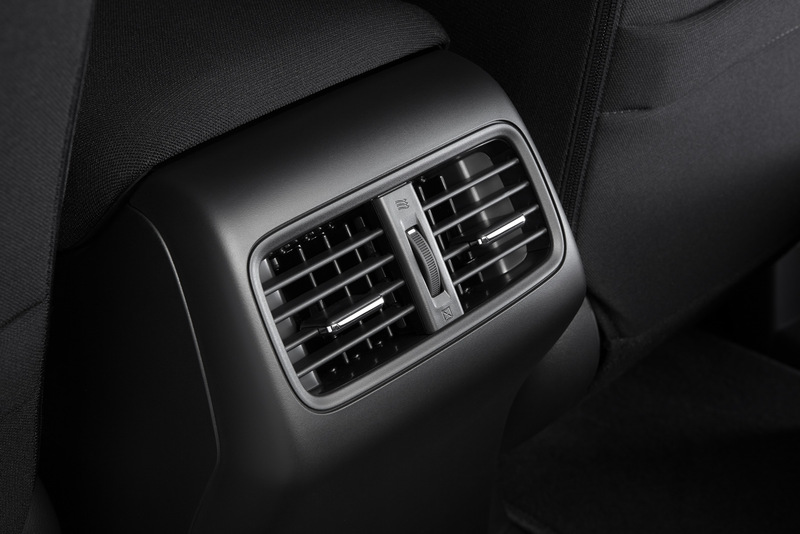 Inside, the 2015 CR-V gets new standard features including a new configurable center console with armrest, sliding sunvisors and rear console ventilation ducts. 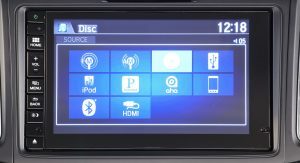 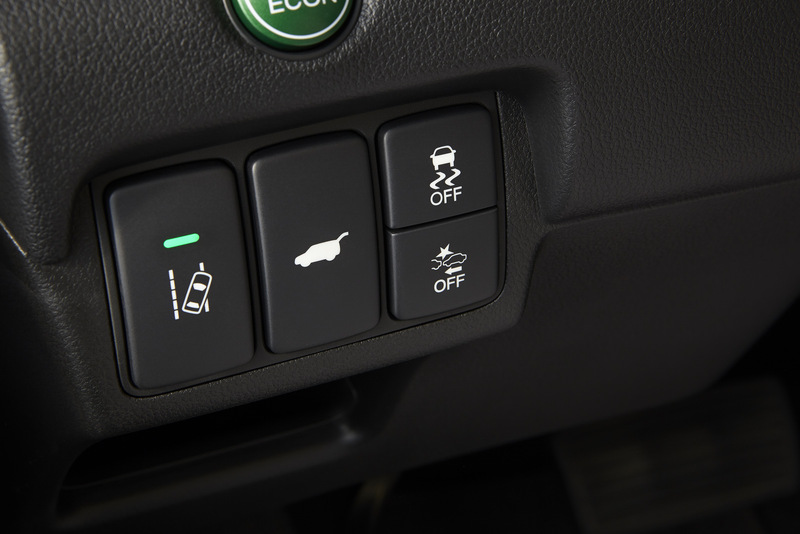 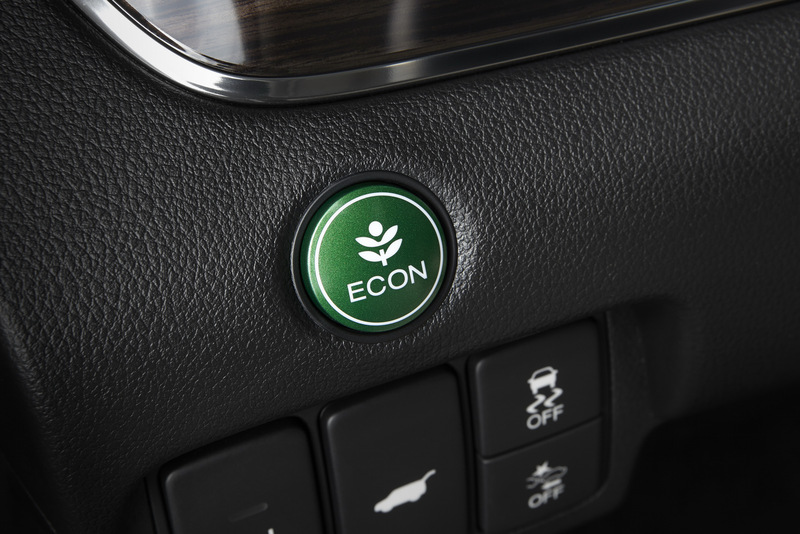 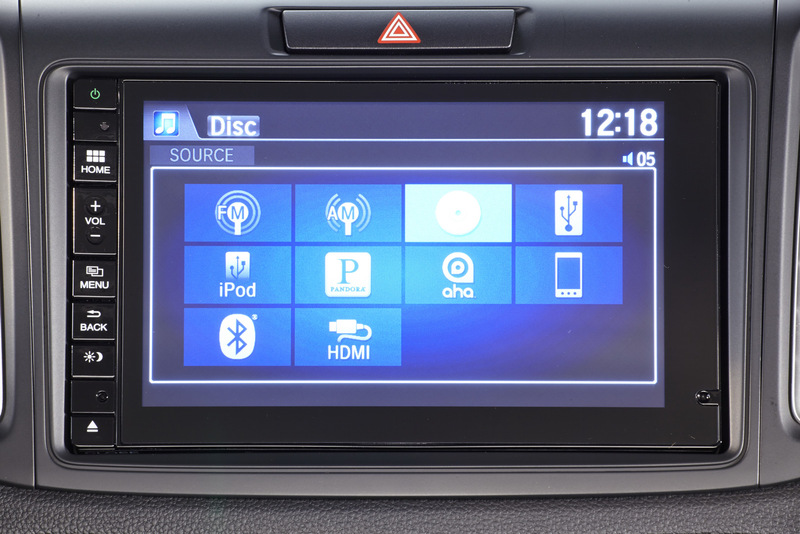 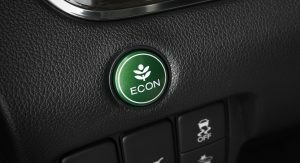 New available features include a power tailgate, 10-way power and heated driver’s seat with memory, LED daytime running lights, and a 7-inch touchscreen Display Audio telematics interface. 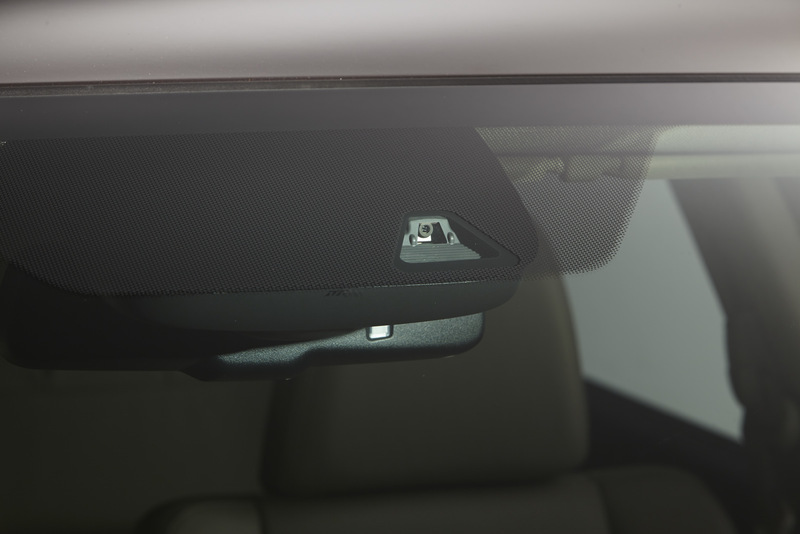 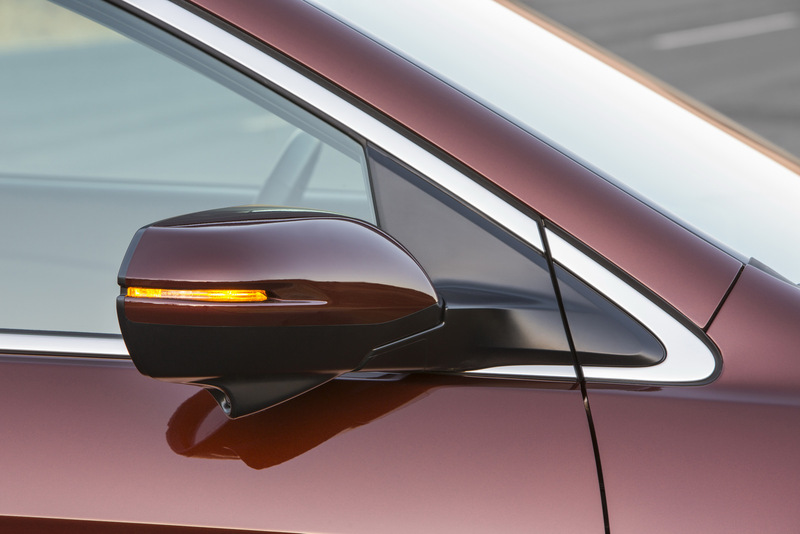 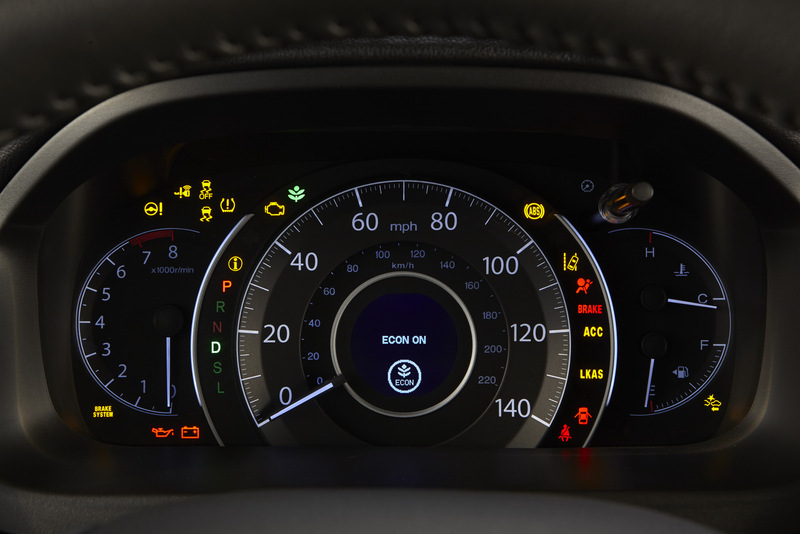 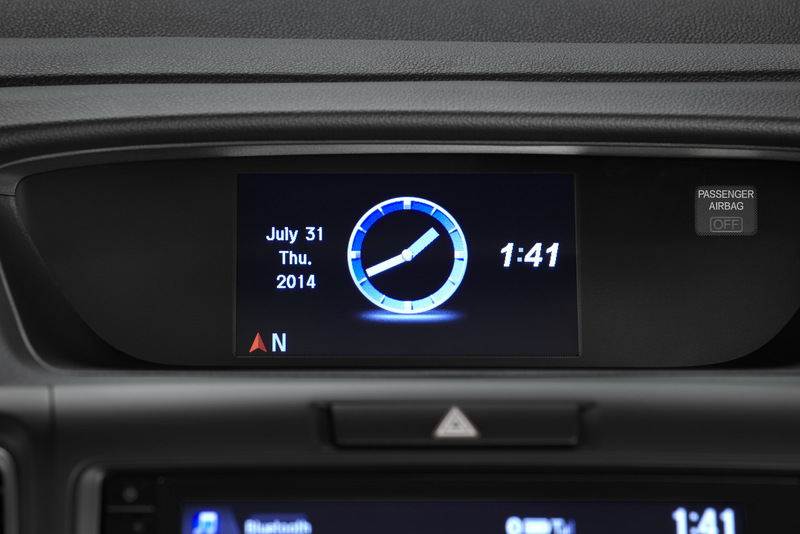 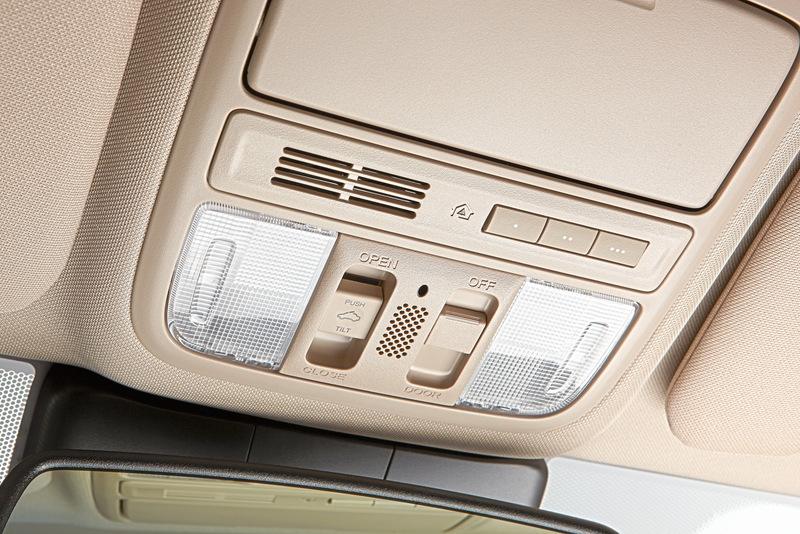 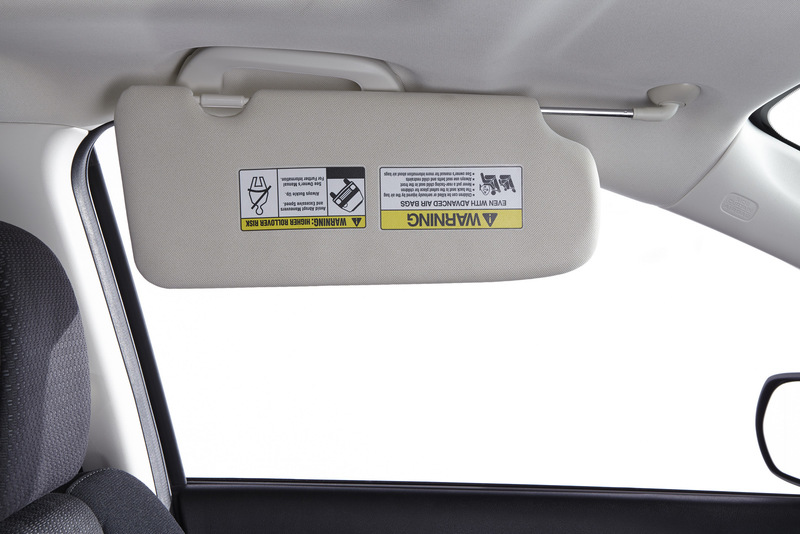 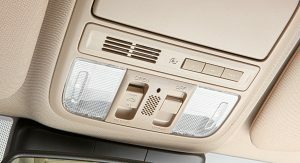 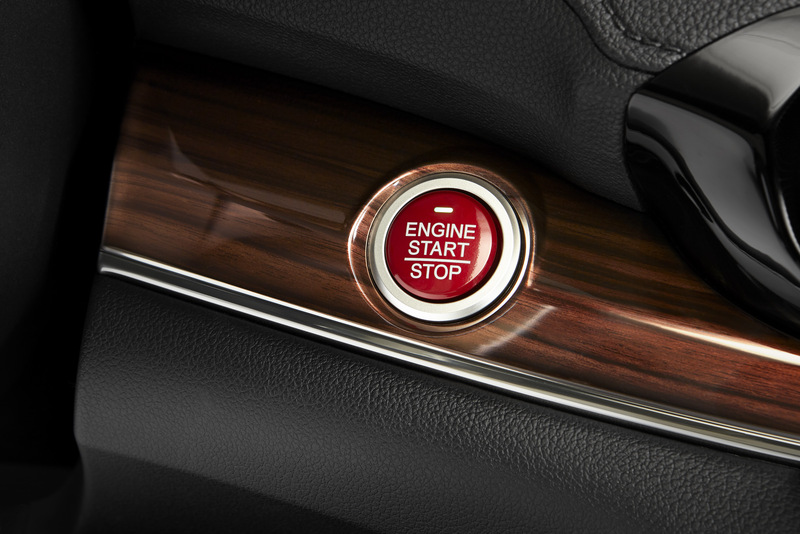 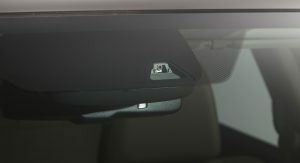 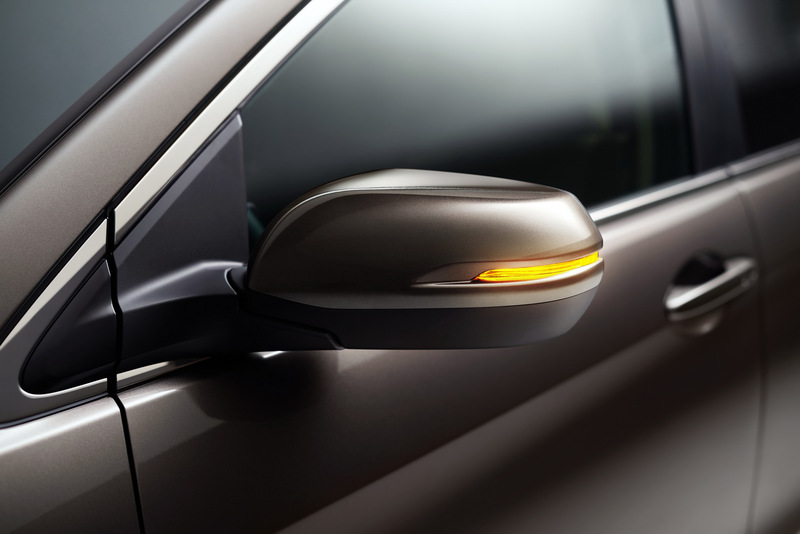 Together with Forward Collision Warning (FCW) and Honda LaneWatch, these systems are part of the new Honda Sensing suite of safety and driver assistive technologies. 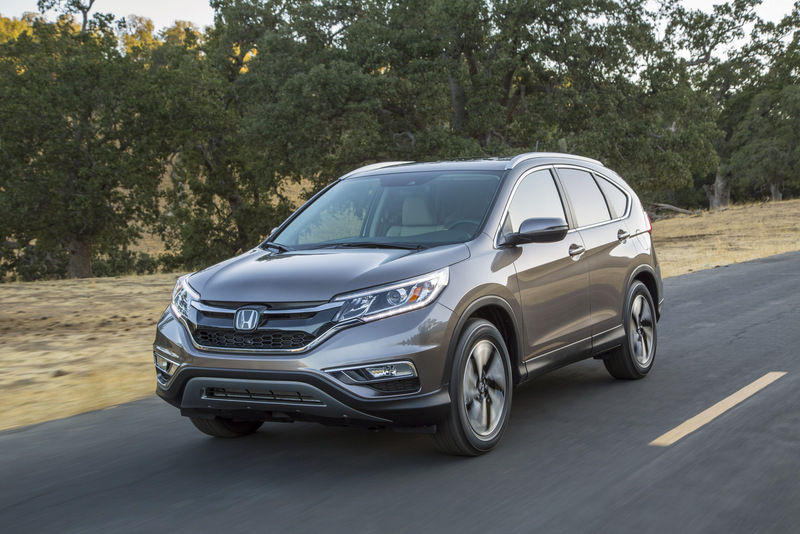 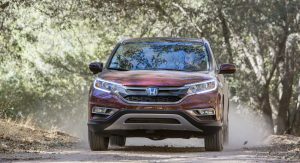 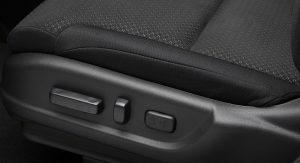 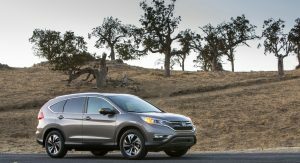 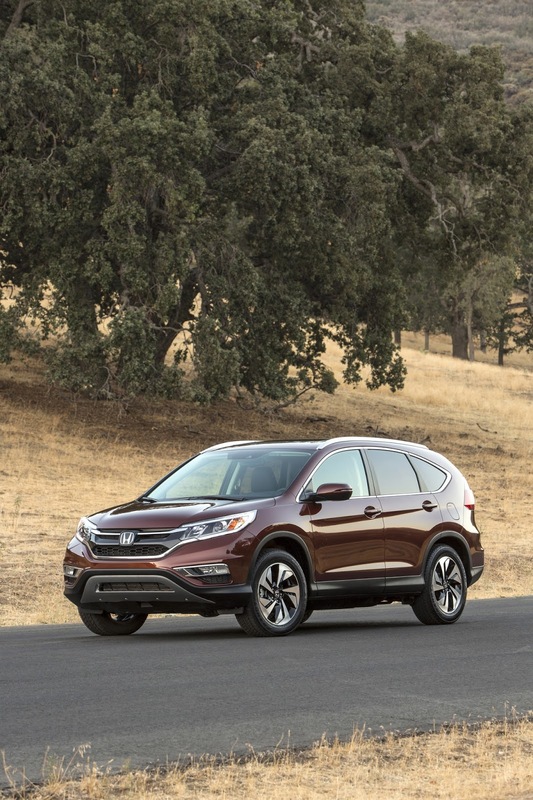 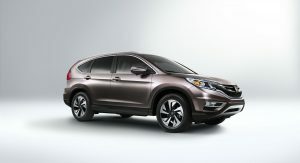 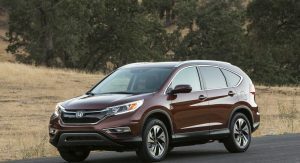 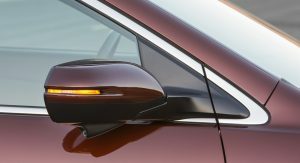 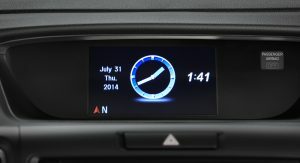 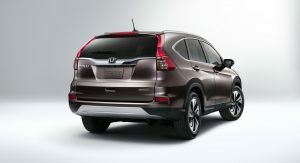 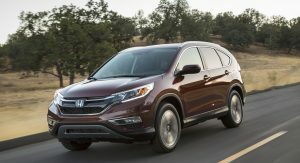 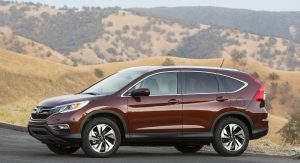 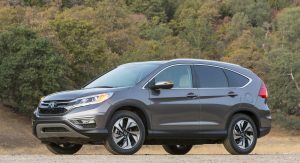 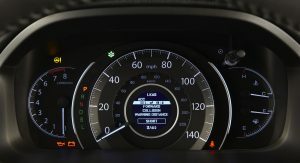 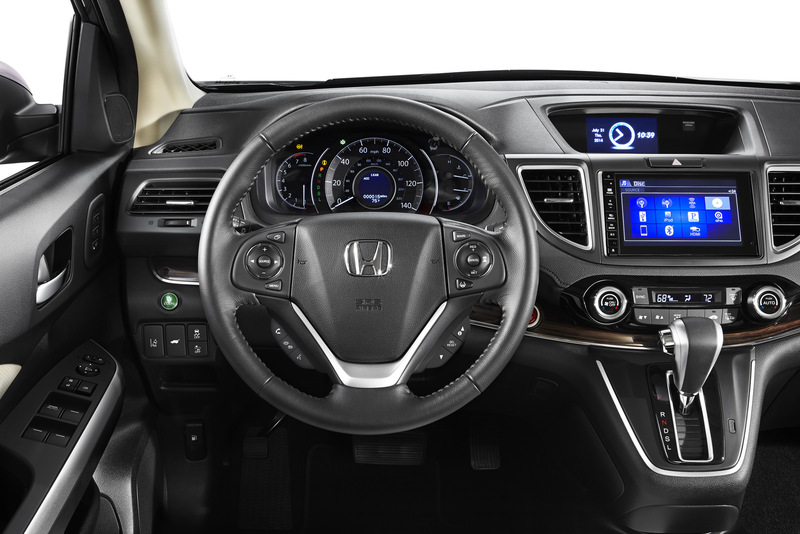 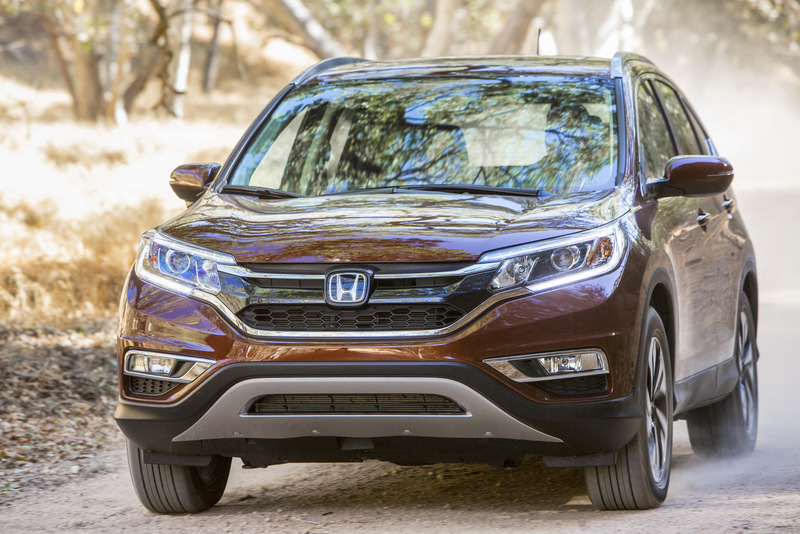 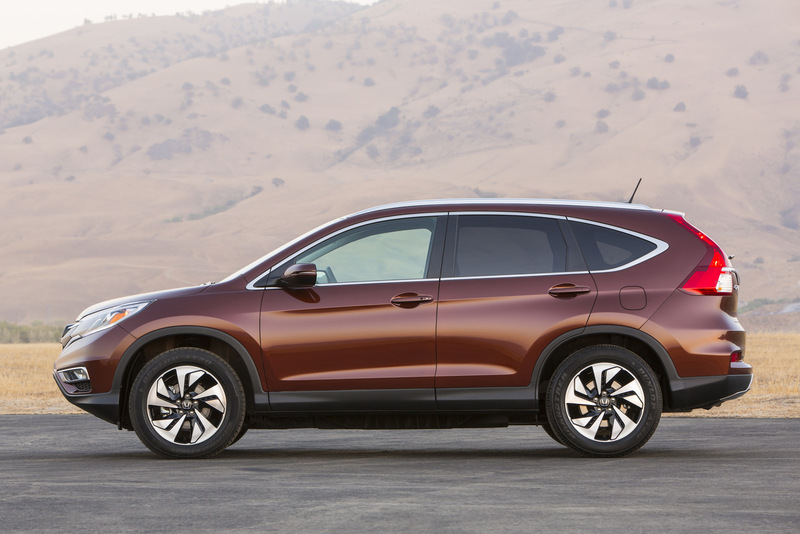 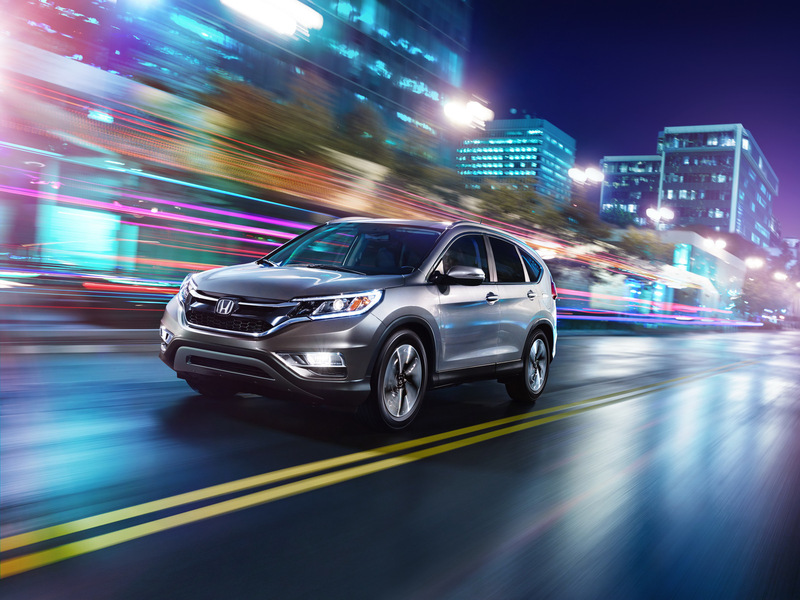 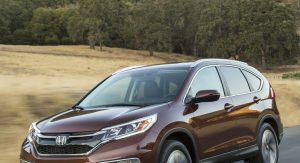 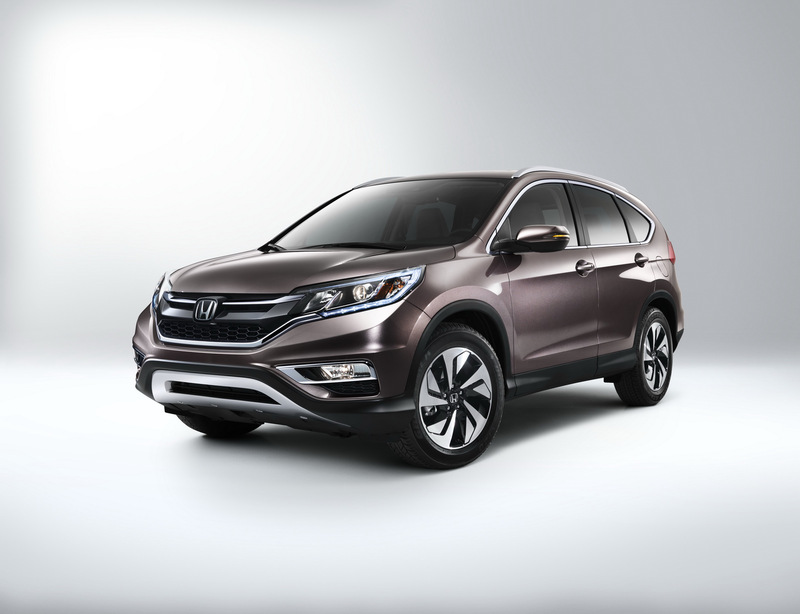 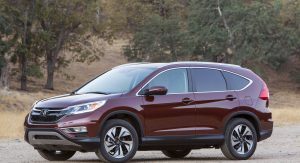 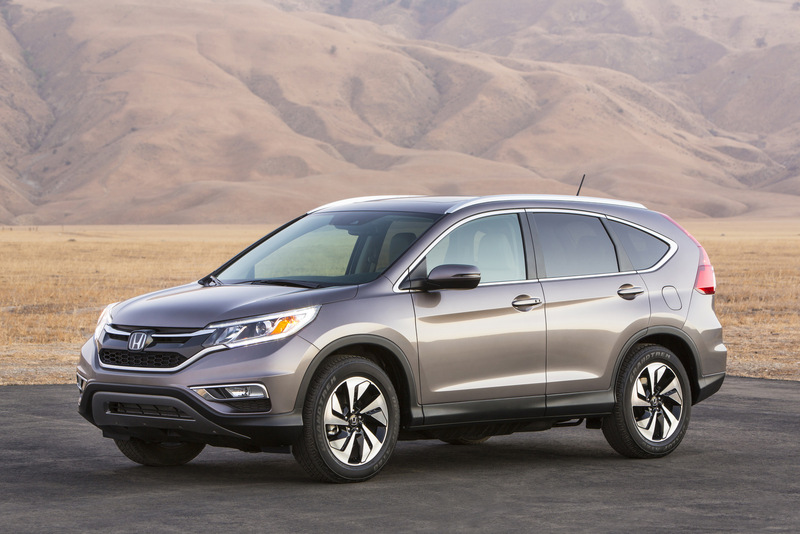 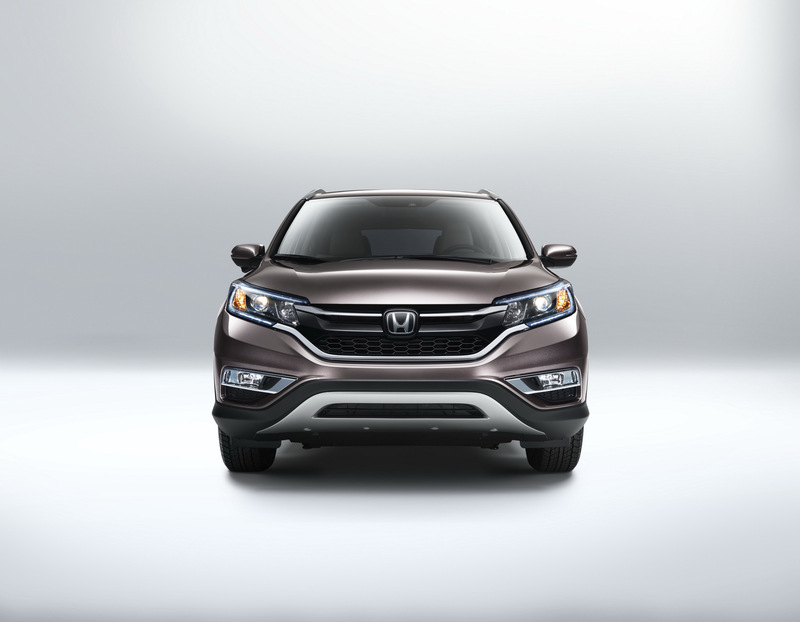 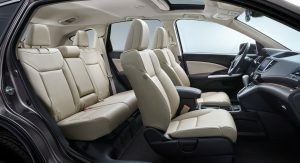 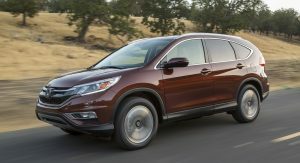 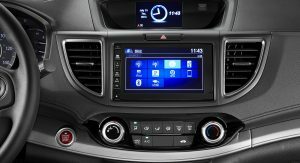 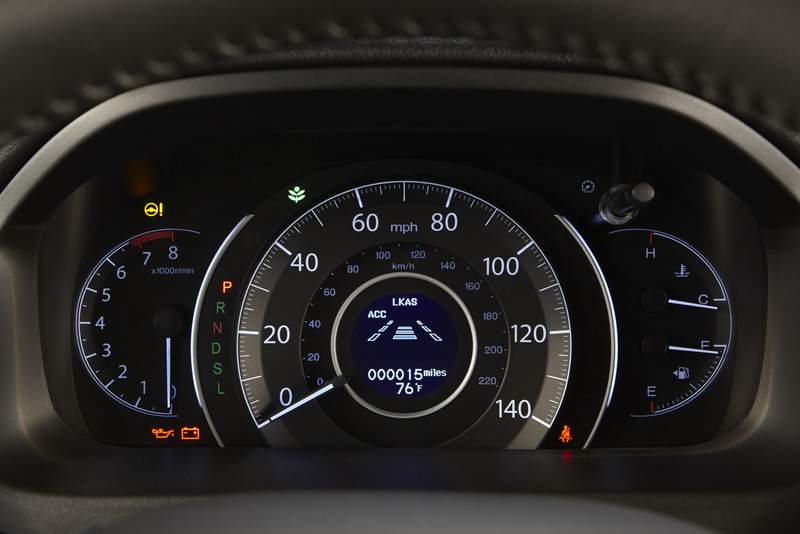 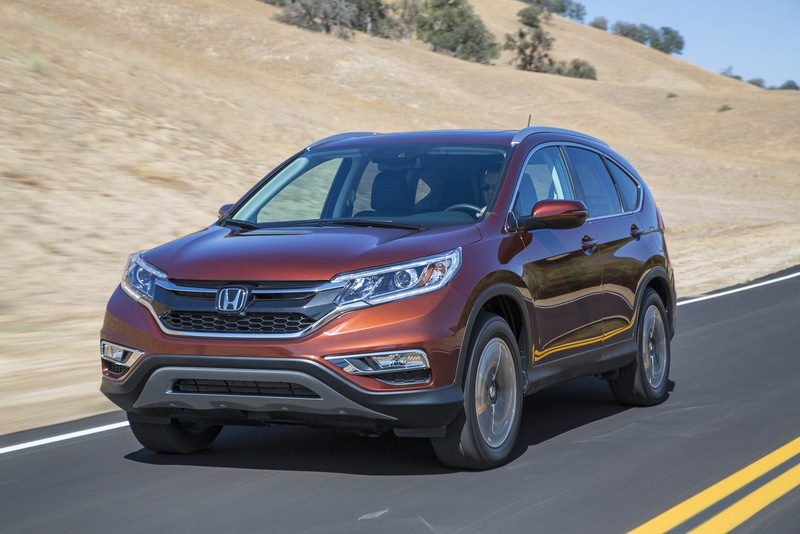 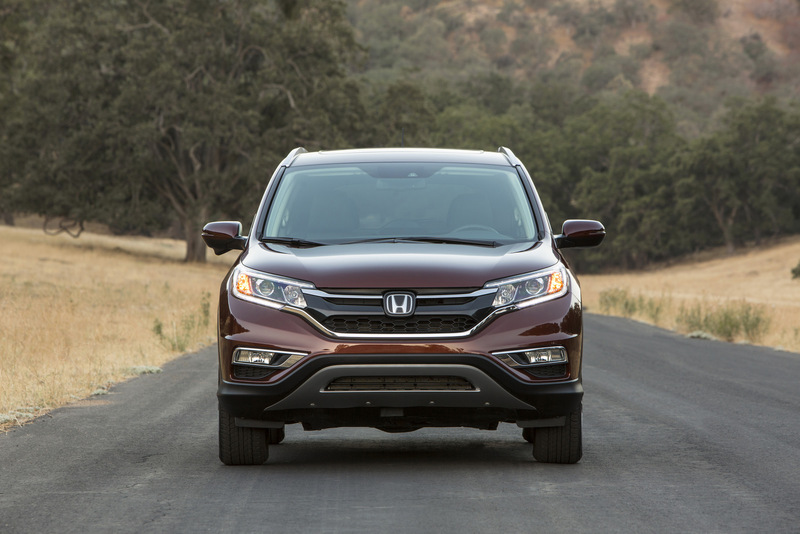 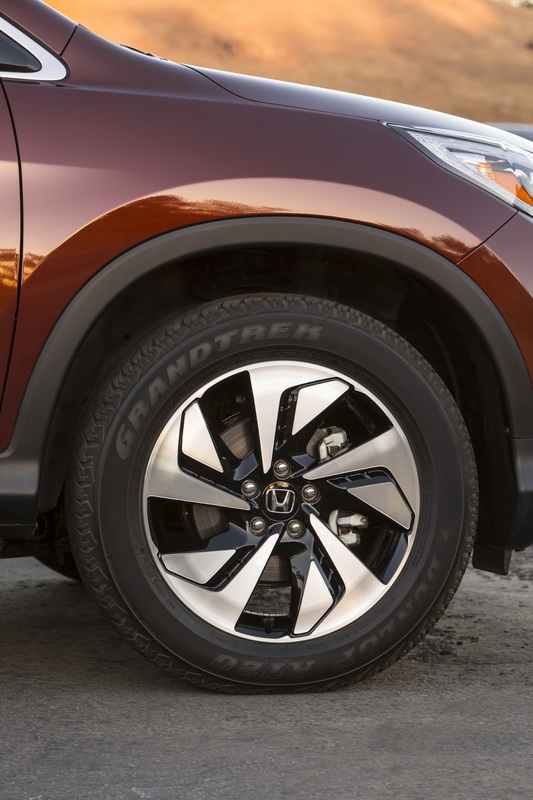 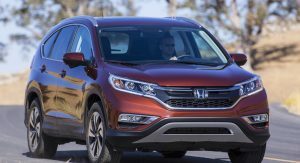 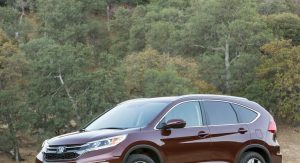 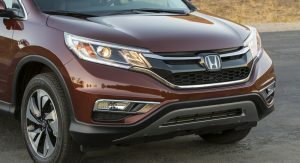 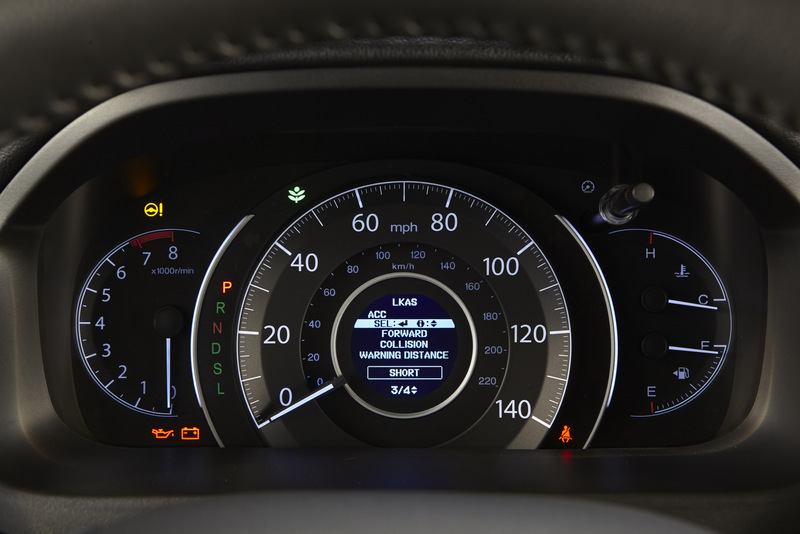 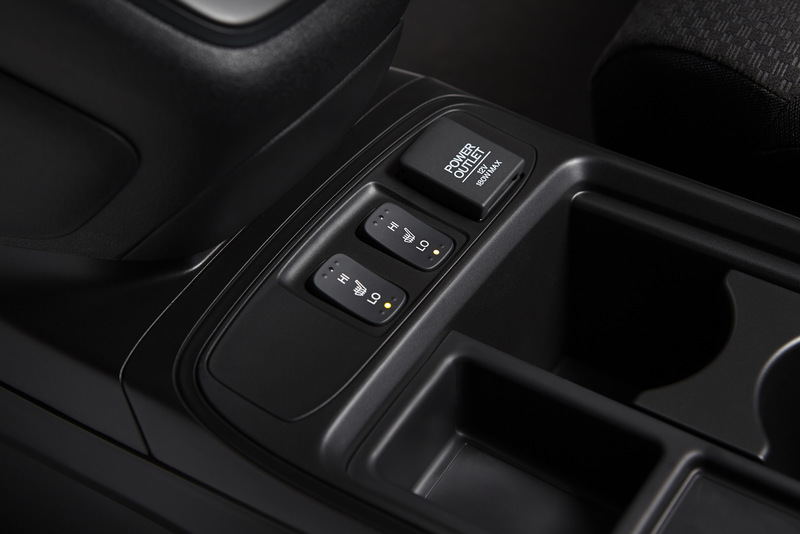 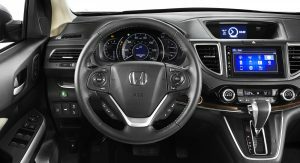 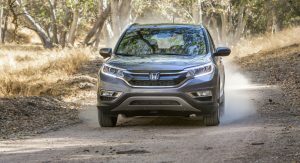 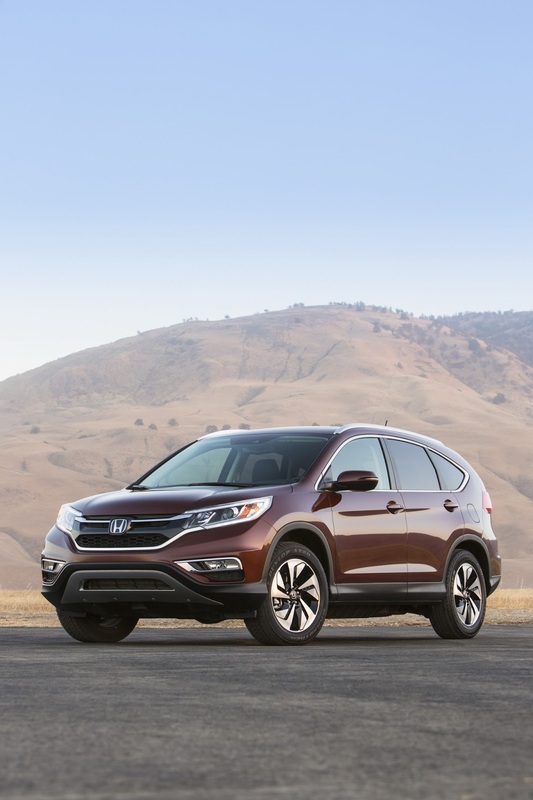 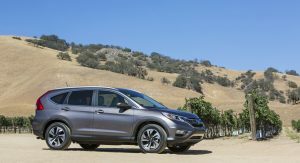 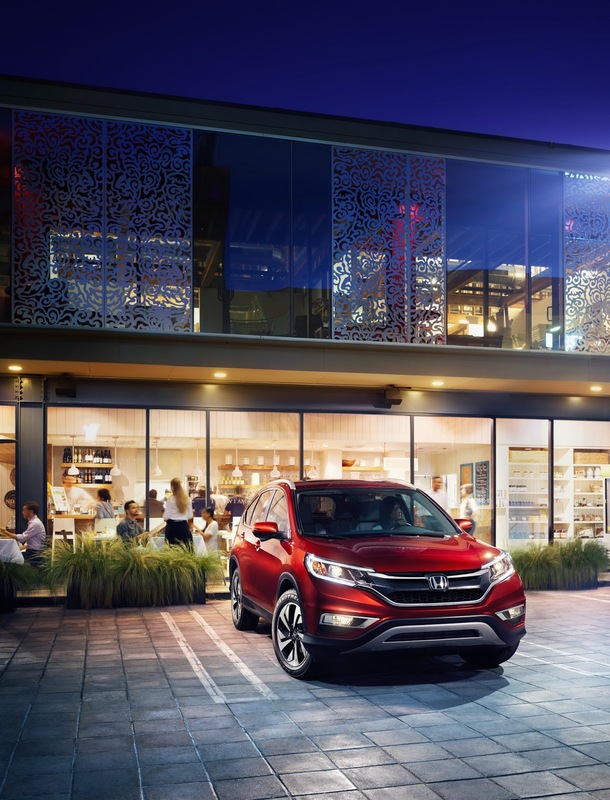 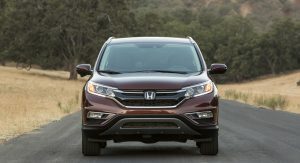 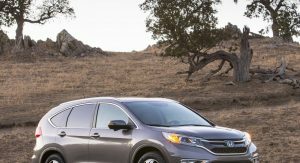 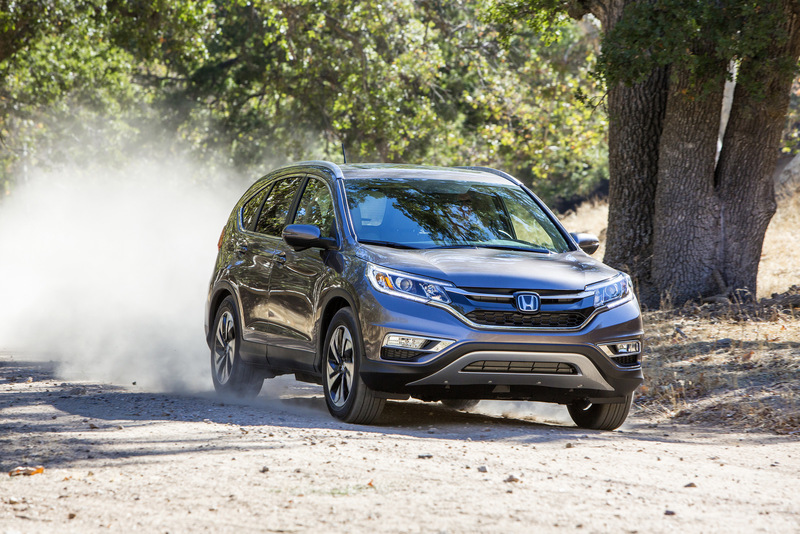 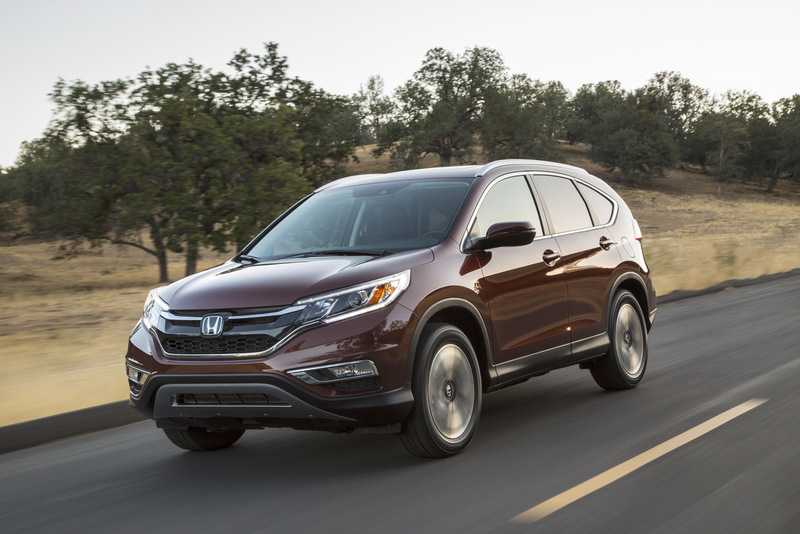 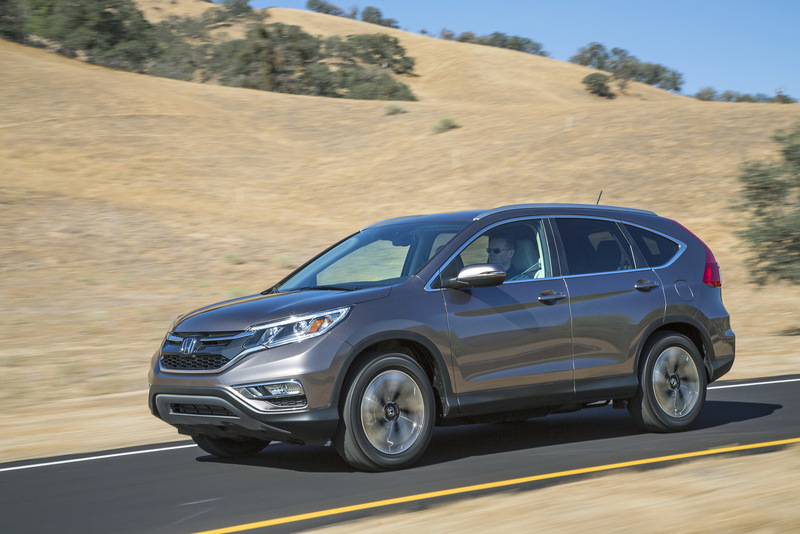 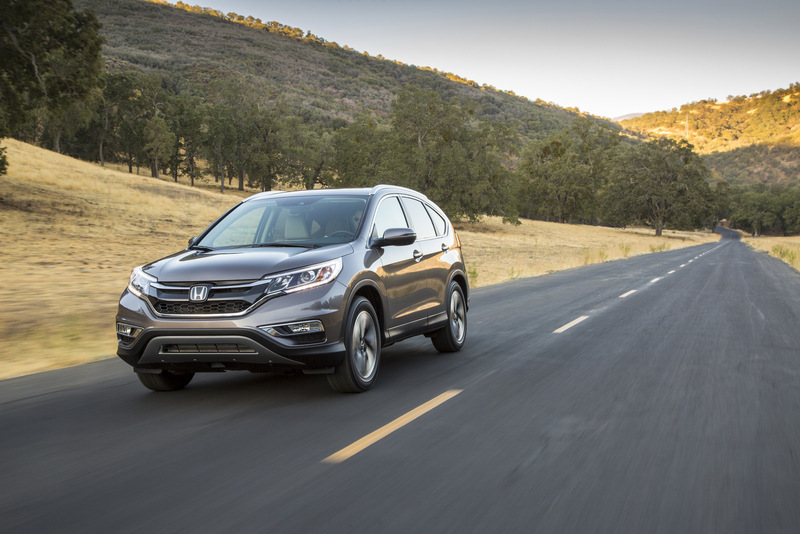 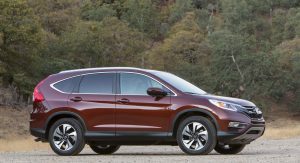 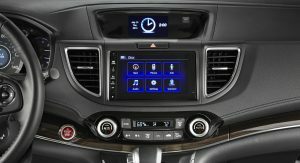 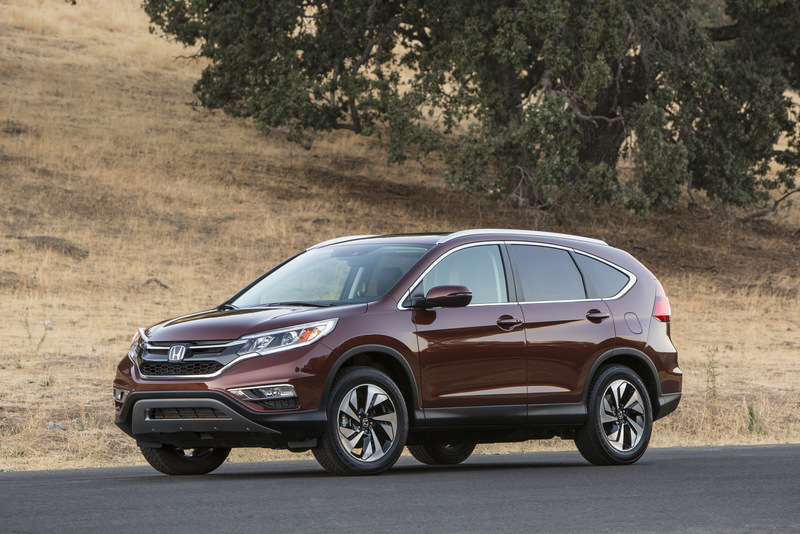 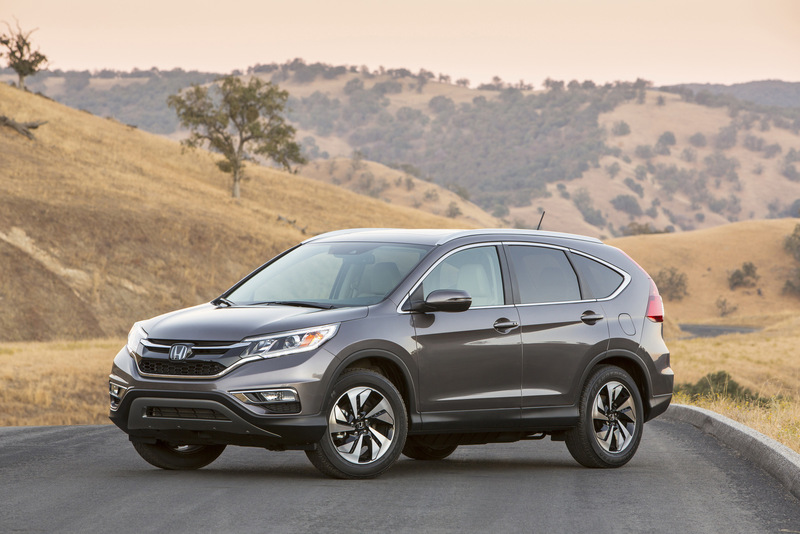 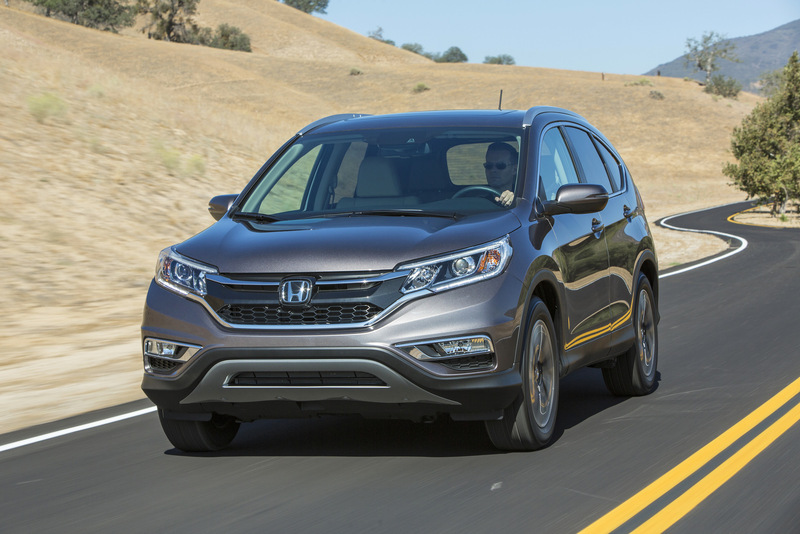 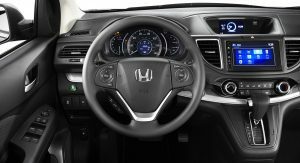 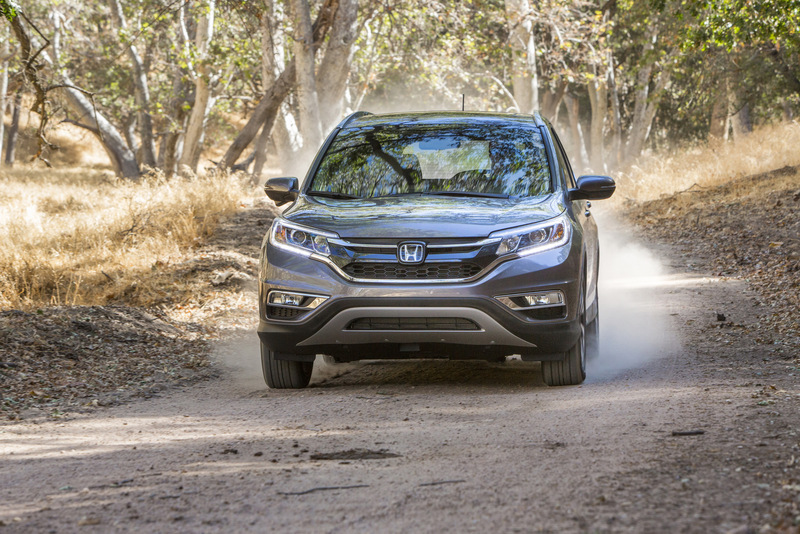 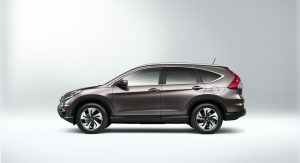 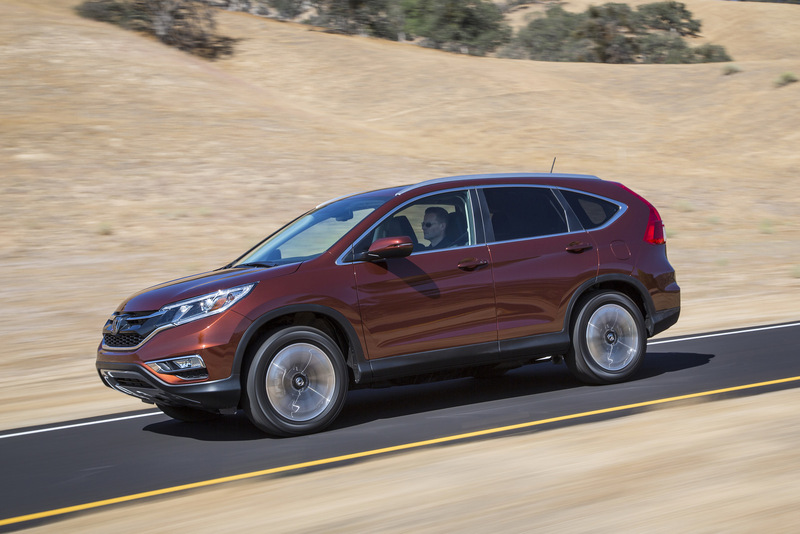 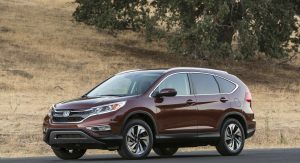 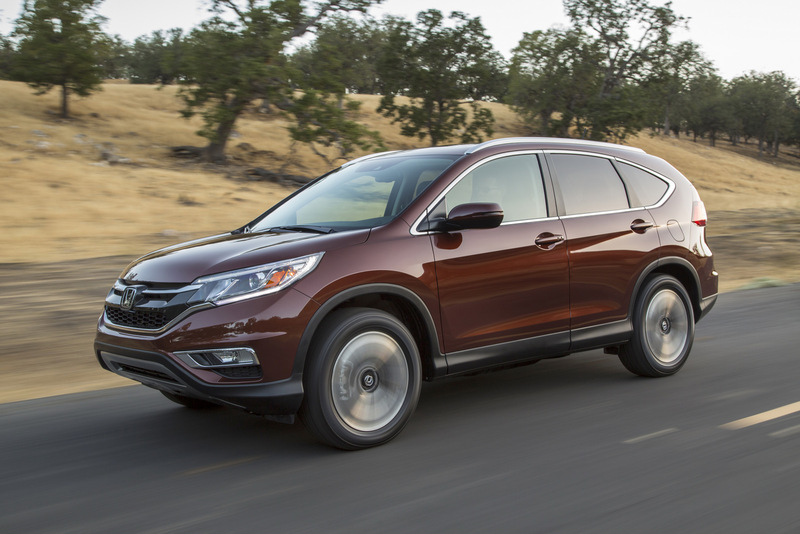 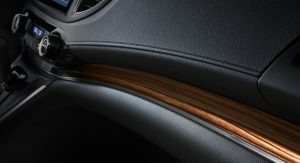 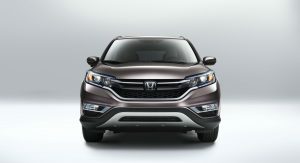 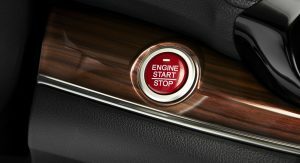 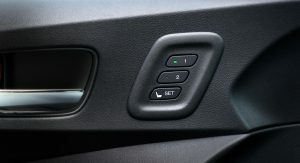 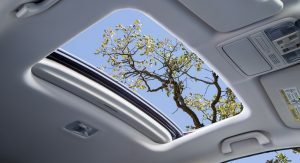 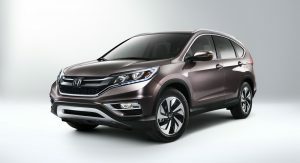 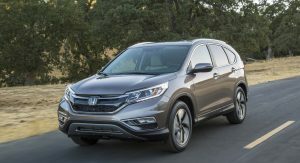 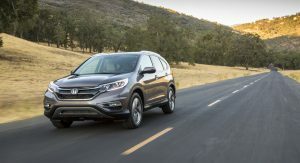 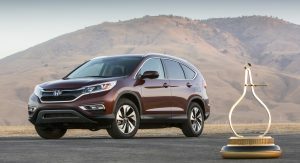 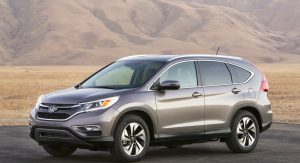 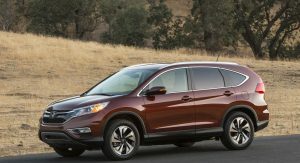 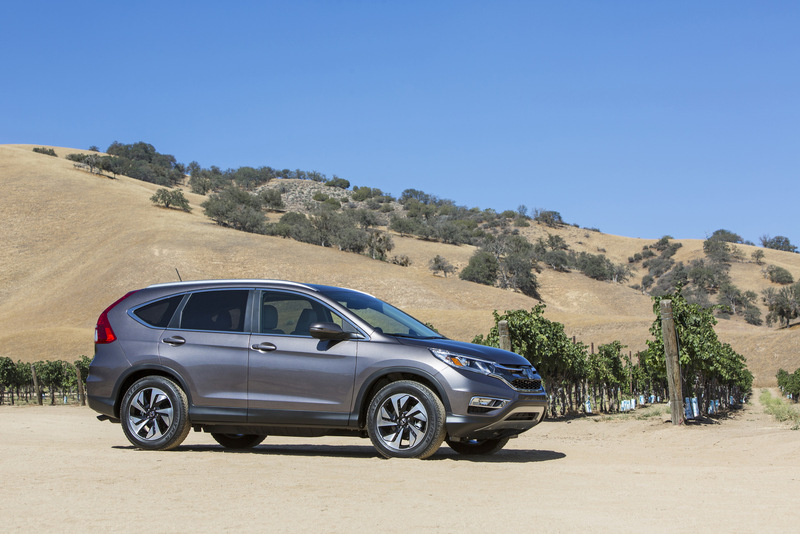 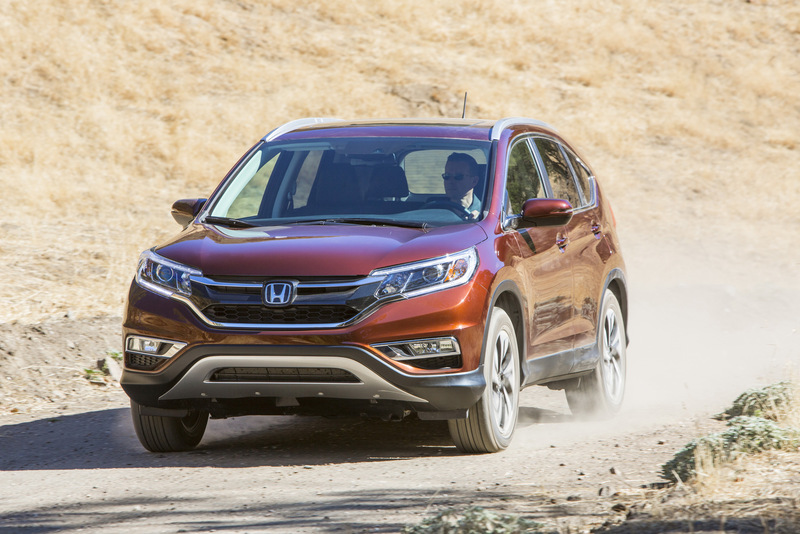 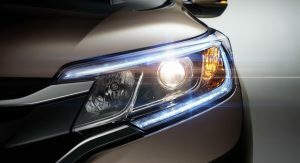 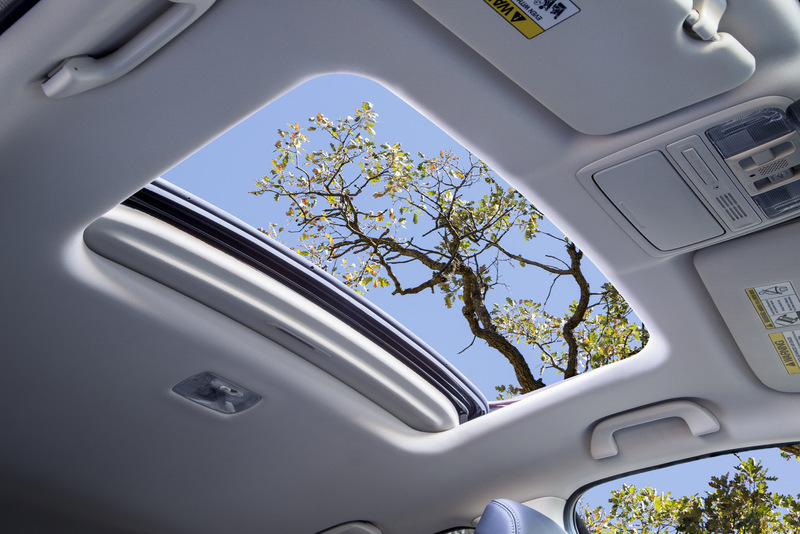 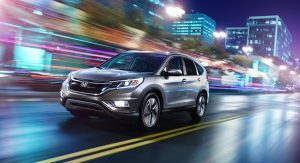 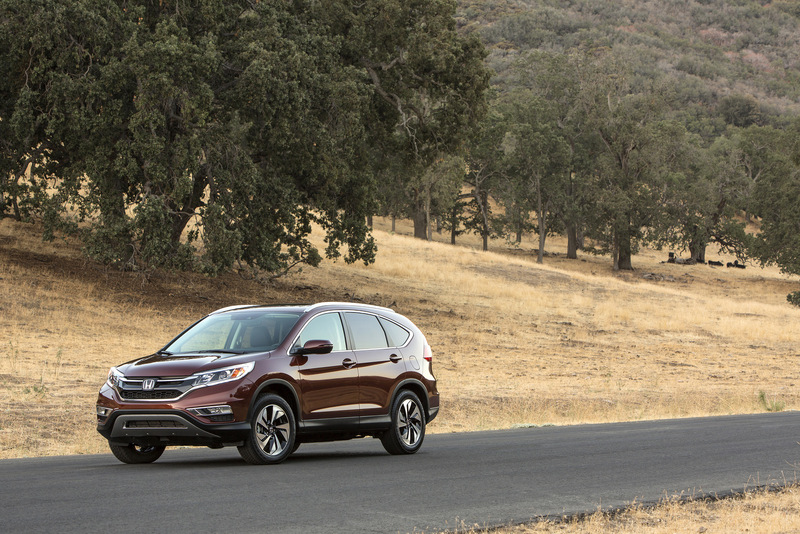 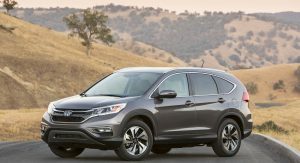 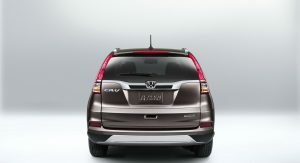 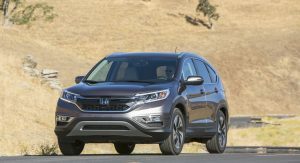 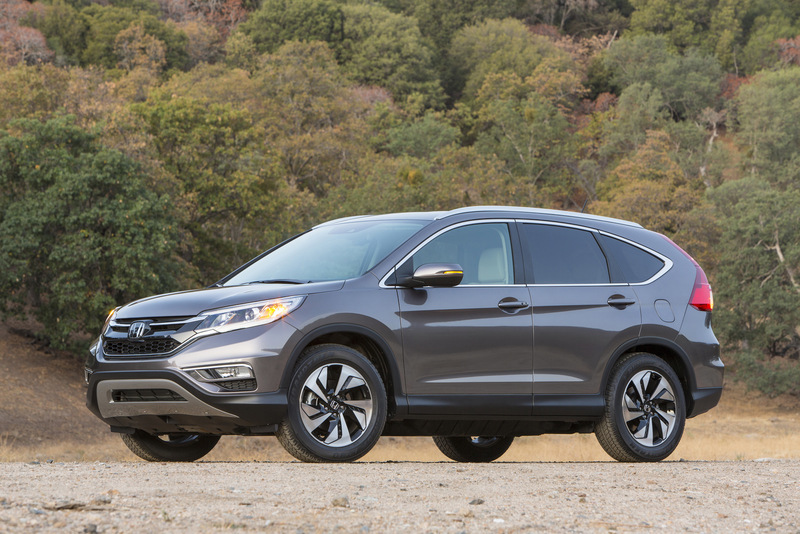 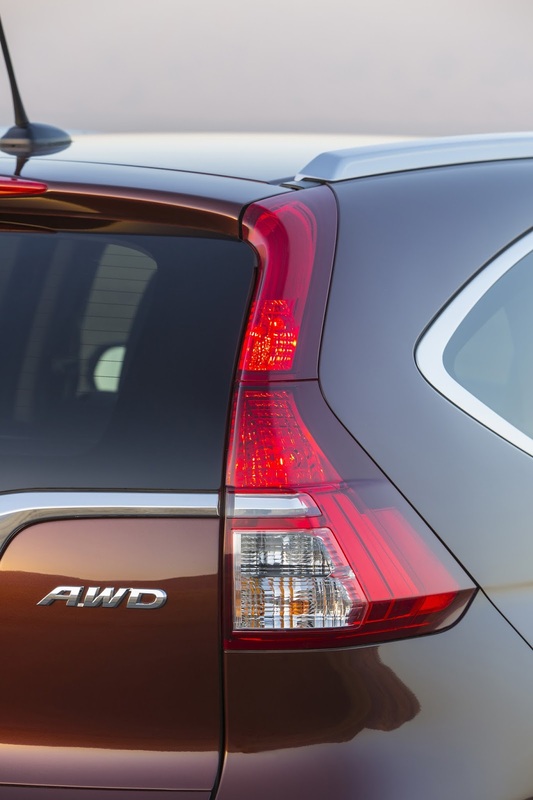 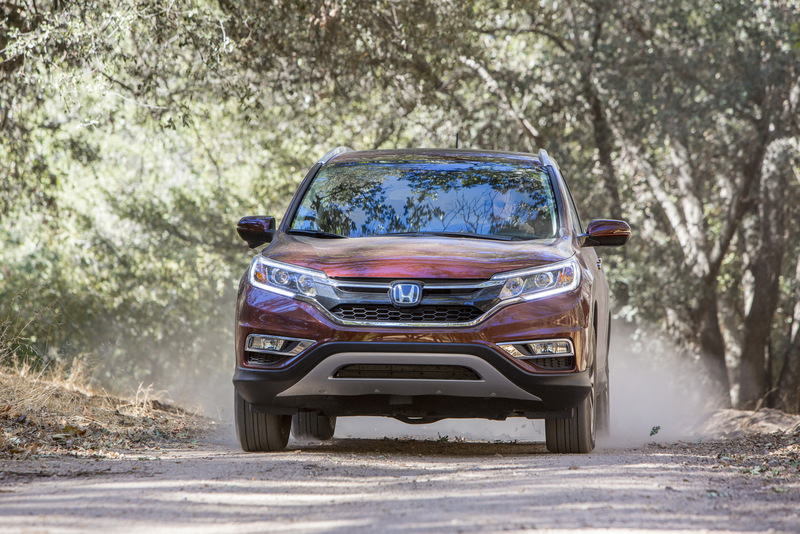 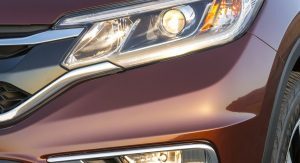 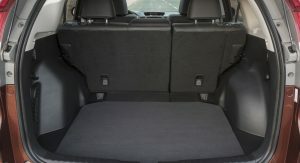 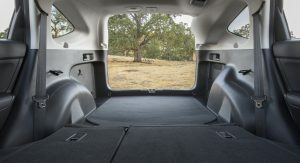 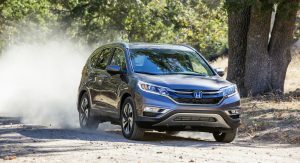 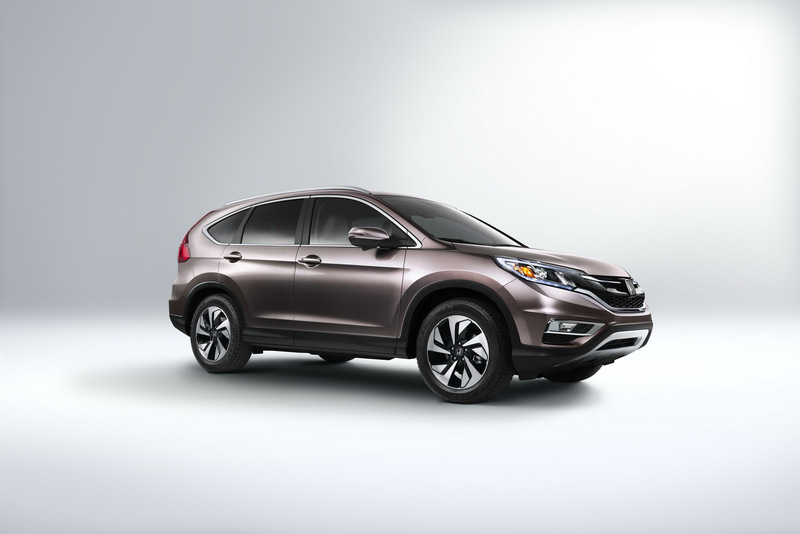 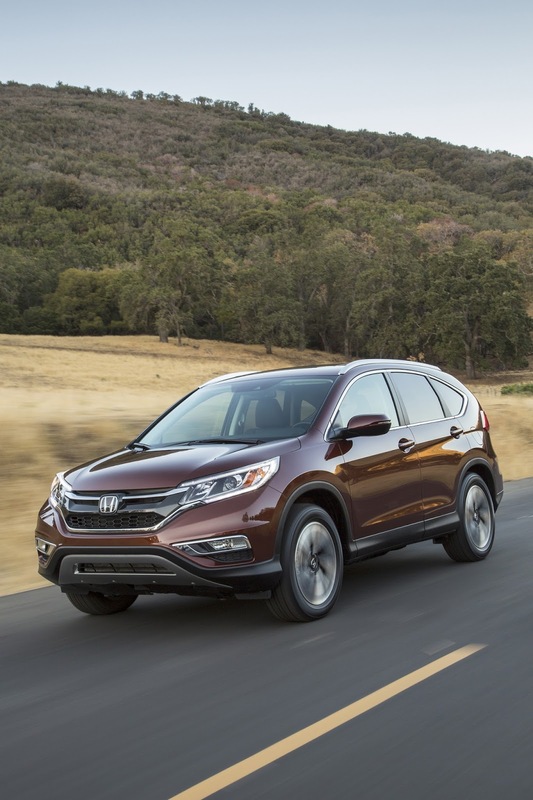 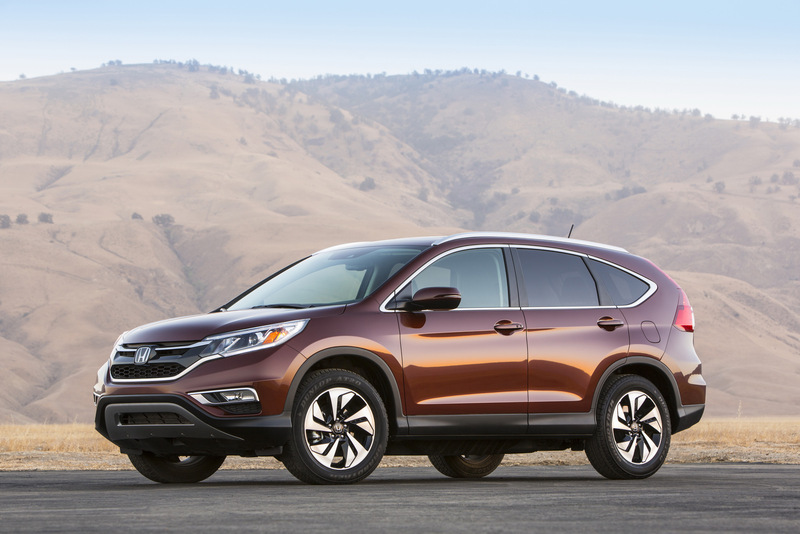 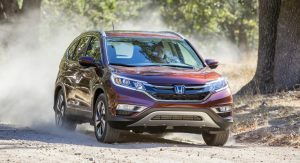 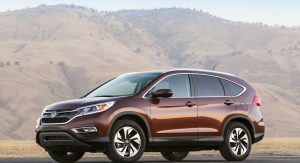 Also new for 2015 is a top-of-the-line Touring trim which includes the first Honda application of two advanced driver-assistive technologies, Collision Mitigation Braking System (CMBS) and Lane Keeping Assist System (LKAS), as well as the first CR-V adoption of Adaptive Cruise Control (ACC). 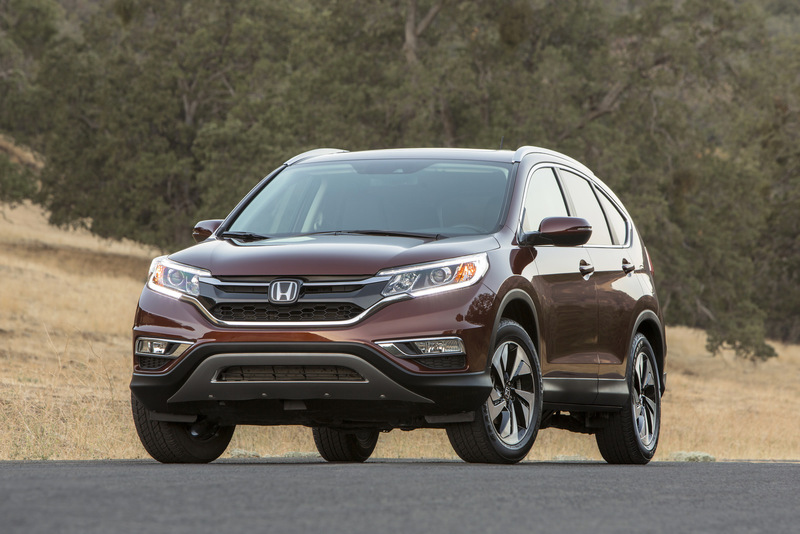 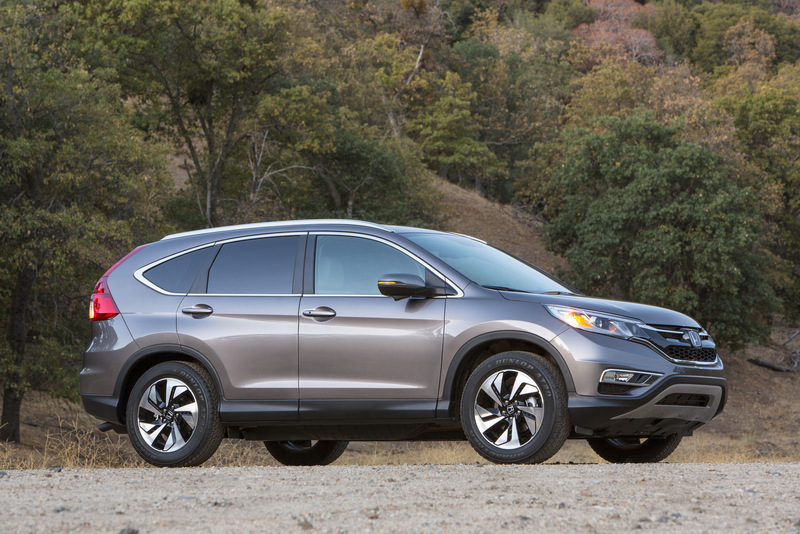 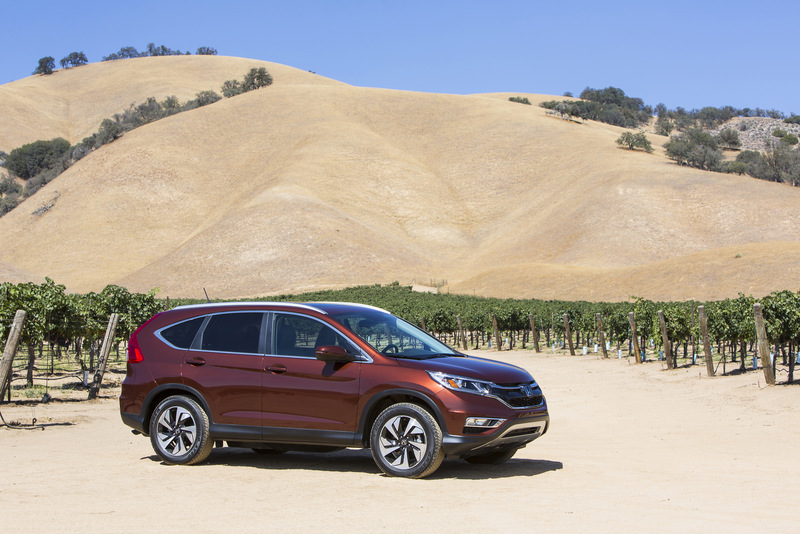 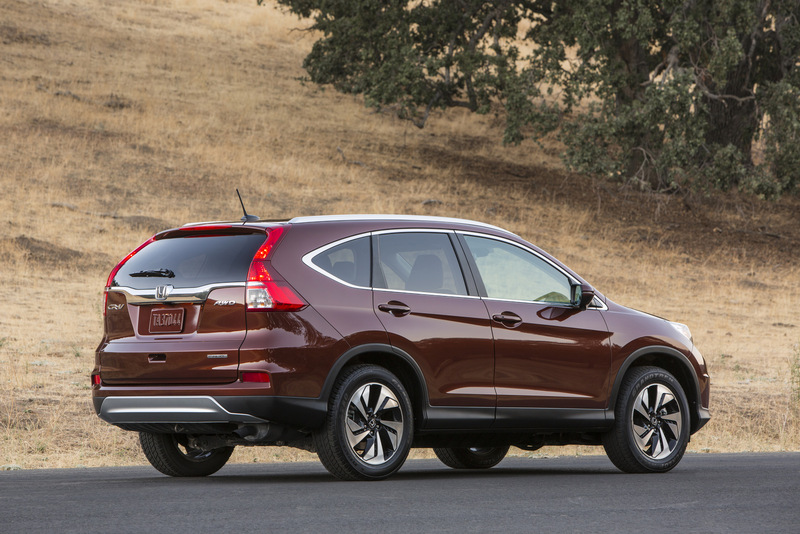 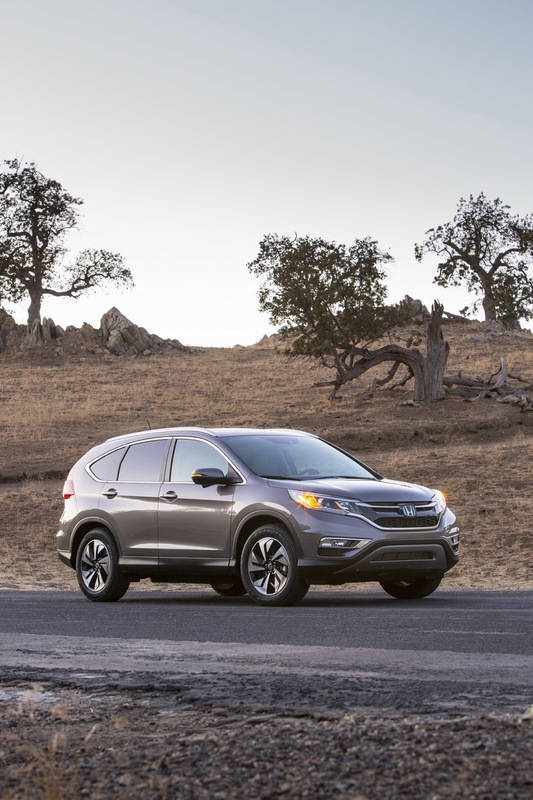 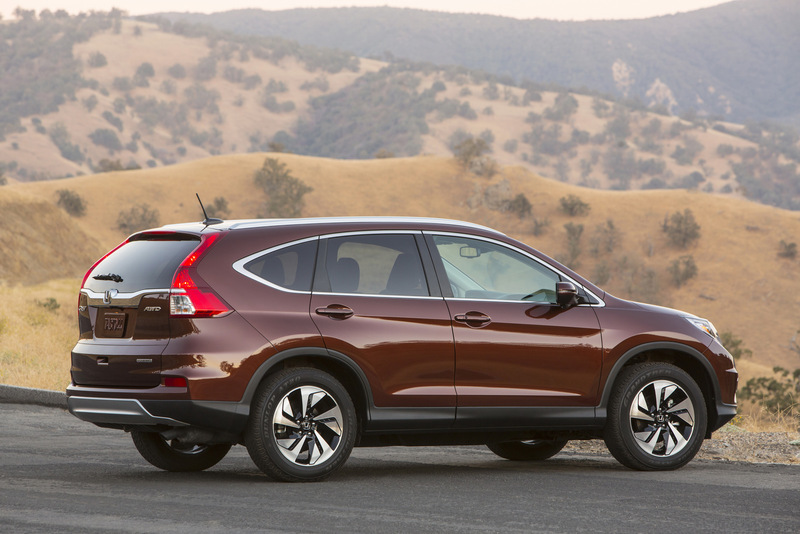 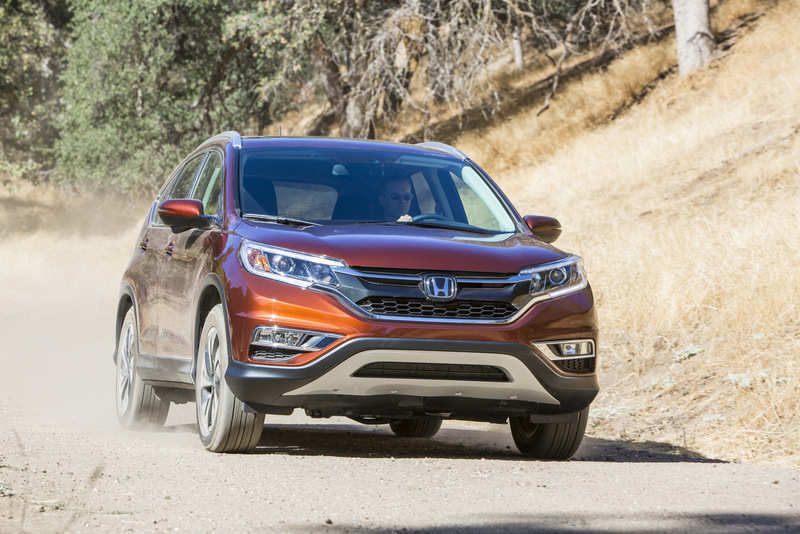 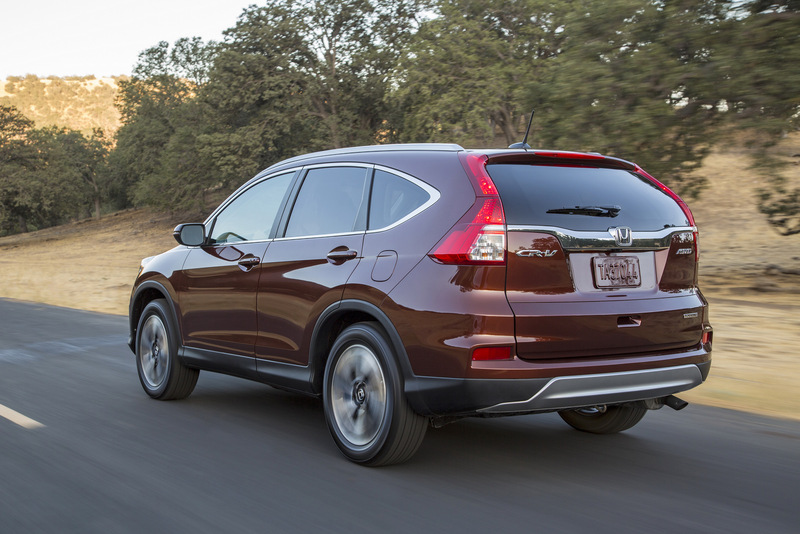 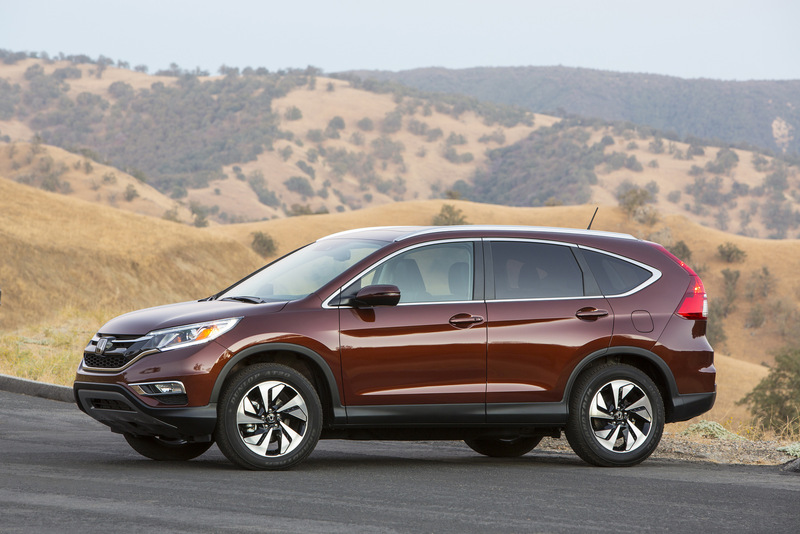 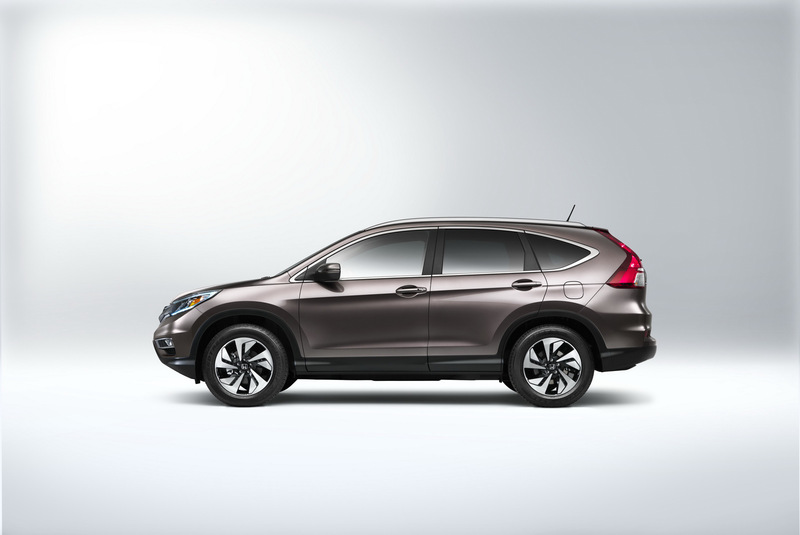 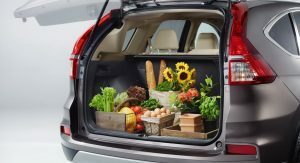 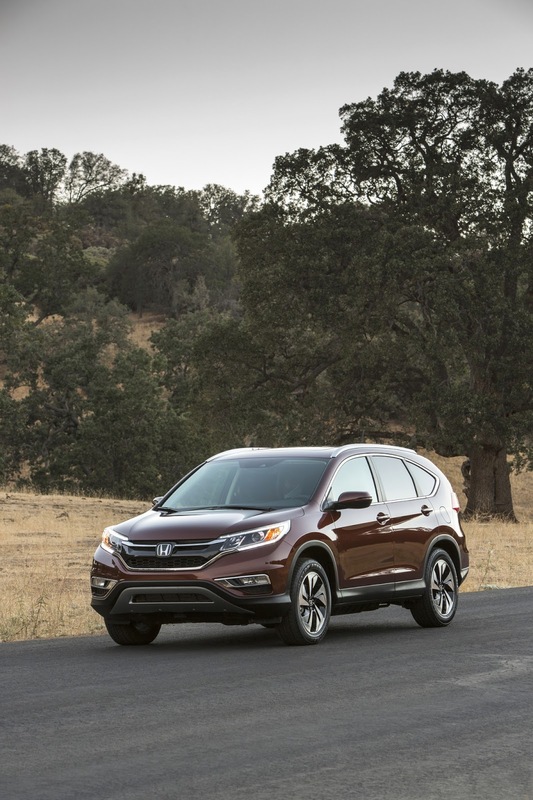 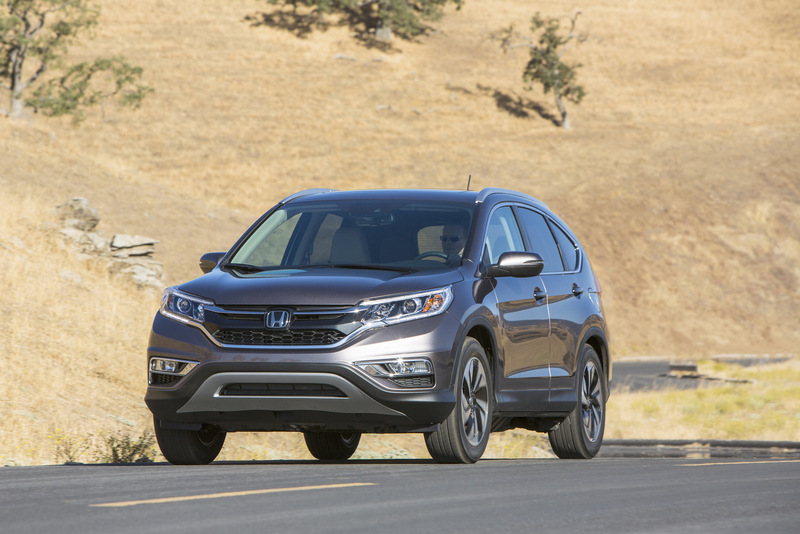 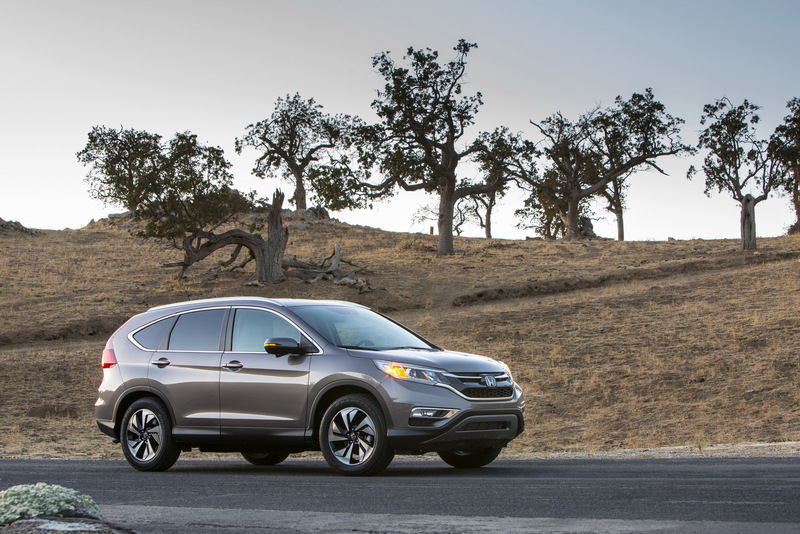 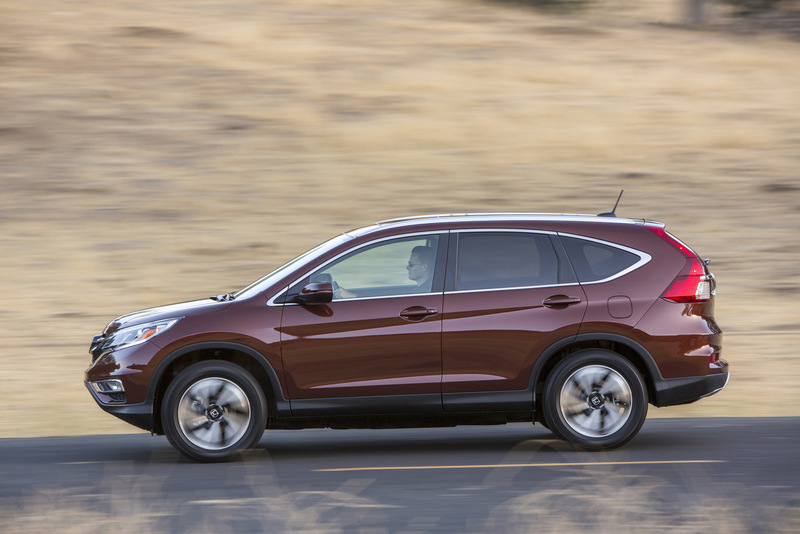 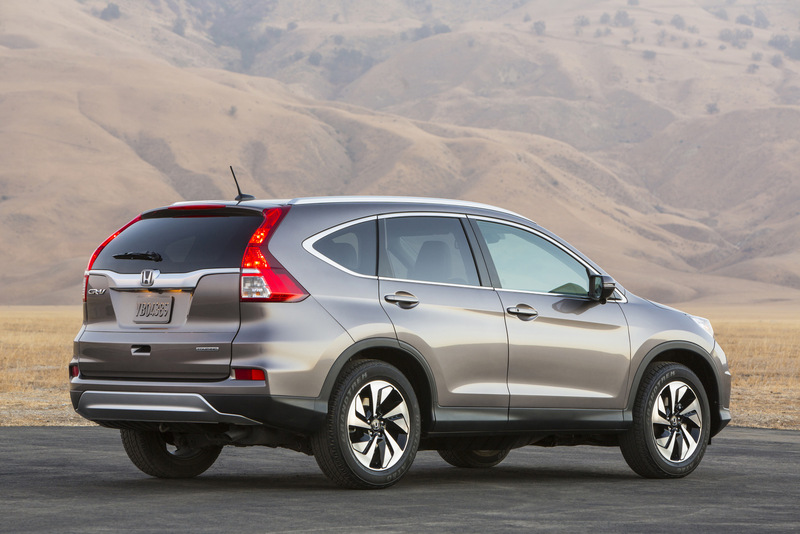 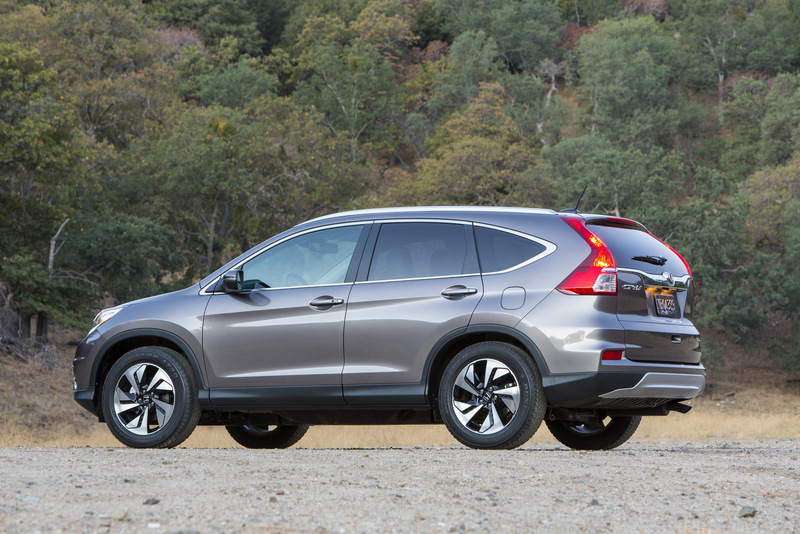 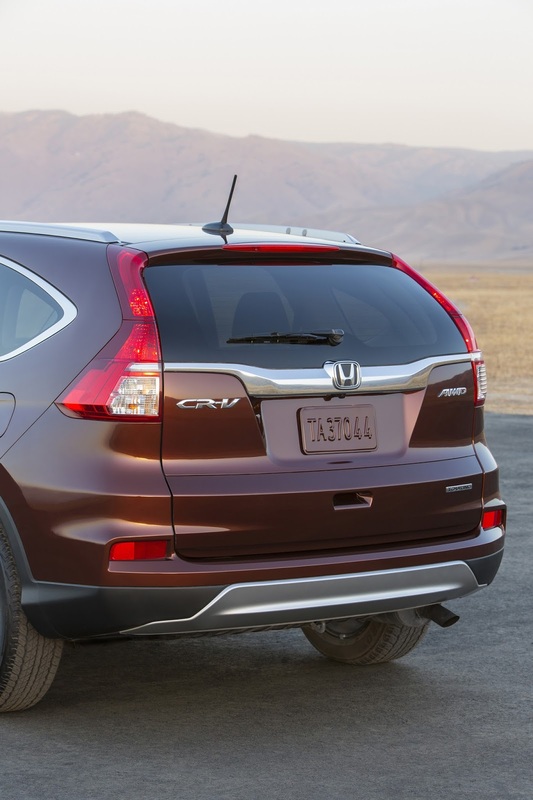 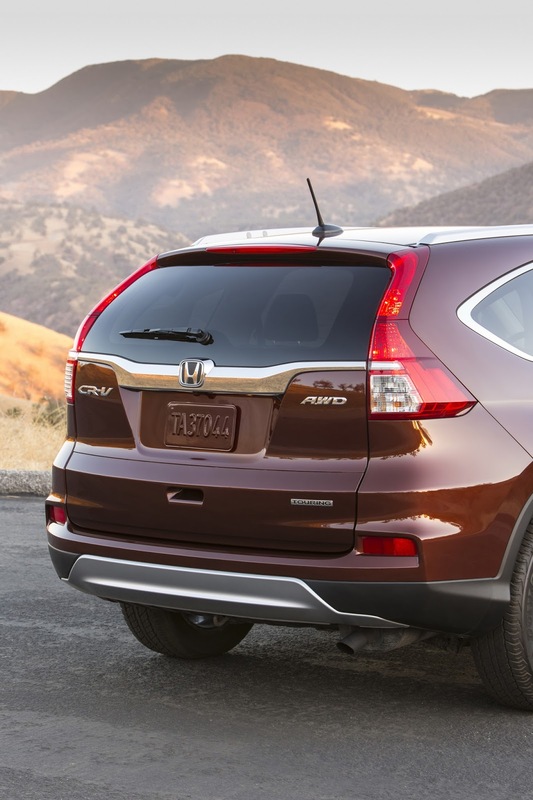 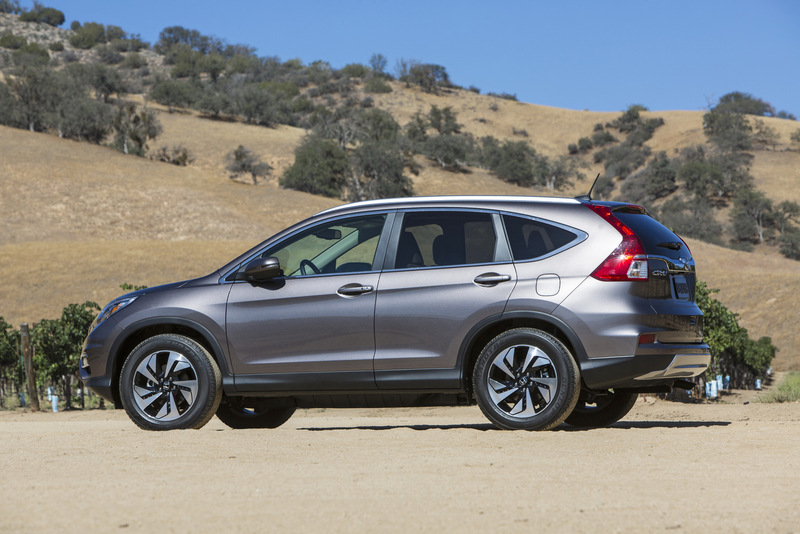 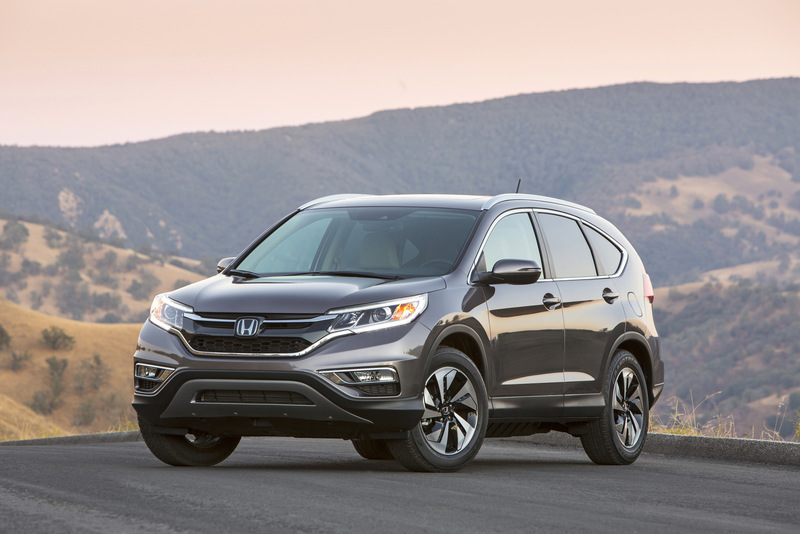 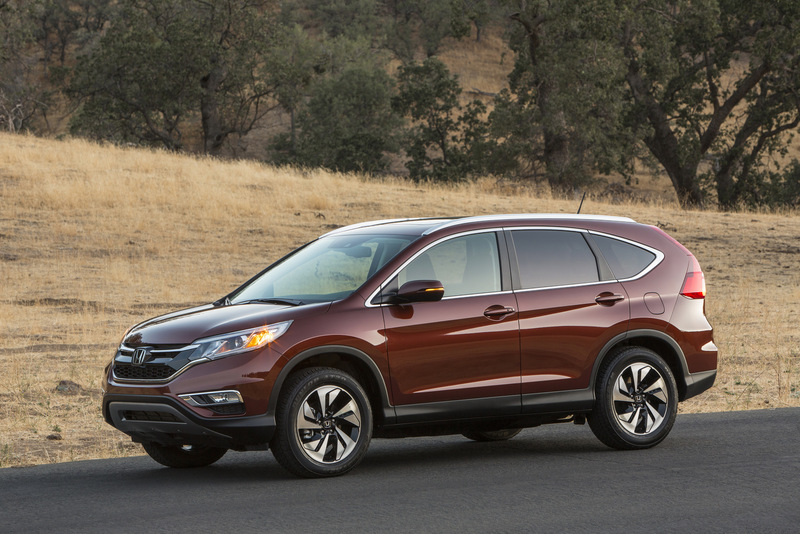 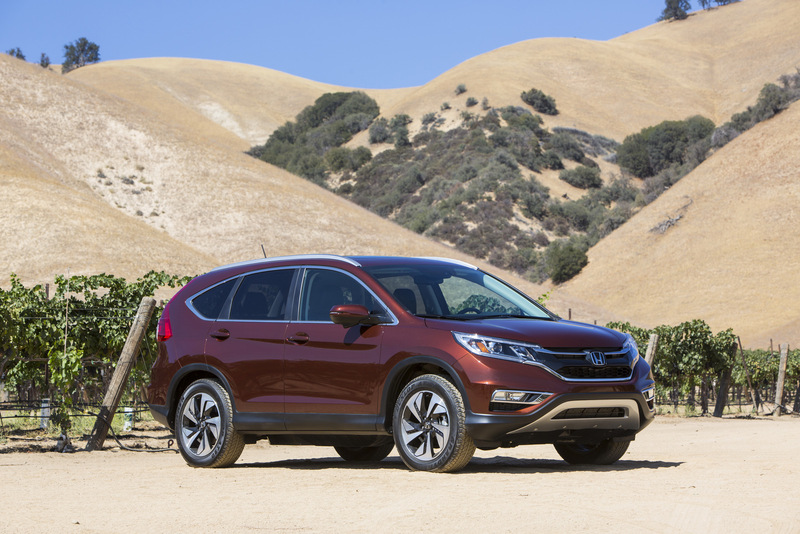 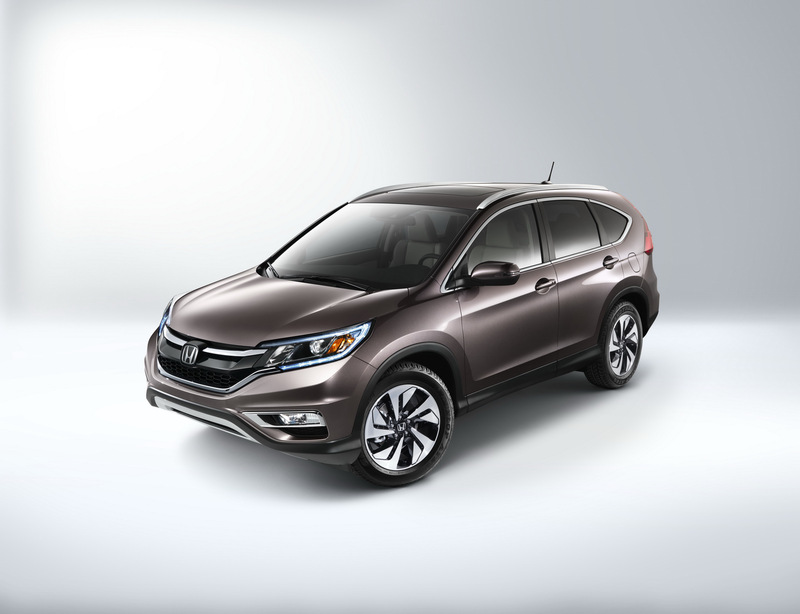 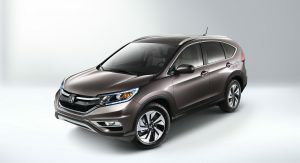 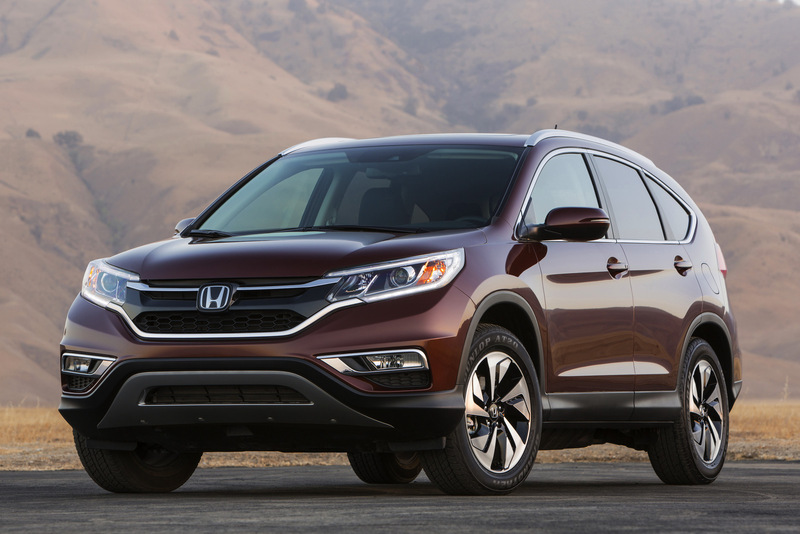 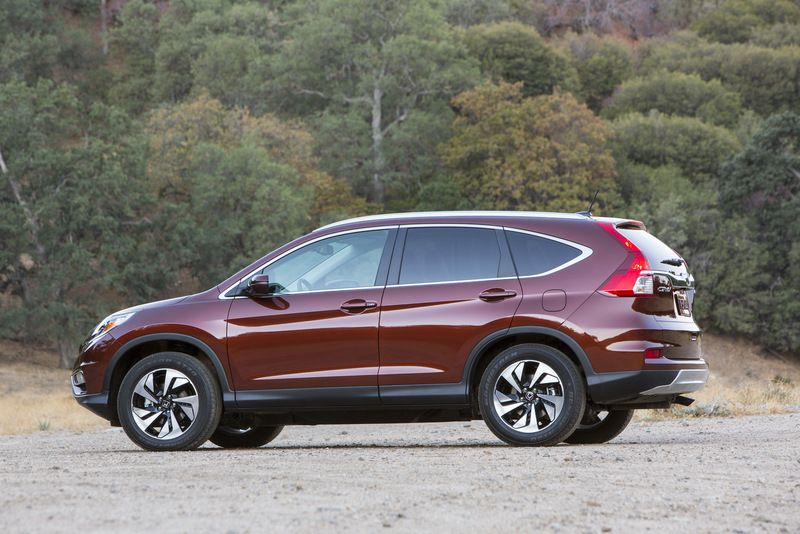 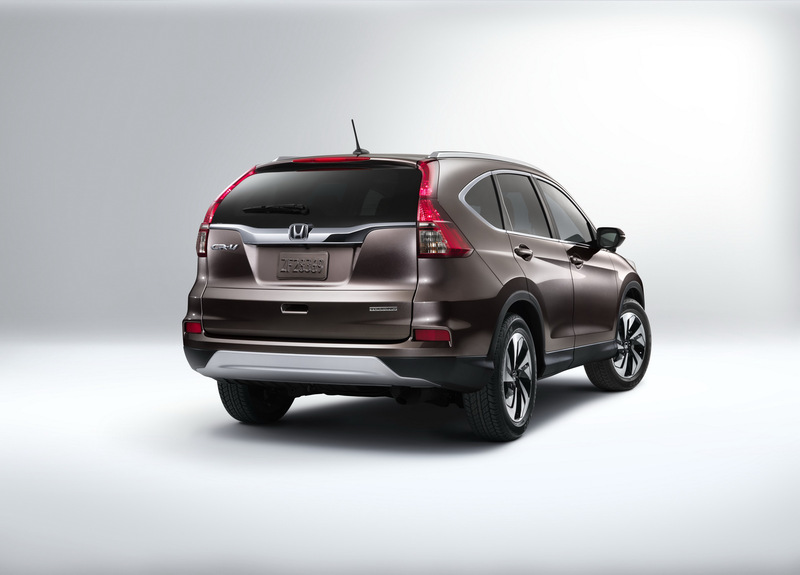 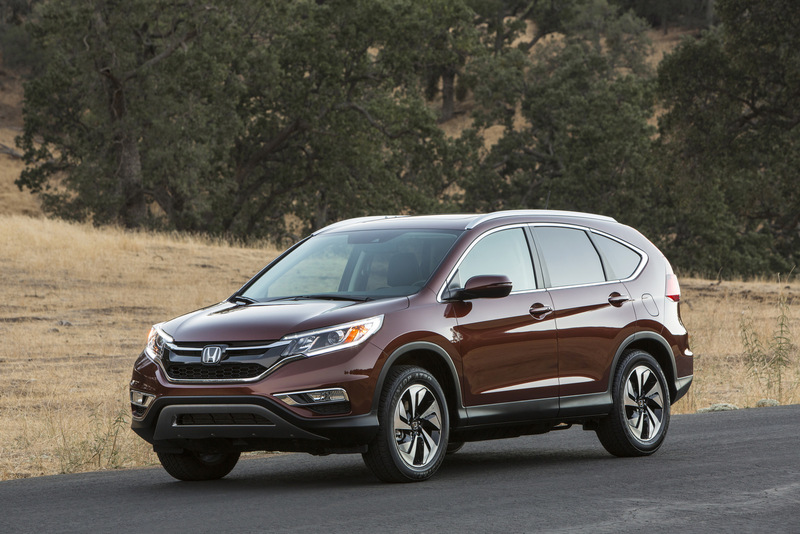 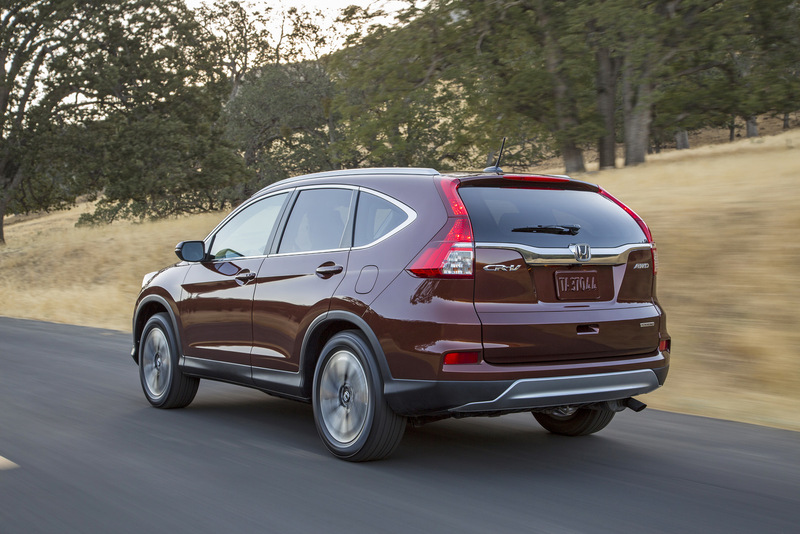 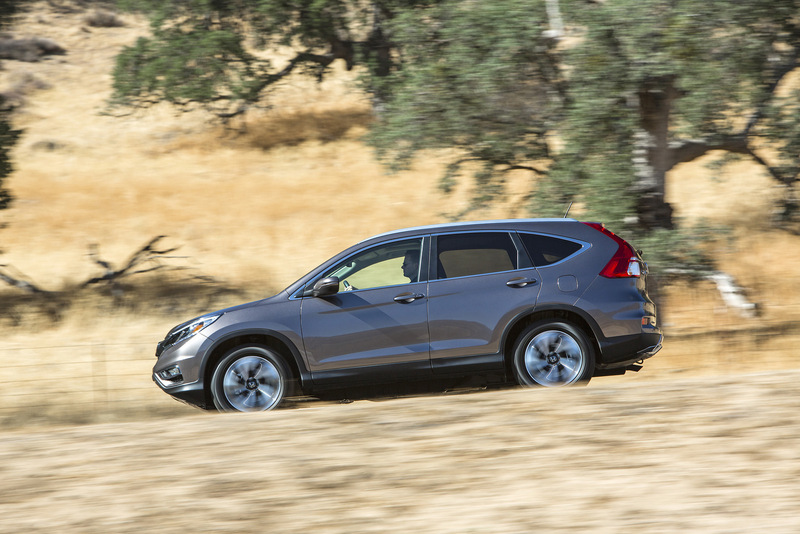 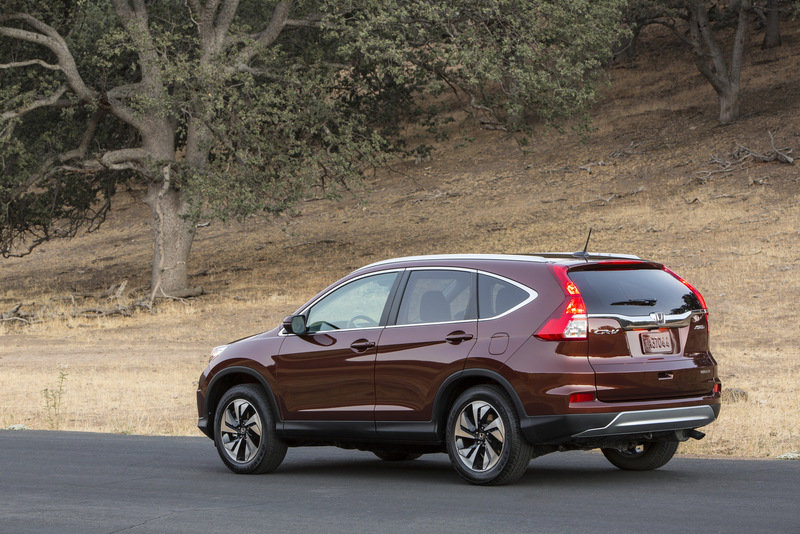 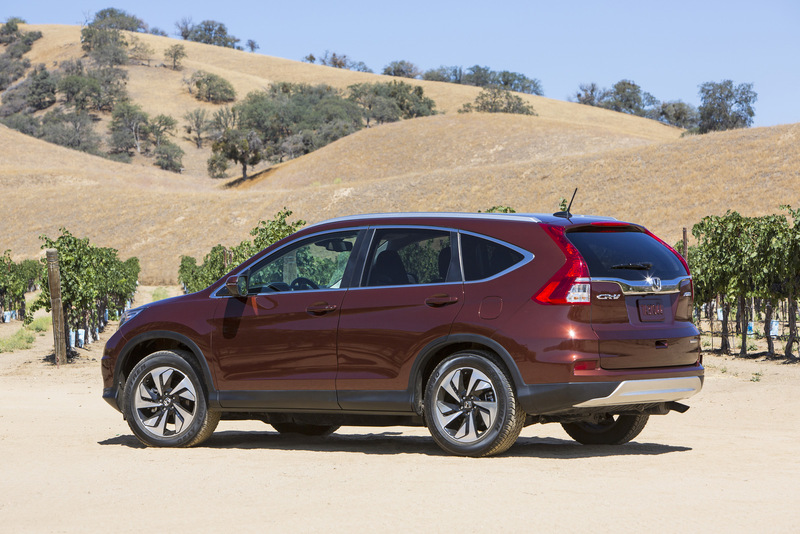 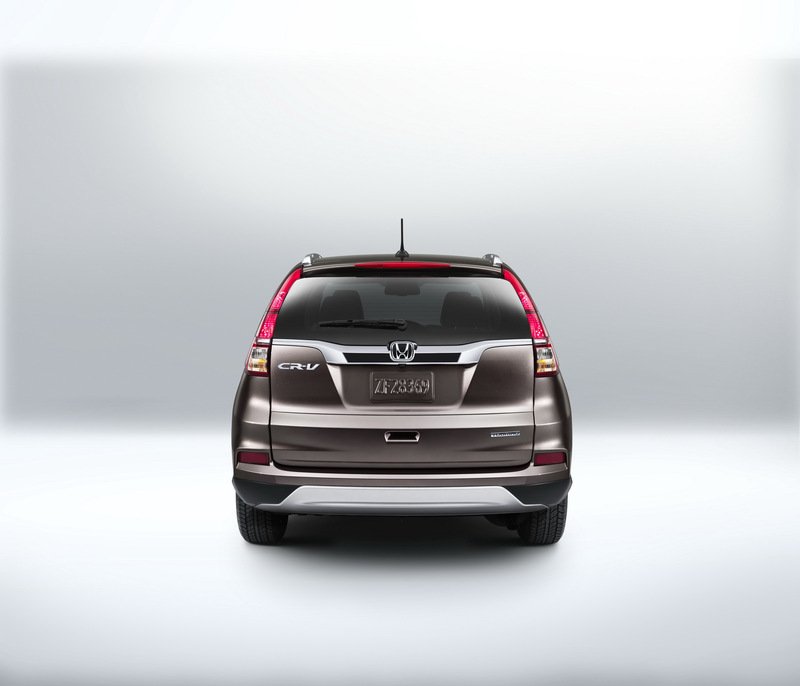 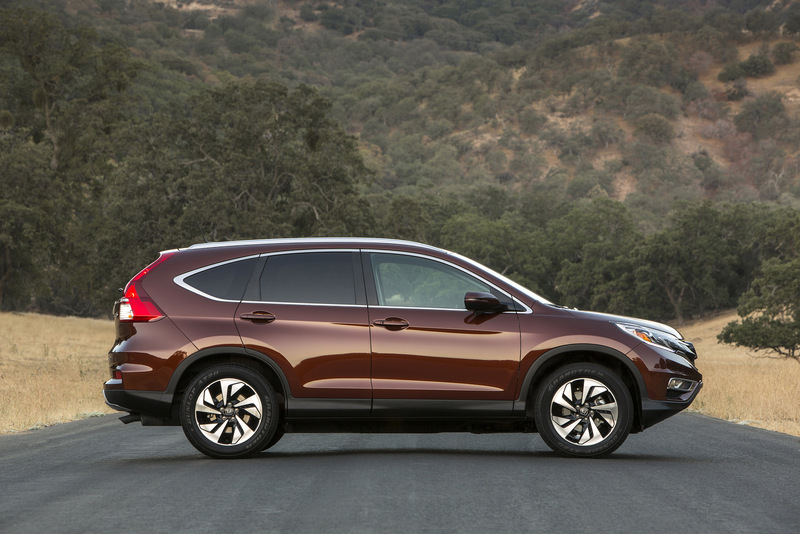 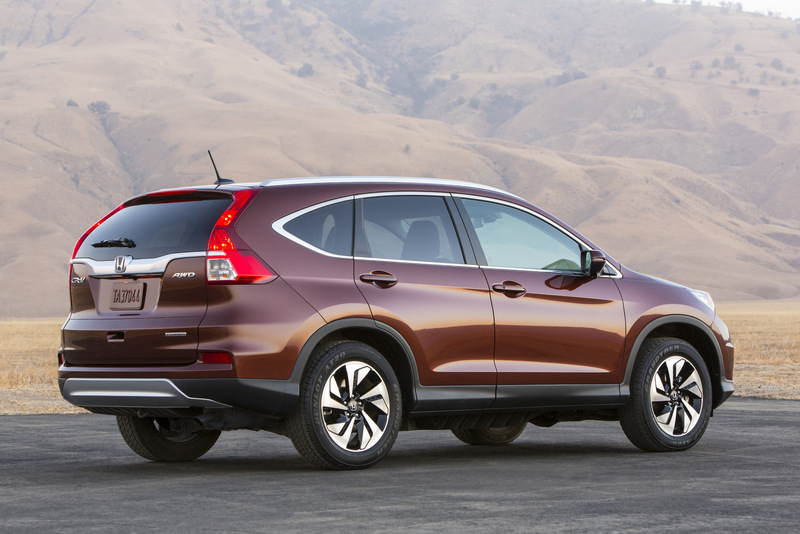 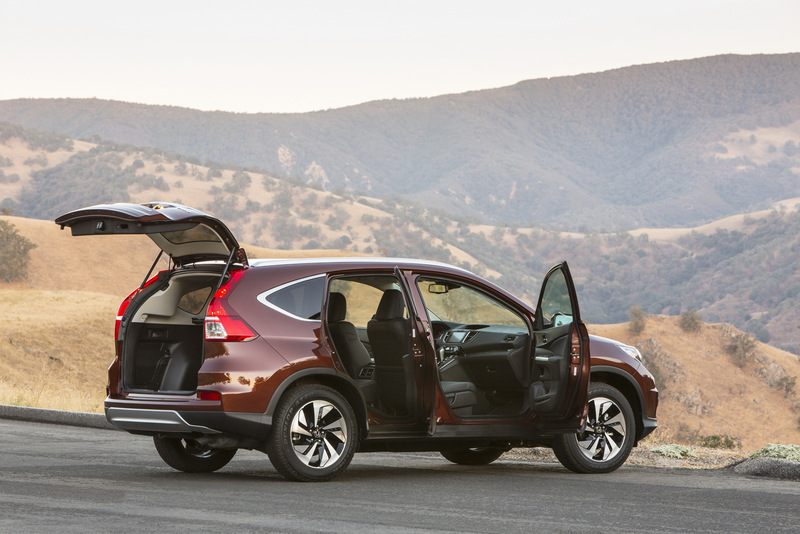 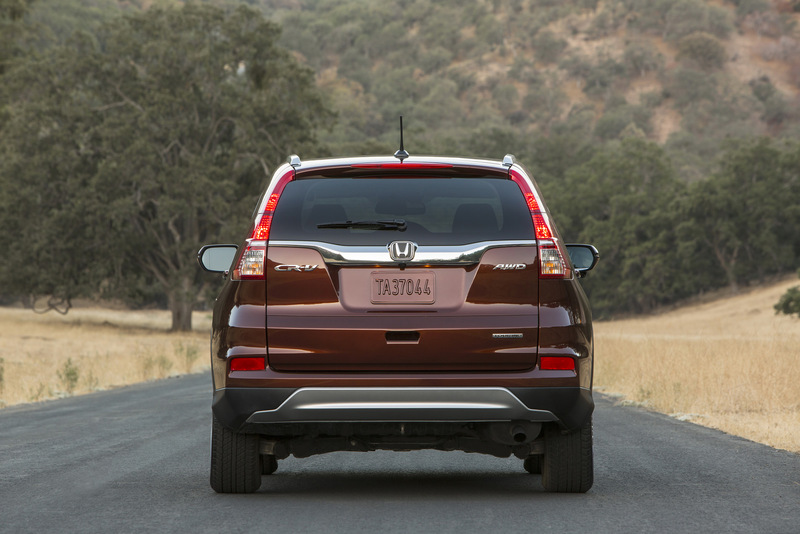 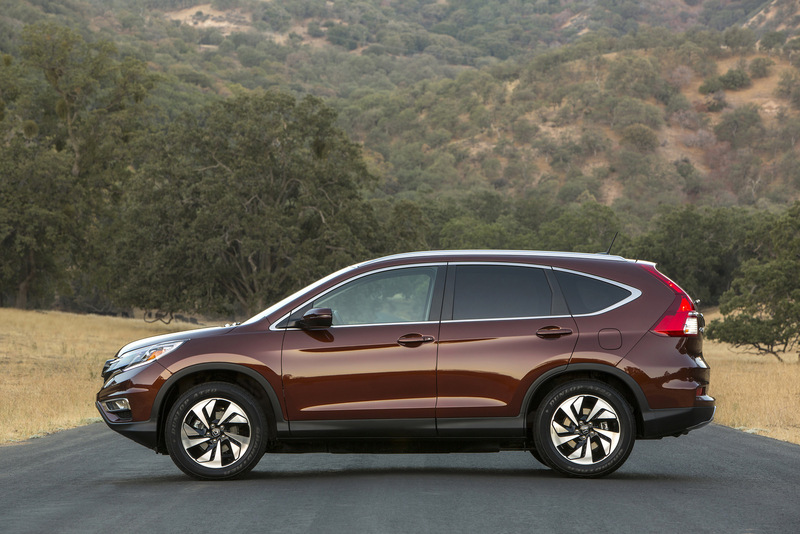 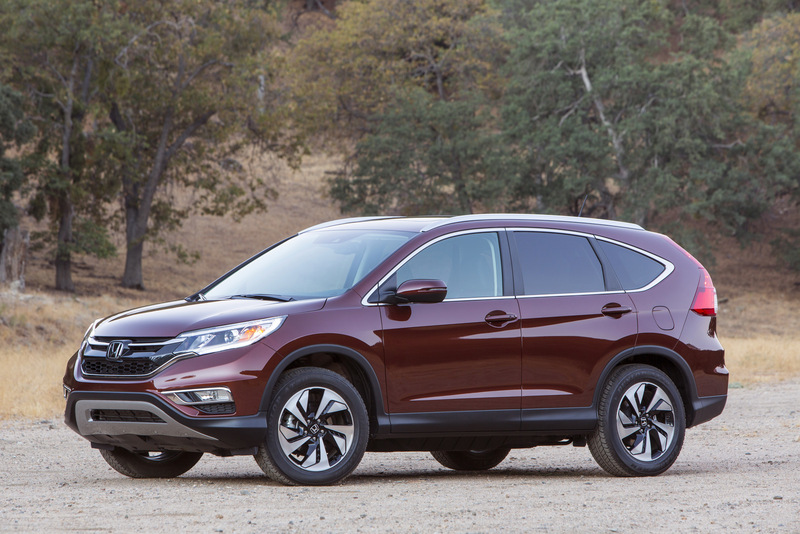 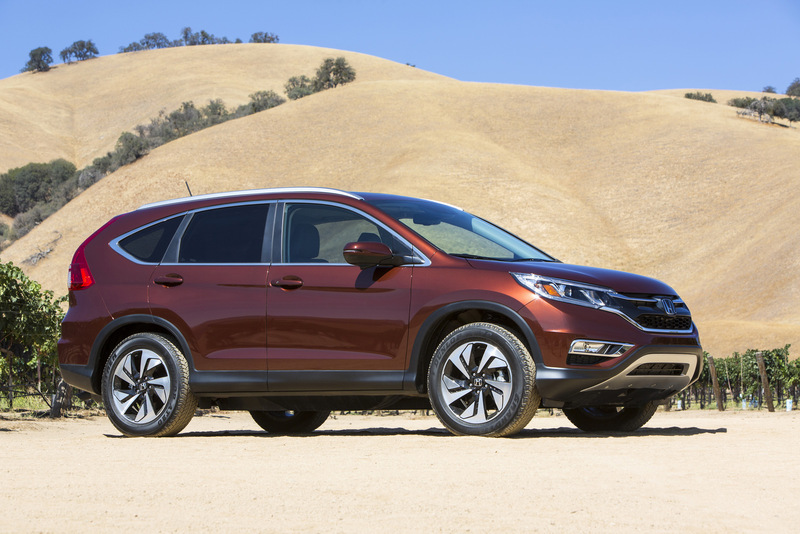 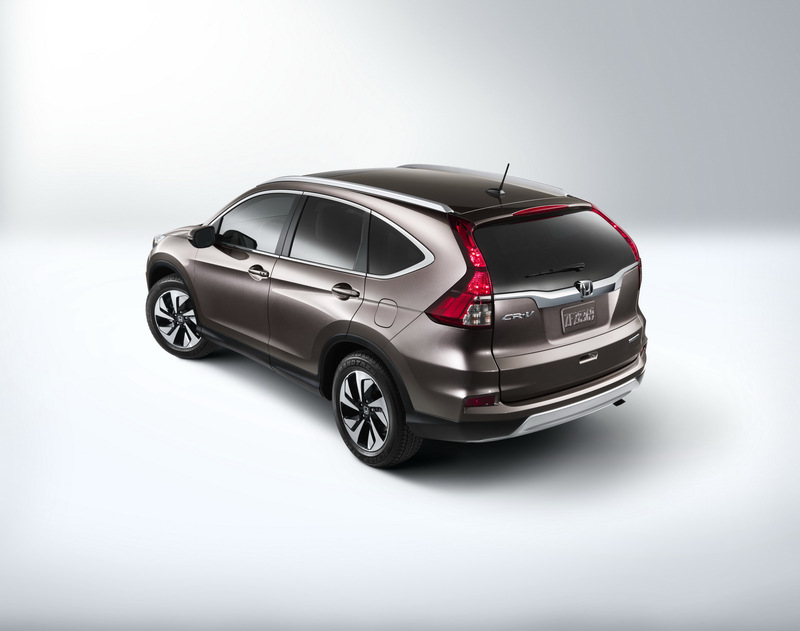 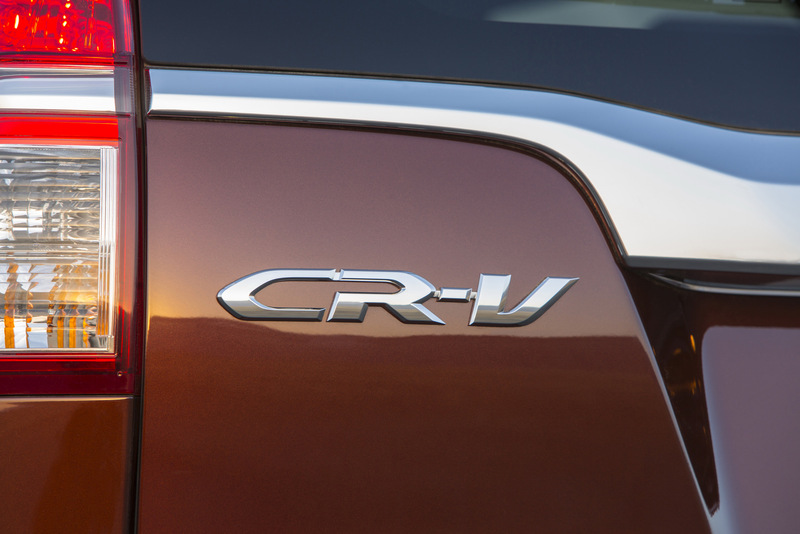 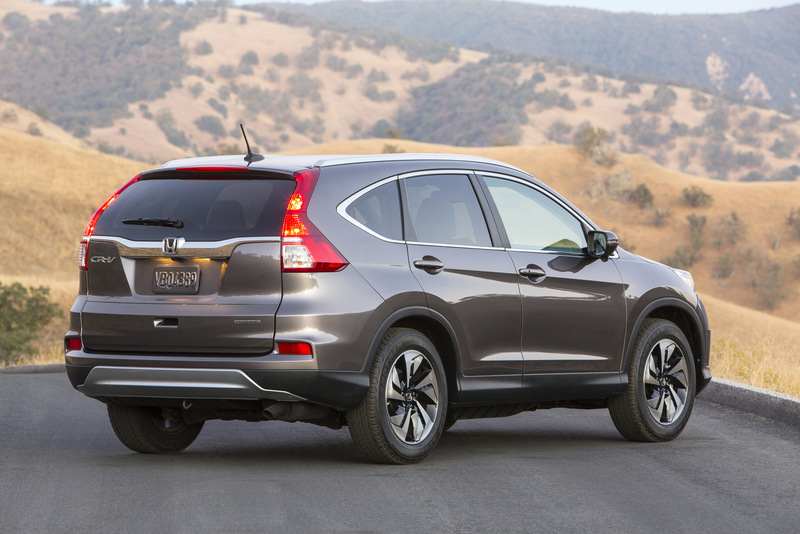 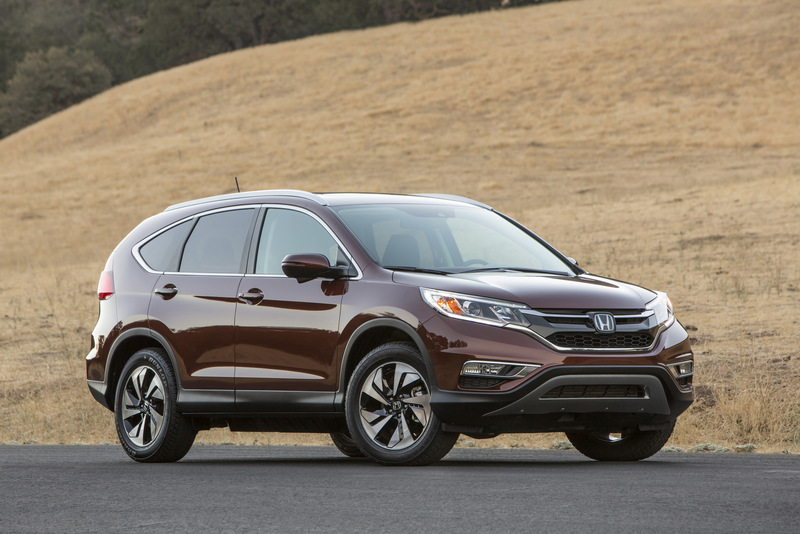 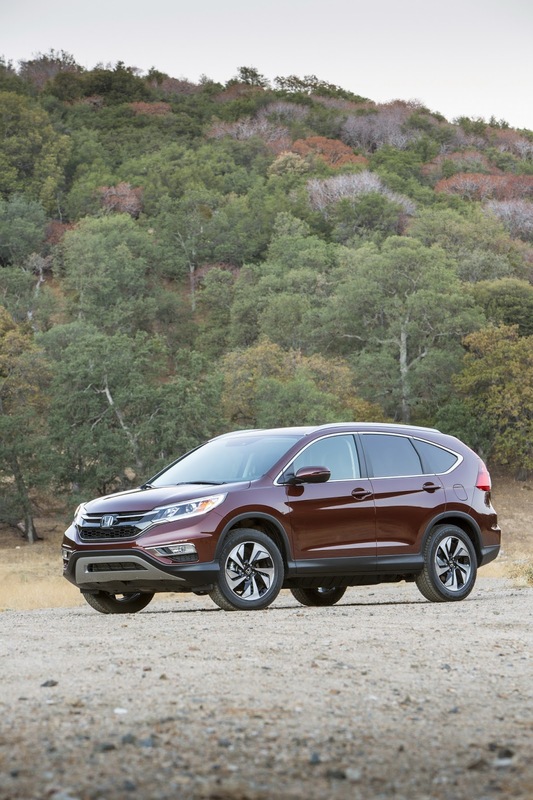 The 2015 Honda CR-V goes on sale on October 1 with a starting price of $23,320, excluding a $830 destination charge. Great MPG ! 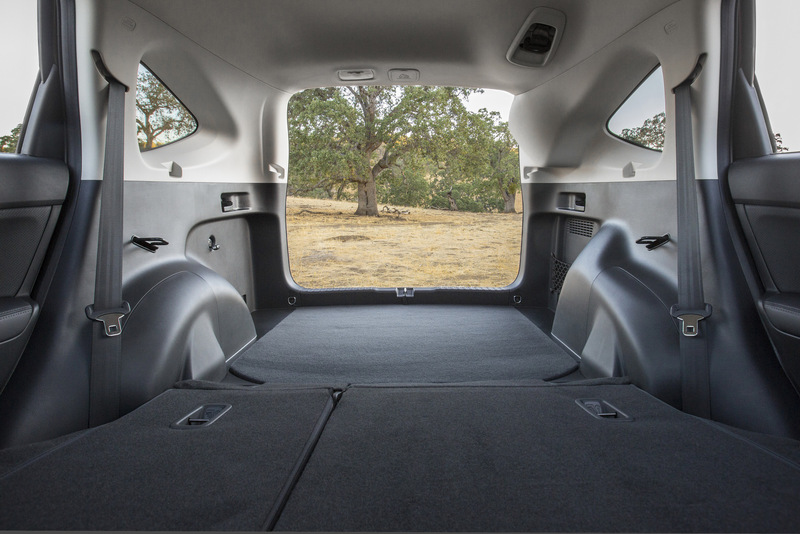 Hopefully they took away some of the rock hard plastics in the interior. 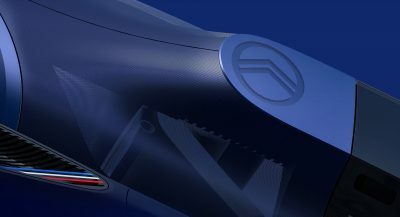 ACC has been on the higher trim already on the previous generation. 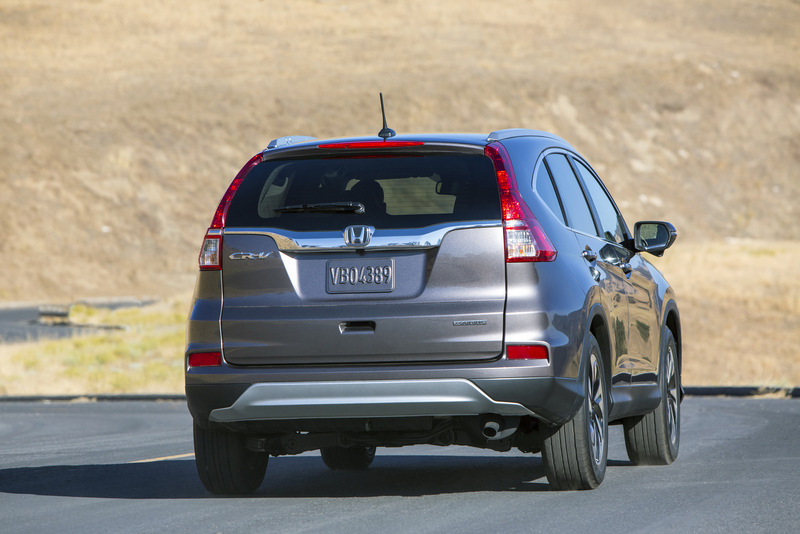 Wavy “skid plate”… what the hell ? 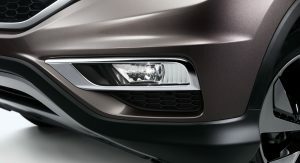 very successful facelift. 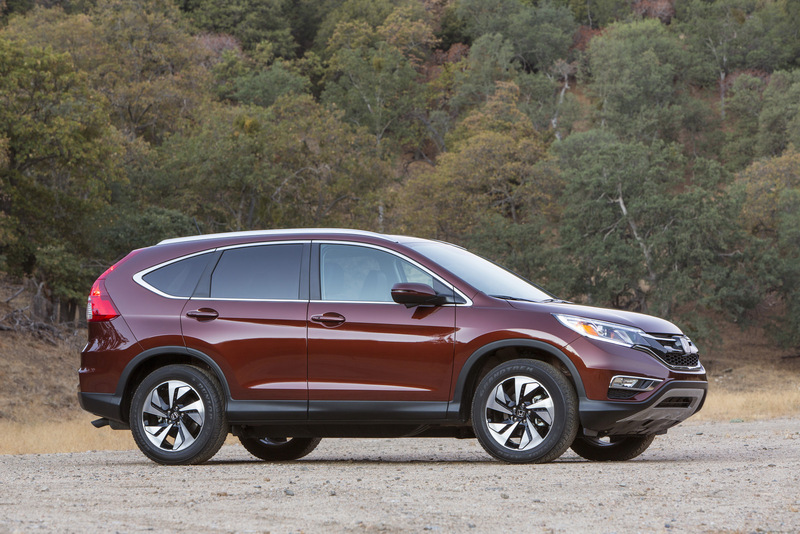 quite the improvement over the previous model. 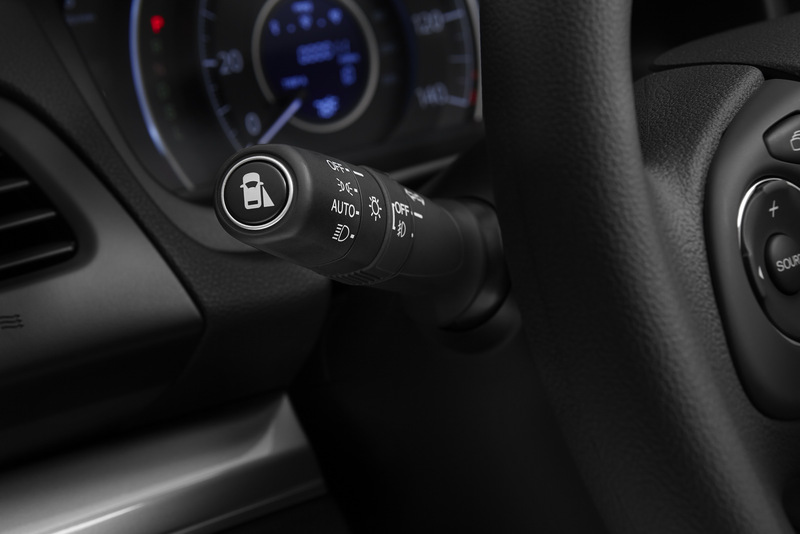 Also a Stick shift. 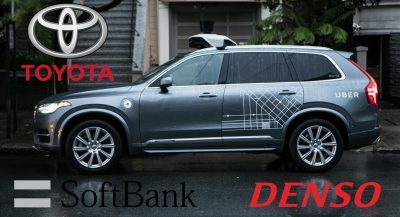 Yes many of us don’t like them or drive them. 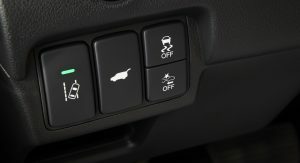 But it would be cool to have that also a V6 option. 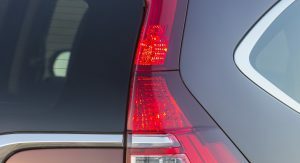 totally lame. 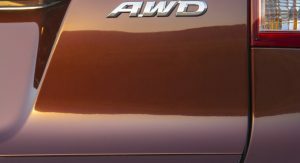 I own a 2012 and its a dog. slow as anything on the highway merges. 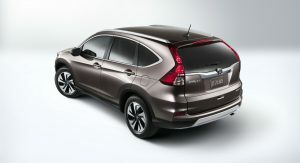 i was hoping honda would wake up and drop the Si engine in this thing, but alas, no more CRV for me. 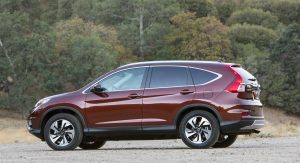 How come the European version is much hotter than this one, oh i know why, the powers that be at honda usa have no clue what could be good for them. 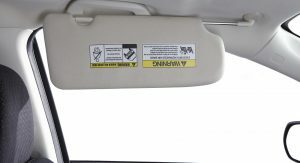 they really need to spice things up or they will really start losing business. 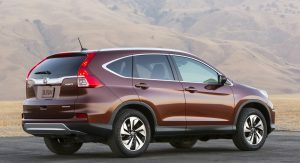 i cannot wait to see what ford and nissan have coming with their new versions of the murano and edge. 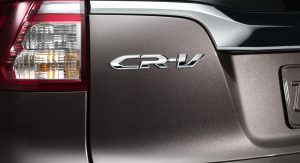 if the crv had a sport or Si version, i think they would sell much better that putting a new snout on the car and calling it a day. 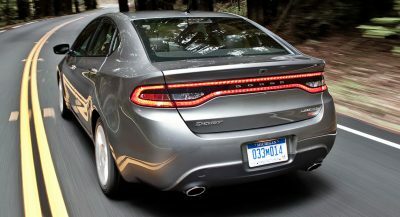 hash tag, big disappointment. 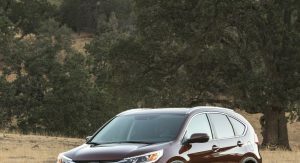 I Totally agree with you dude. 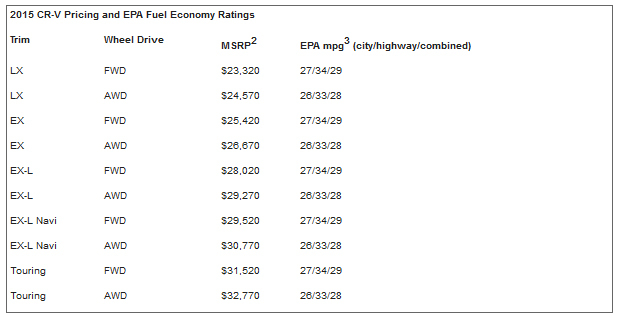 But yes they need new power trains and need to spice things up. 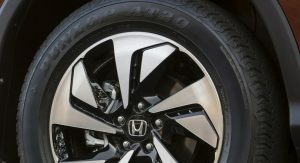 Honda wasn’t what it used to be they’re changing. 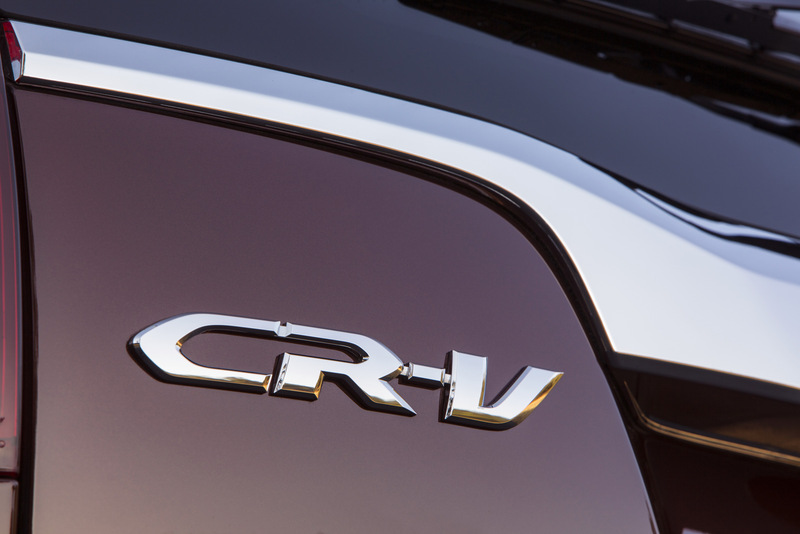 The Cr-v is a comfortable runabout vehicle it isn’t supposed to wow us. 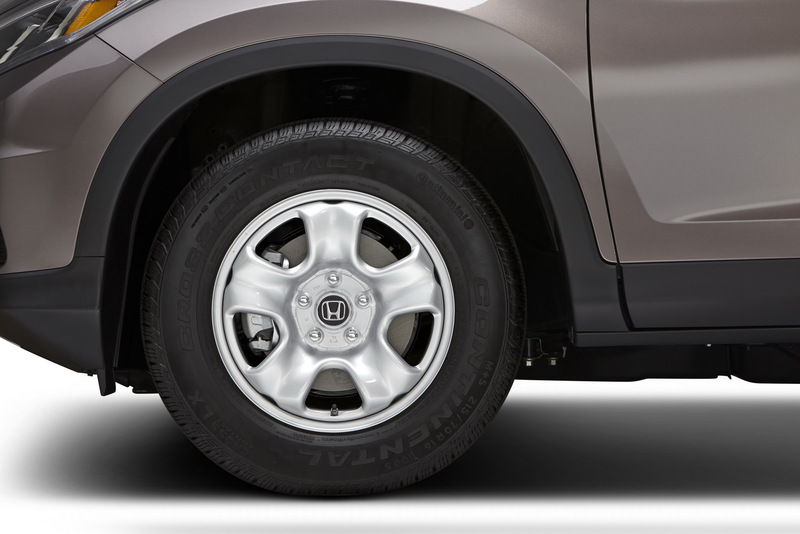 I test drove a 2014 Lx 2wd polished metal metallic it was pretty peppy to me. 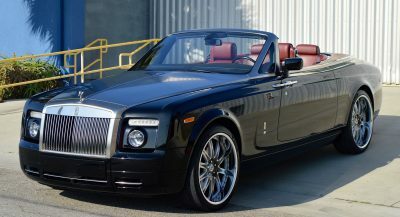 I guess we have different tastes. 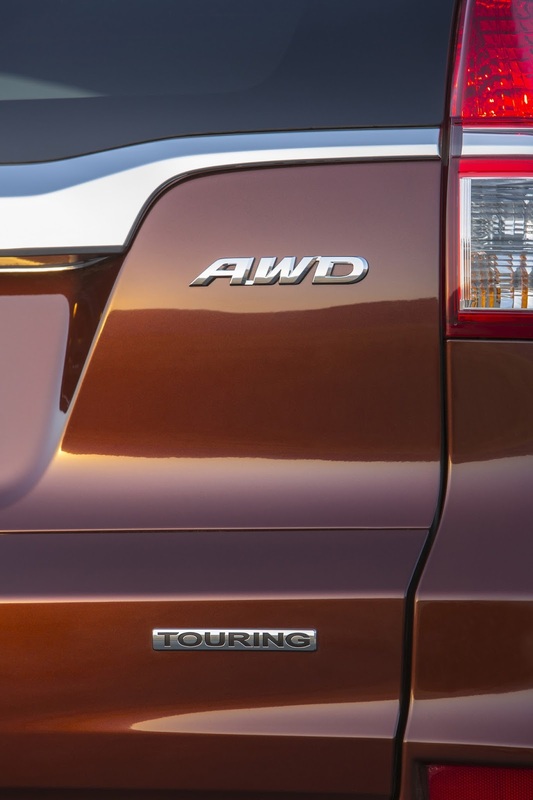 But stick with your brand. 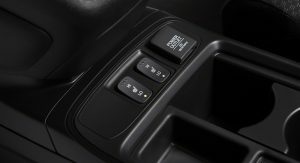 Just because they’re stupid enough not making the changes you want or most of us. 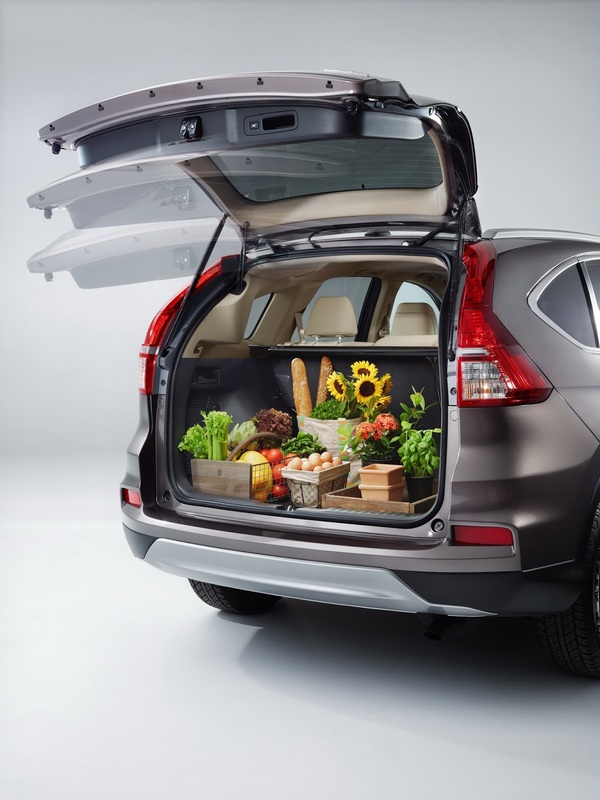 Just appreciate what you have. 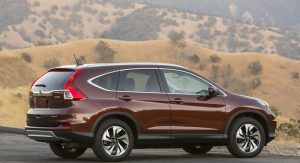 The European version is mostly Diesel’s from what I understand, yes you can have a Stick over there, which the last time Honda sold manual CRV’s they only sold a handful the result being that from the redesign for 2007 on it’s been Automatics for us. 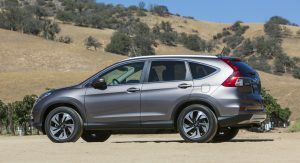 The CRV really has always been a practical but slightly conservative choice compared to the other offerings such as the Rav4. 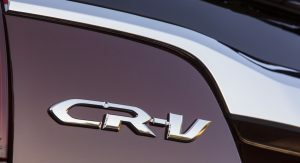 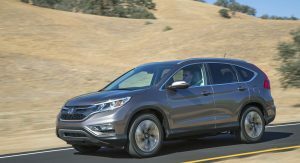 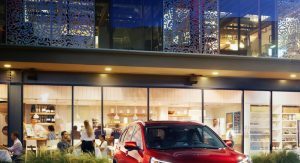 Acura sells a sport version of the CRV but for a large number of buyers the CRV does what they need. 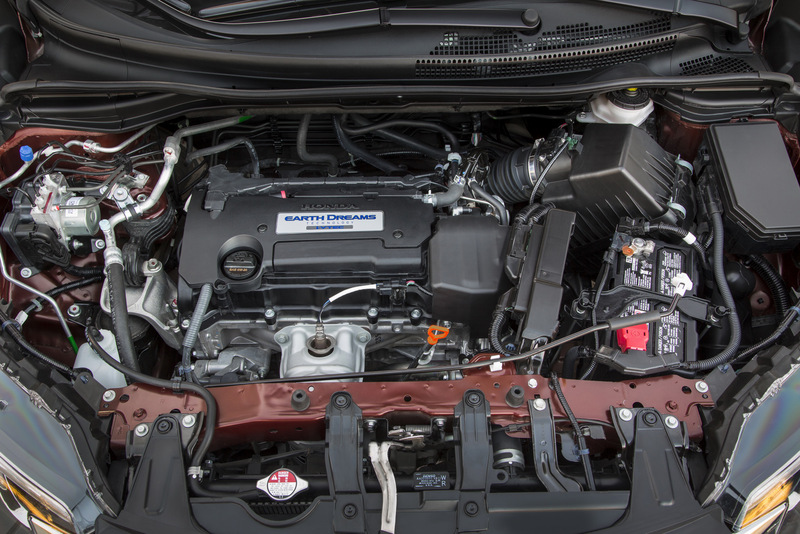 Ecoboost is great if you really want but every person I know who owns a CRV bought it for the versatility and reliability. 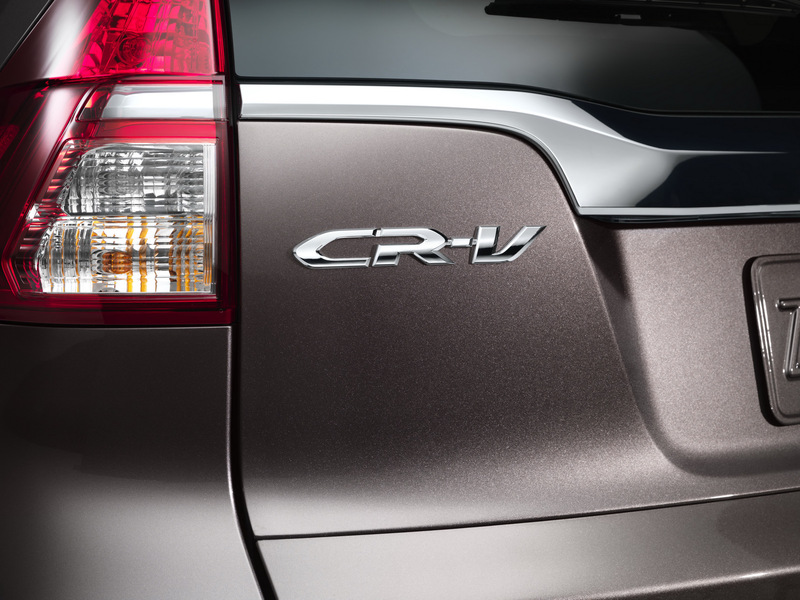 The V6 Rav4 sold pretty well at first, later it just wasn’t enough to continue for the next generation. 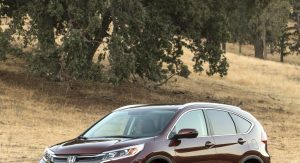 So you forgot to test drive it before buying it?